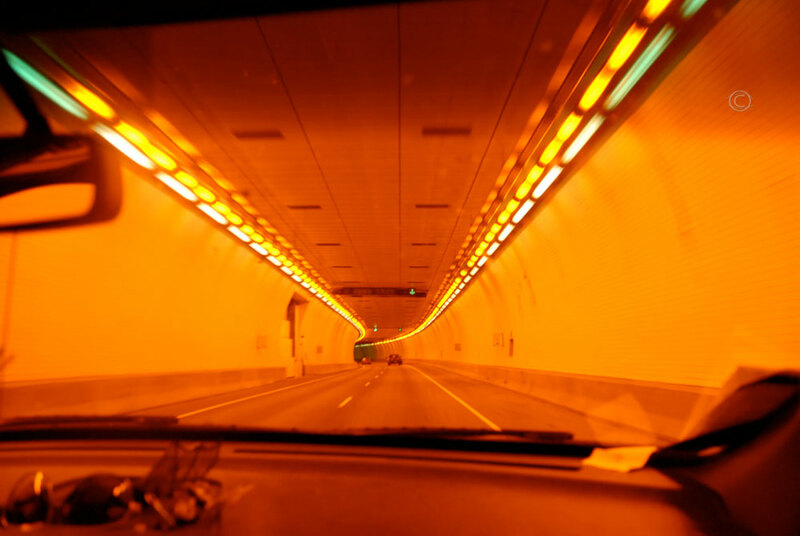 The sputtering blast of engine brakes jolted me from sleep. 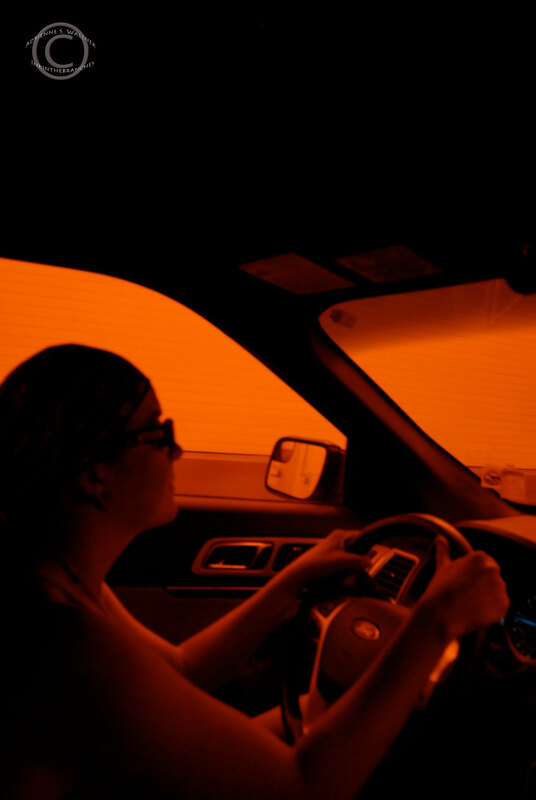 The car windows beaded with condensation from our sleeping breath and I realized how warm I was. 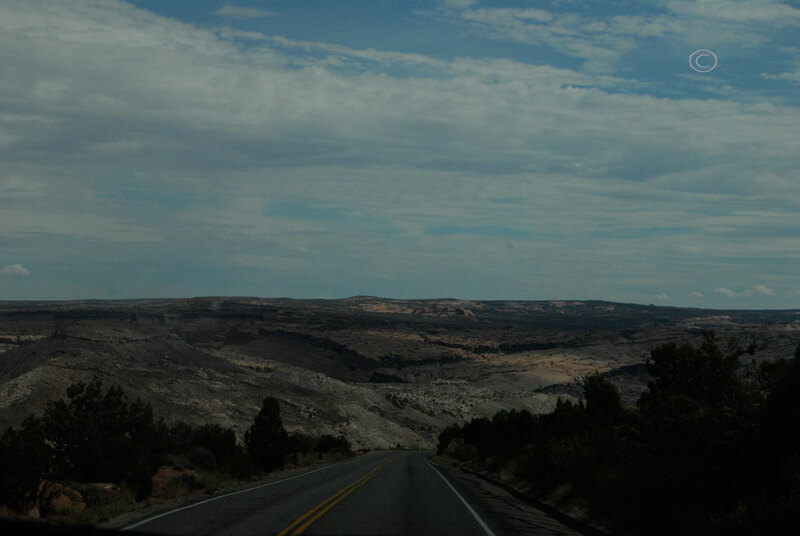 Our mobile bedroom had become a steam cooker on wheels, poaching our sleep and sweat-saturated bodies along the side of the highway. 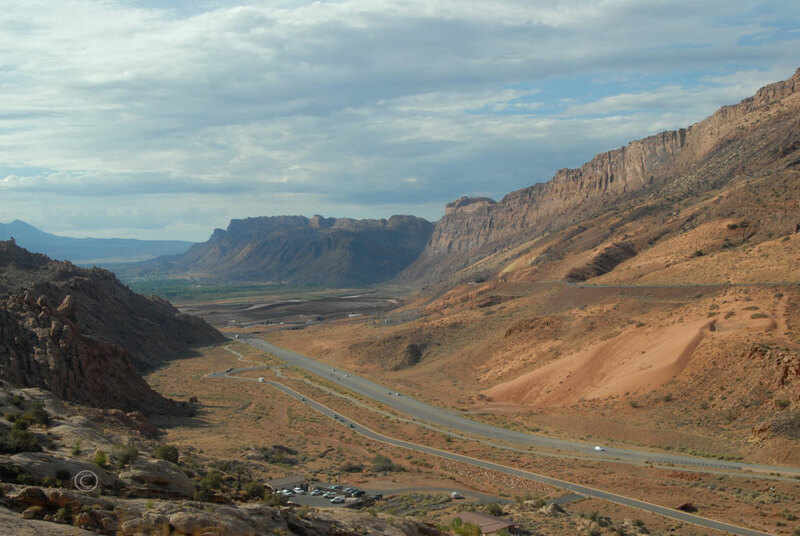 I rolled over and opened the door to find myself looking down on a barrage of semis, trucks, and other anxious morning traffic racing along Utah 313. 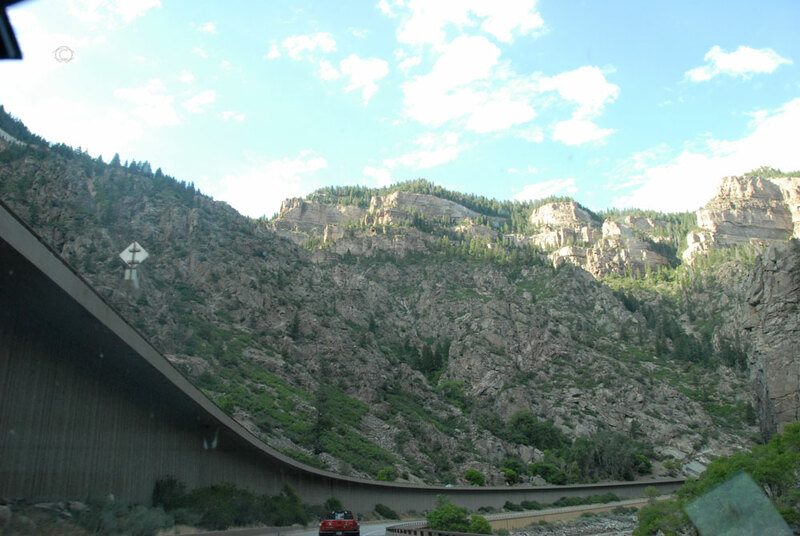 The wayside where we pulled off to sleep was paralleled by the busy highway on one side and to our surprise, a state bicycling trail on the other. 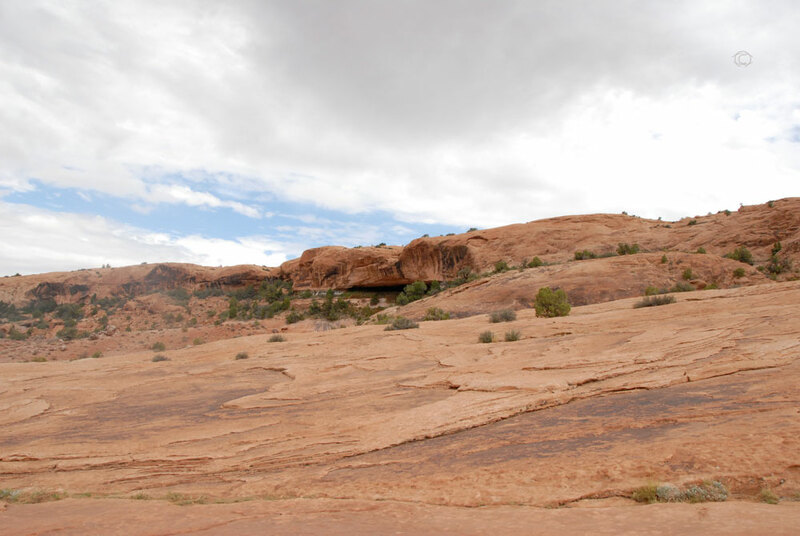 Ambitious early morning bicyclers glided past our car and stared curiously at the hot, groggy, bed-headed, mess of a girl gazing bleary-eyed up at the red rock walls that bordered the trail. 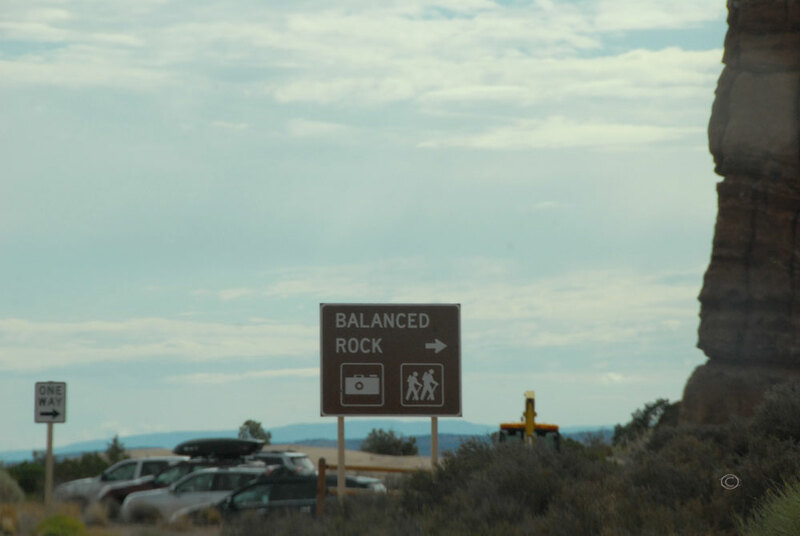 Yikes. 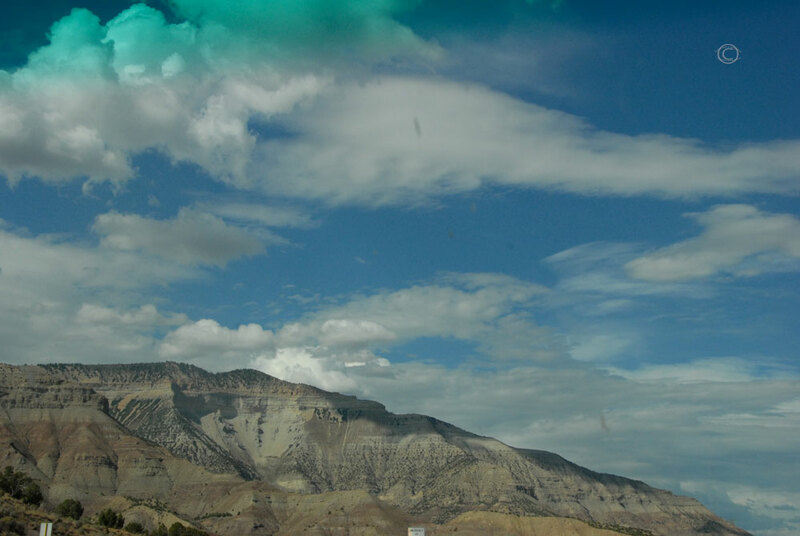 It was 8:00 am and 81 degrees as we resituated our car for travel. 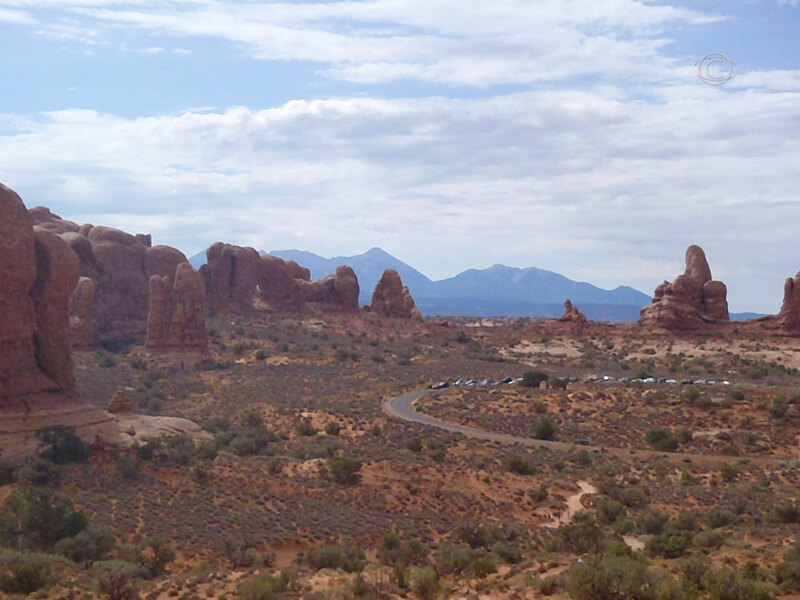 We took a quick ride into Moab to grab coffee and breakfast to go. 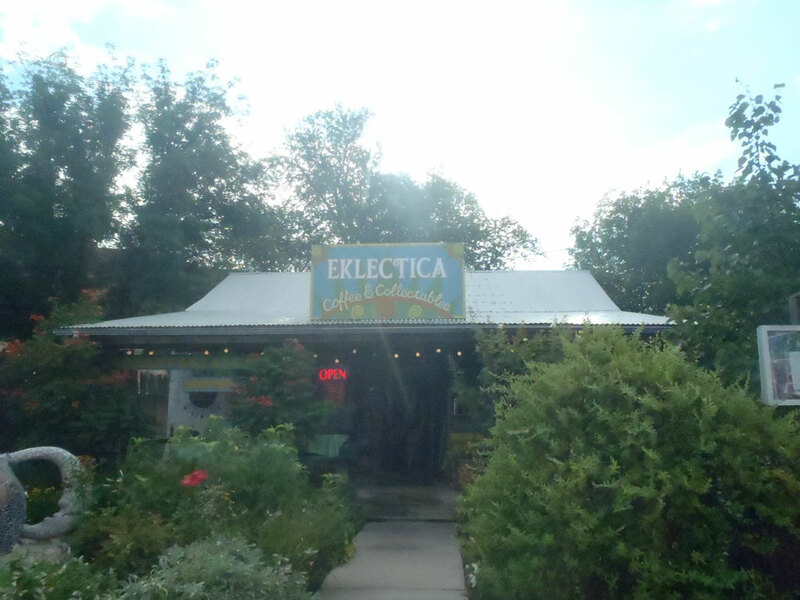 In addition to delicious egg sandwiches and coffee, Eklectica Cafe has a unique array of jewelry and collectibles for sale. 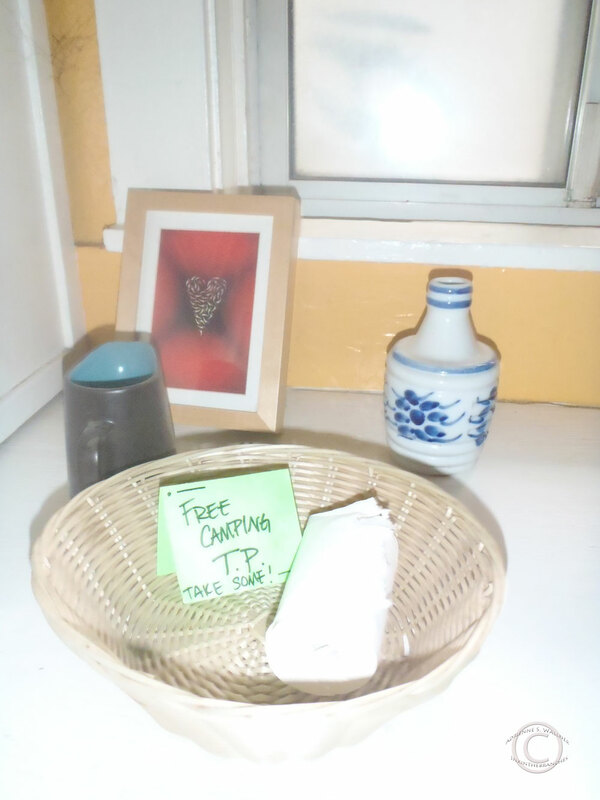 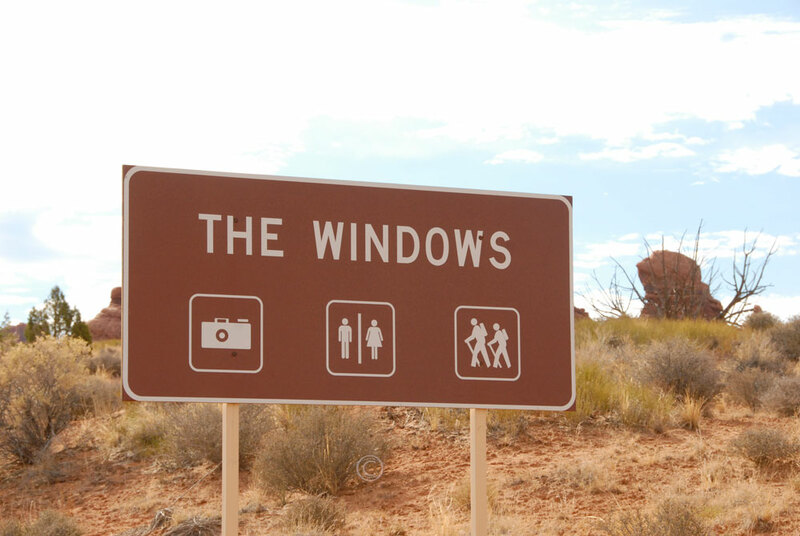 They also seem to know the needs of their tourist clientele. 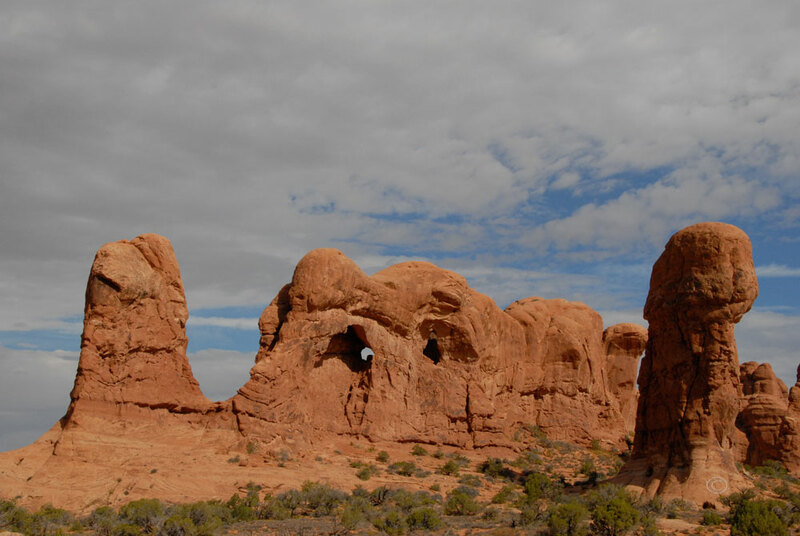 Arches displays a fantastic collection of sculptured rock vistas. 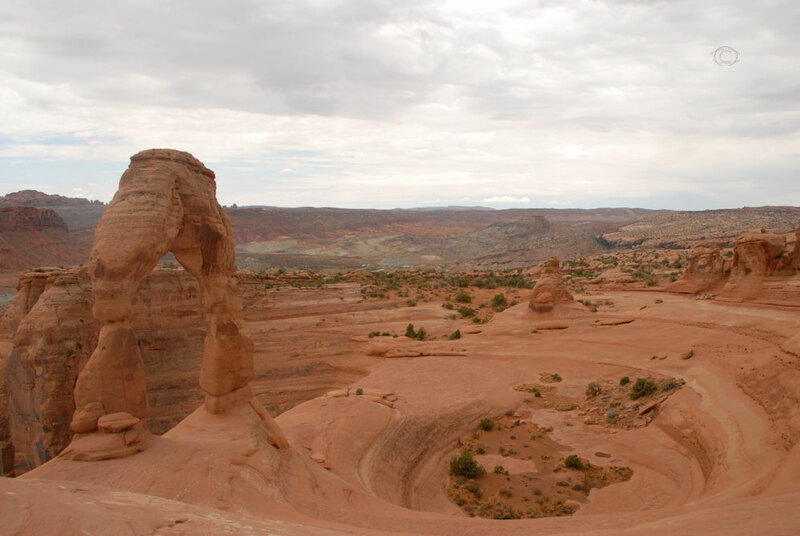 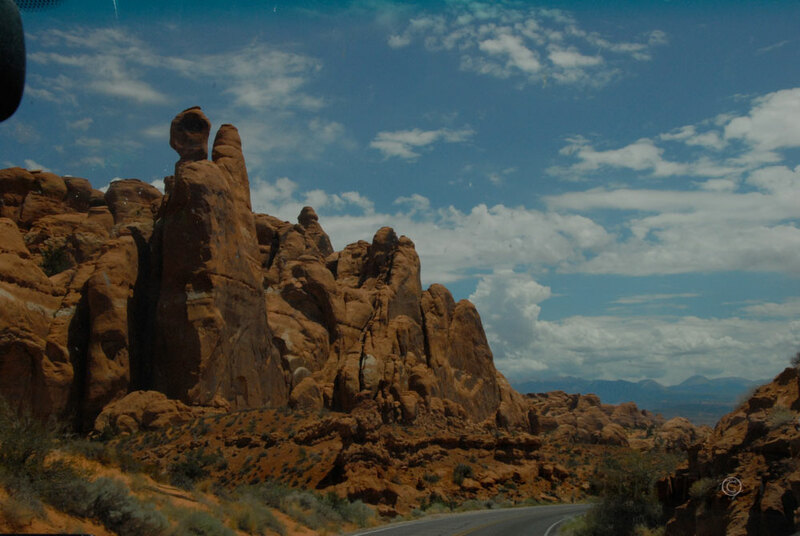 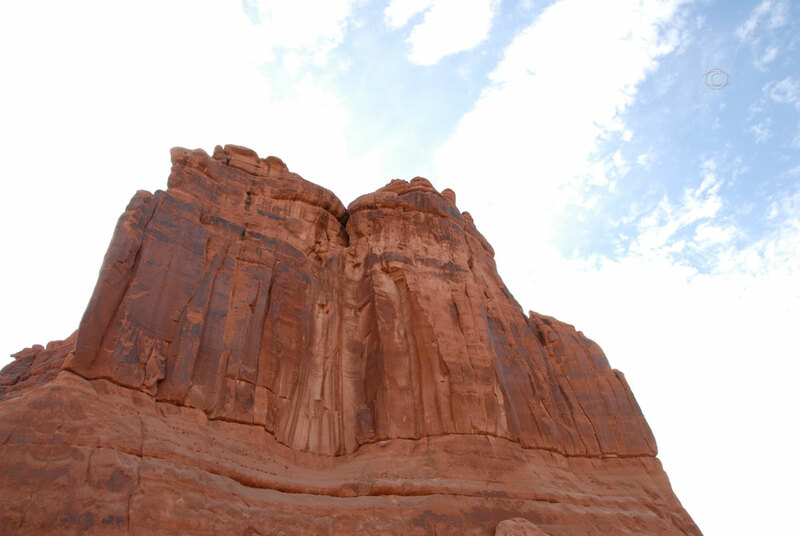 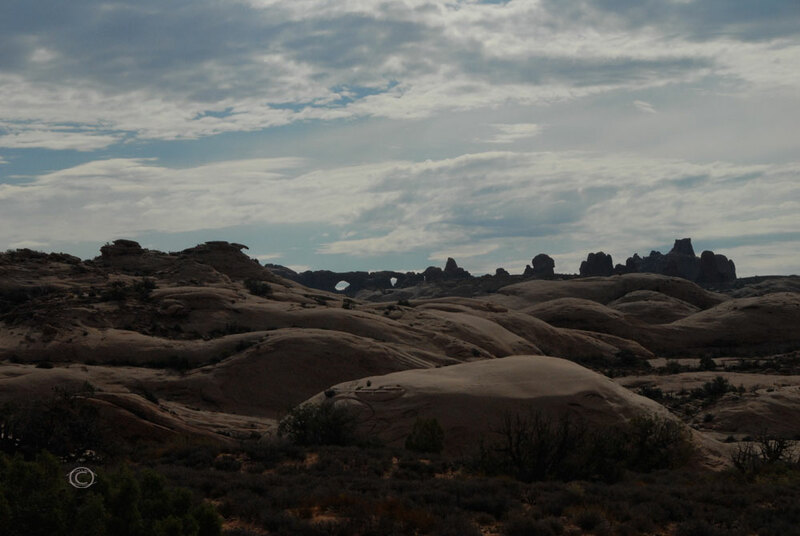 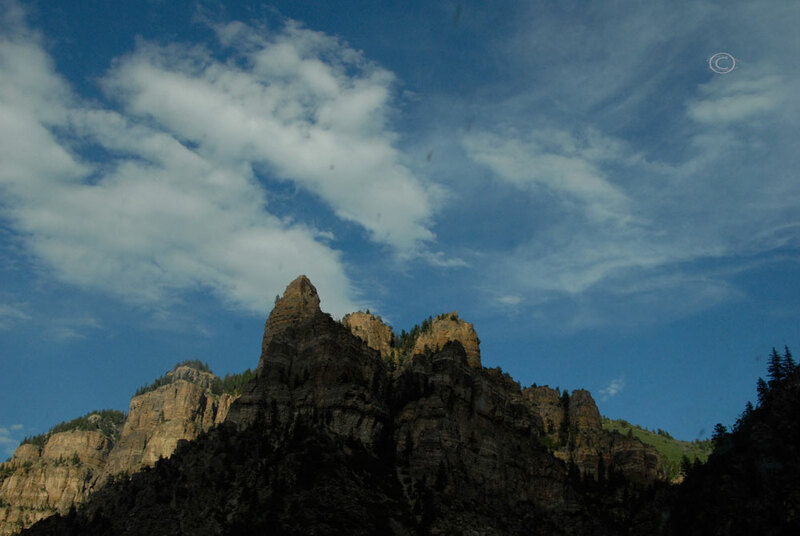 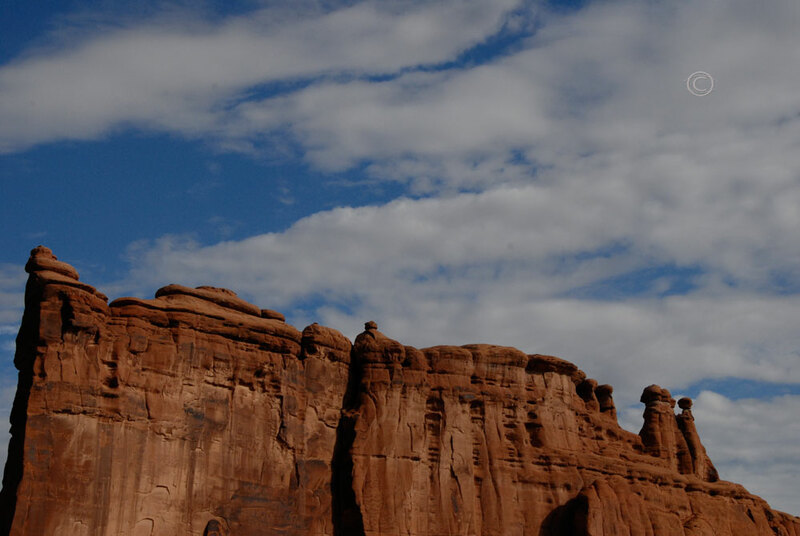 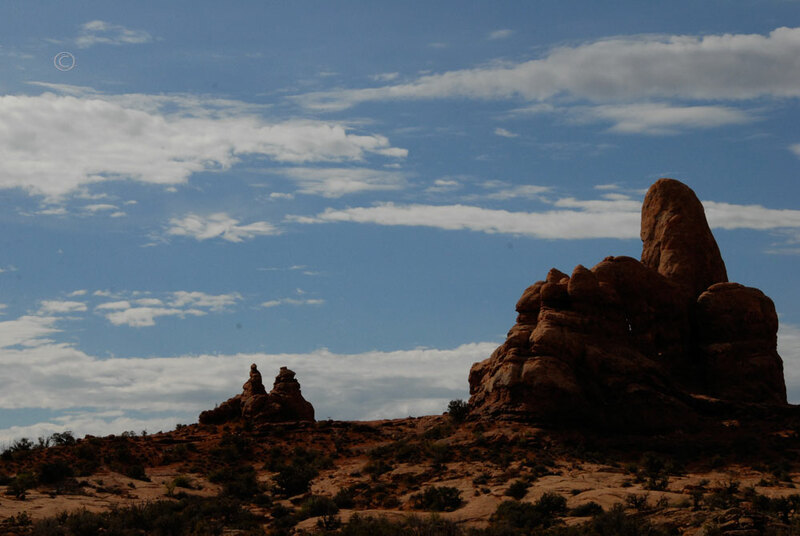 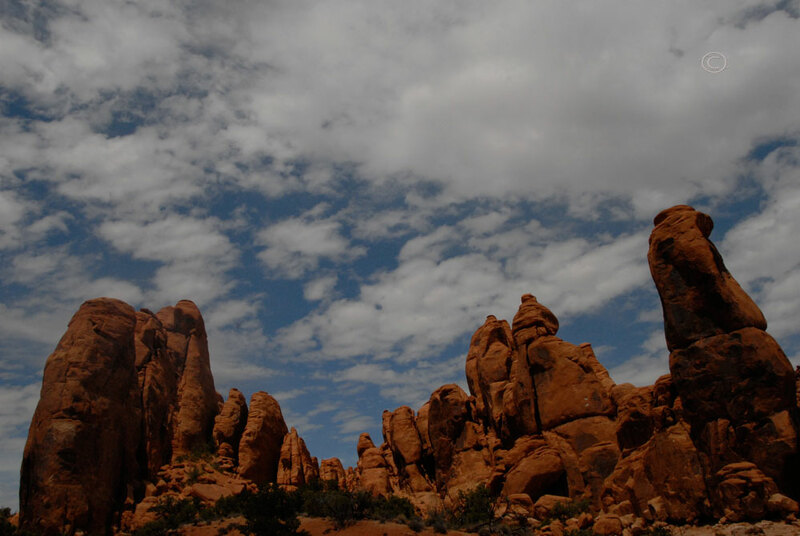 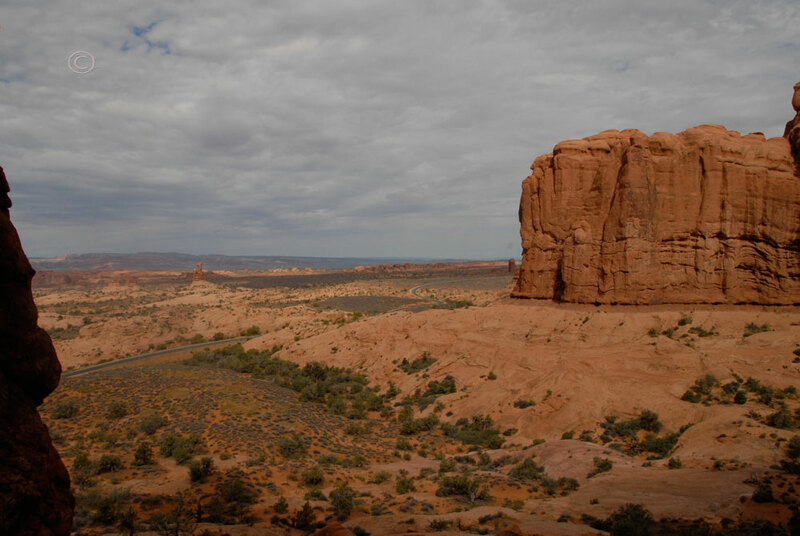 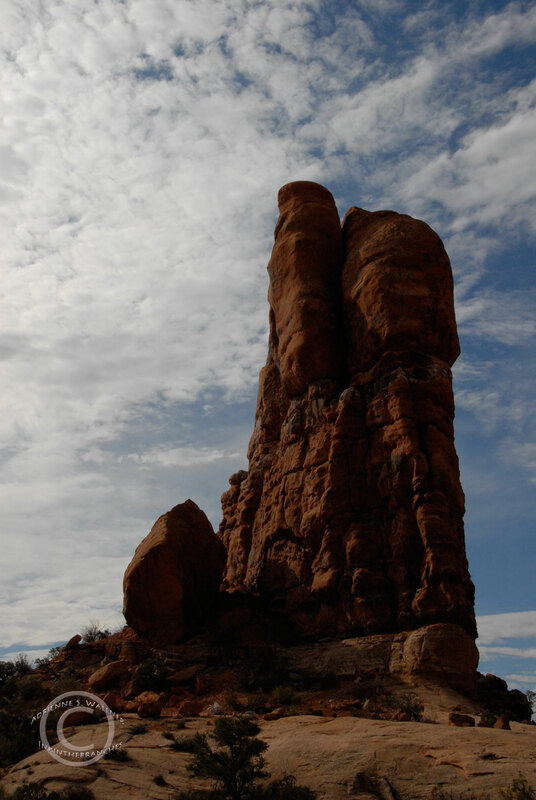 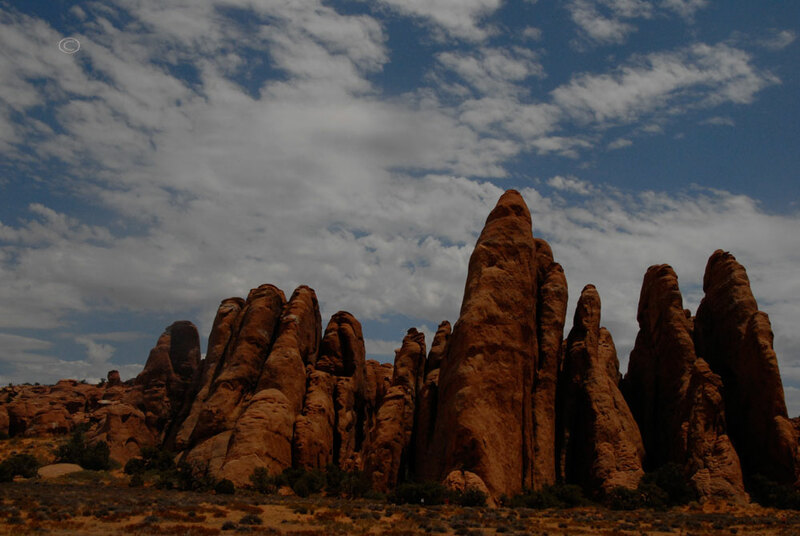 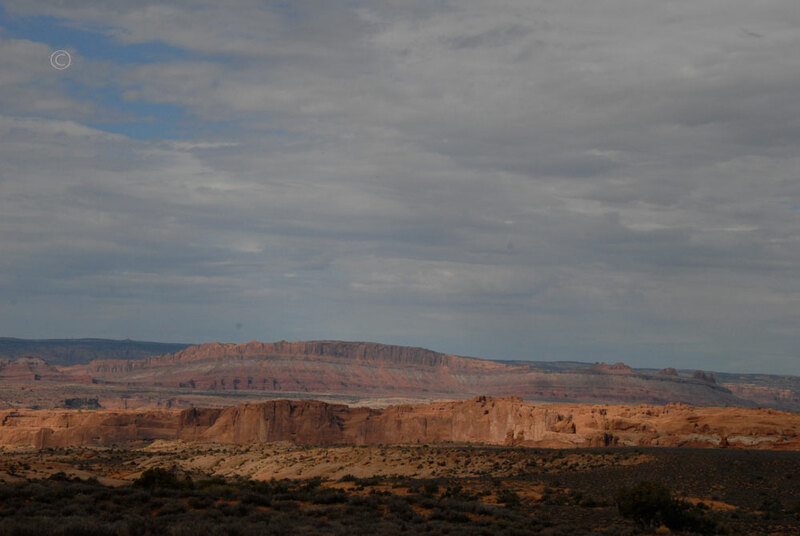 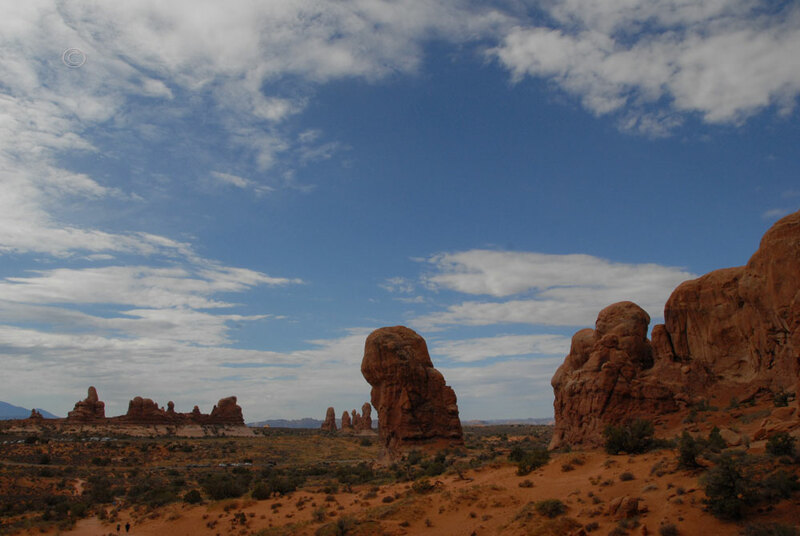 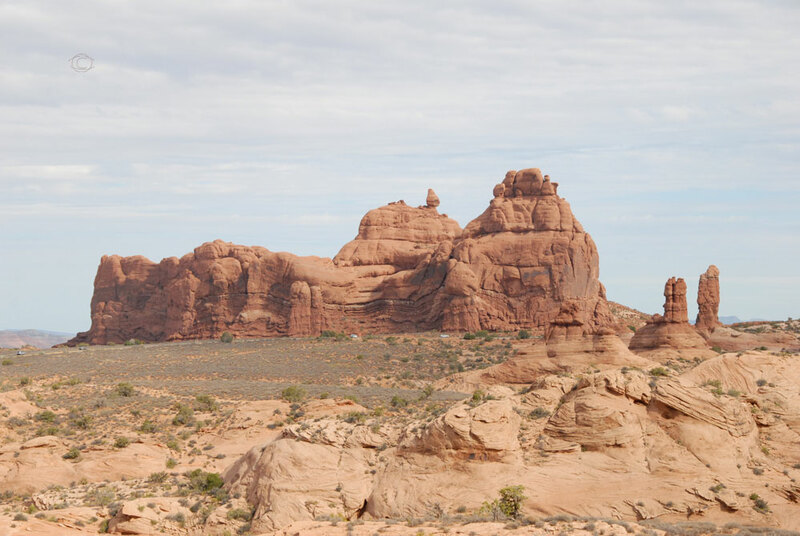 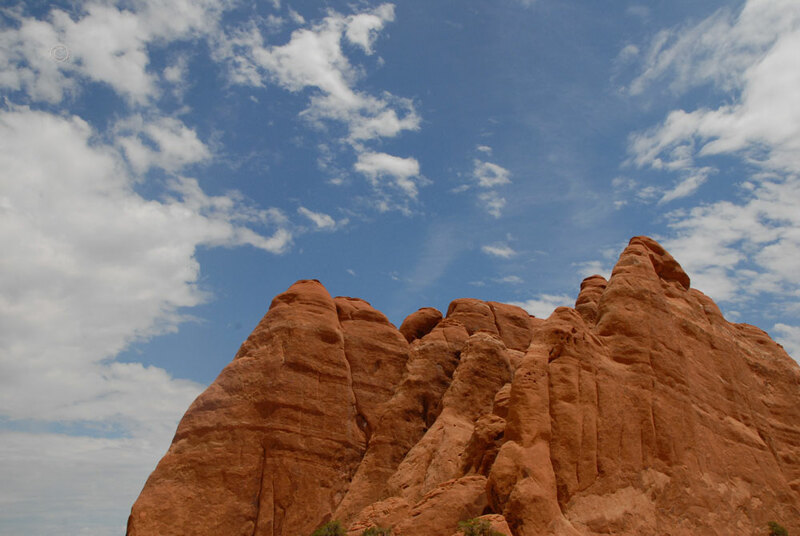 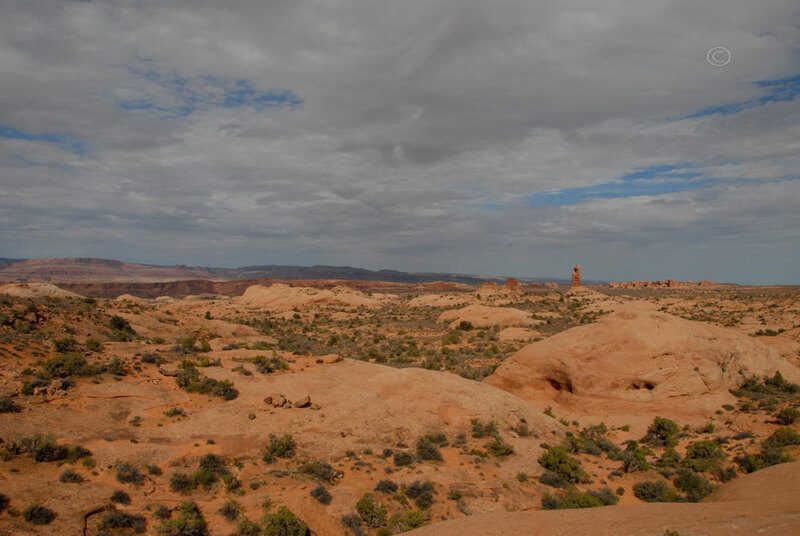 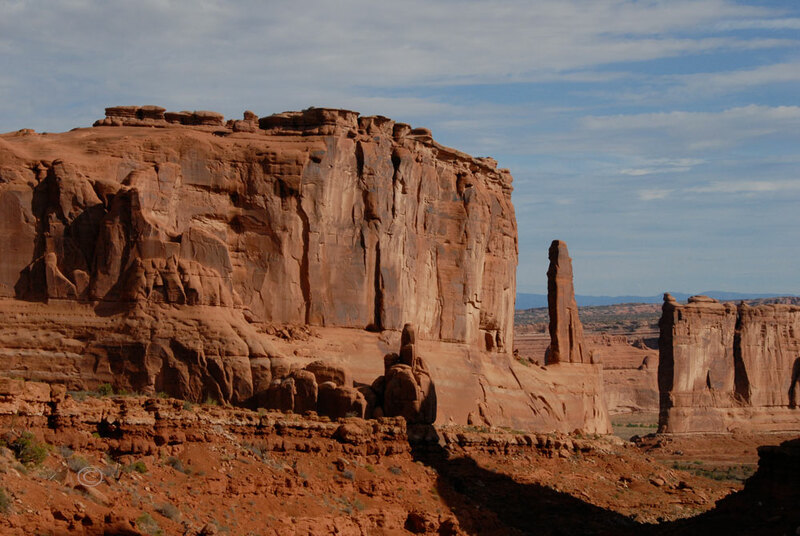 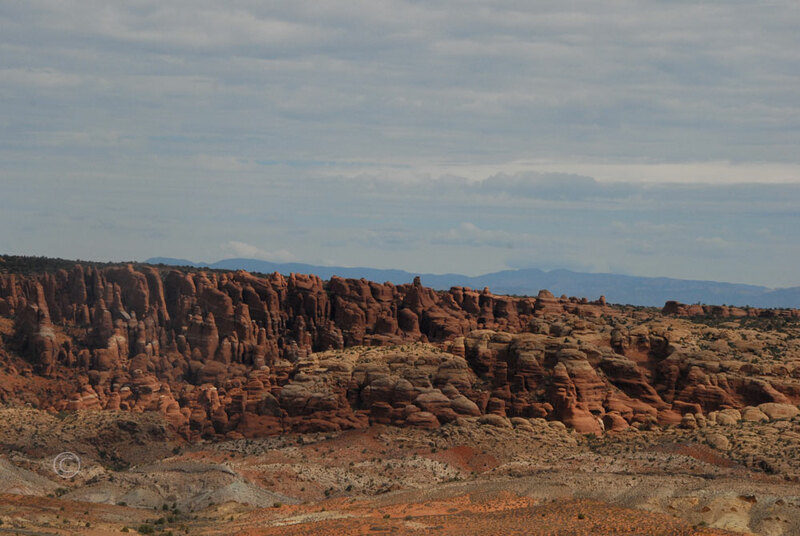 According to geologists, the park stands over an underground salt bed, the natural architect of the many spires, arches, fins, monoliths, and balanced rocks that make this area special. 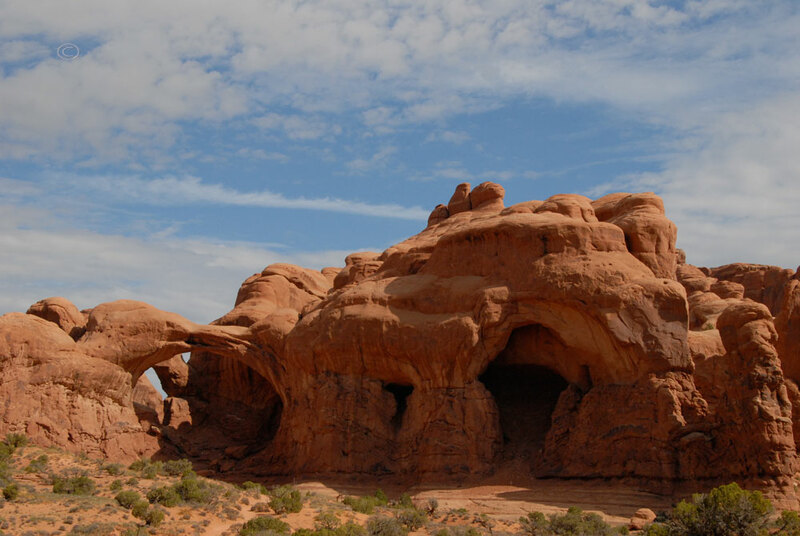 According to our park literature, “Salt under pressure is unstable, and the salt bed lying below Arches was no match for the weight of this thick cover of rock. 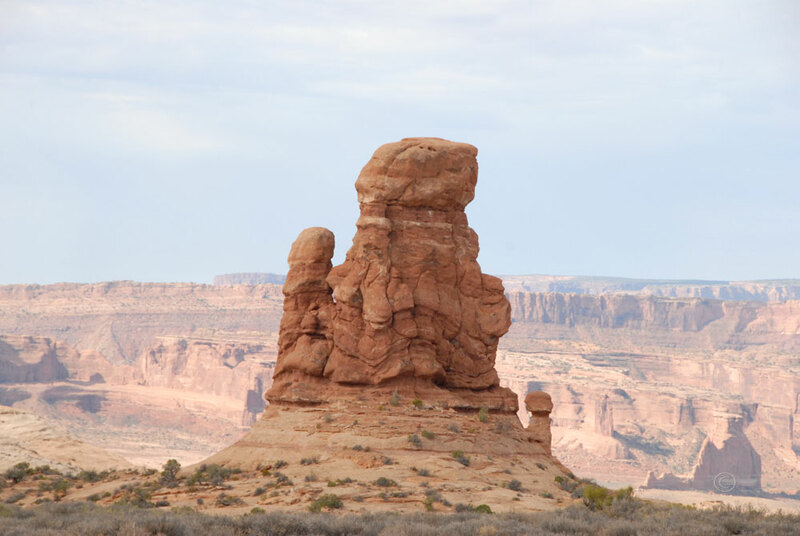 The salt layer shifted, buckled, liquefied, and repositioned itself, thrusting rock layers upward as domes, and whole sections fell into cavities”. 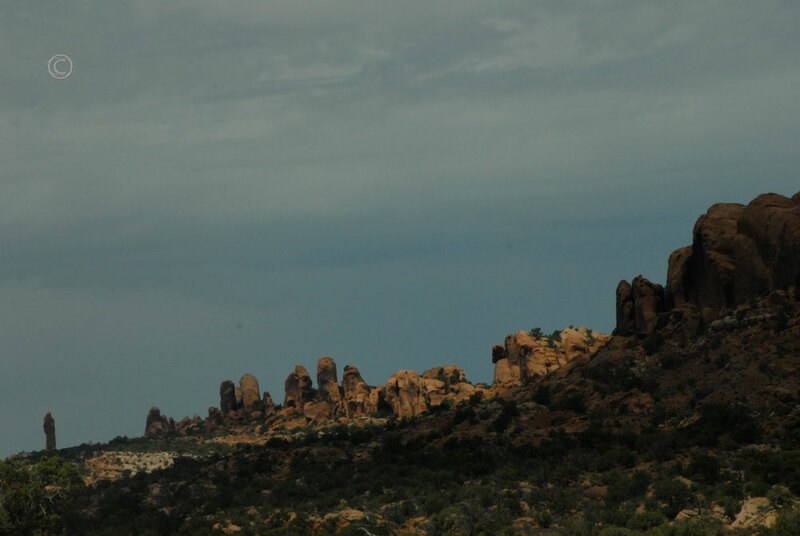 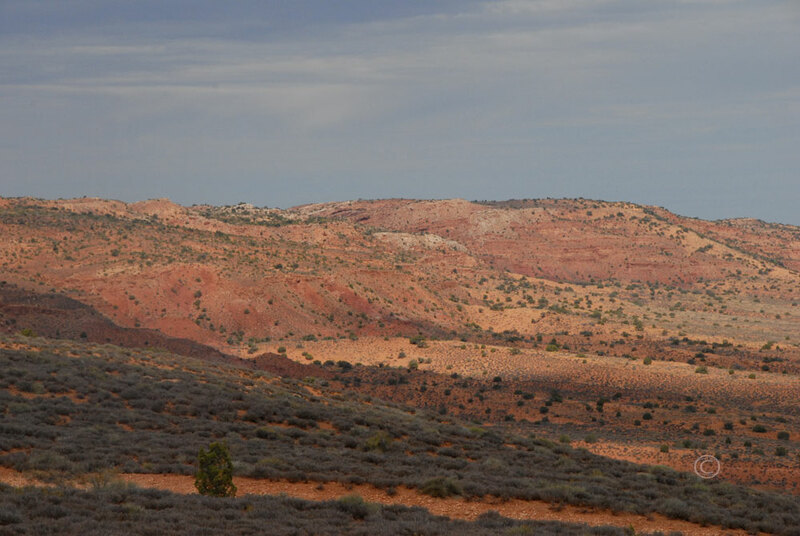 As we drove through the brilliant red an orange landscape, we watched for the figures hidden in the rocks. 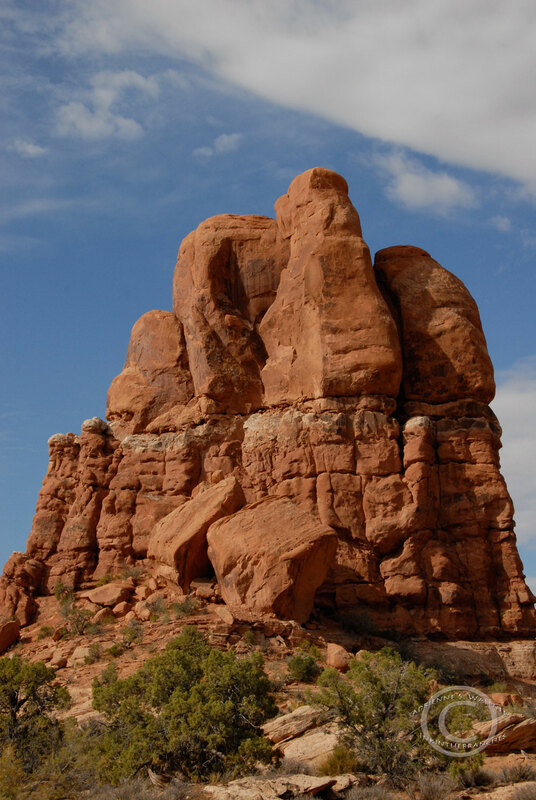 Many of the rocks have been given anthropomorphic or animal names suggested by their shape. 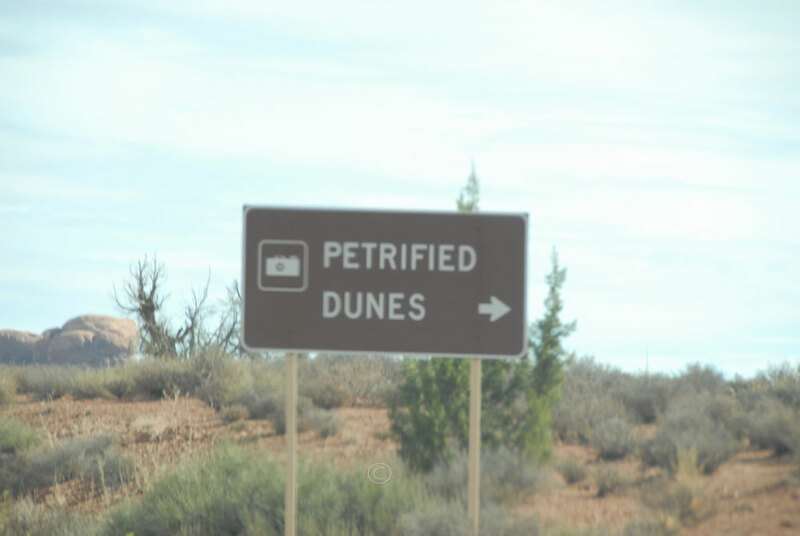 Next we checked out the Petrified Dunes. 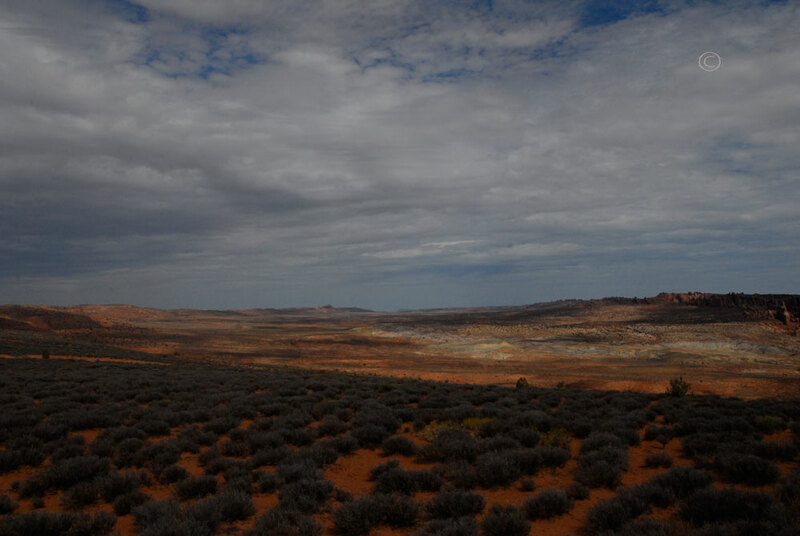 Once covered by endless sand dunes, this area was slowly changed over time. 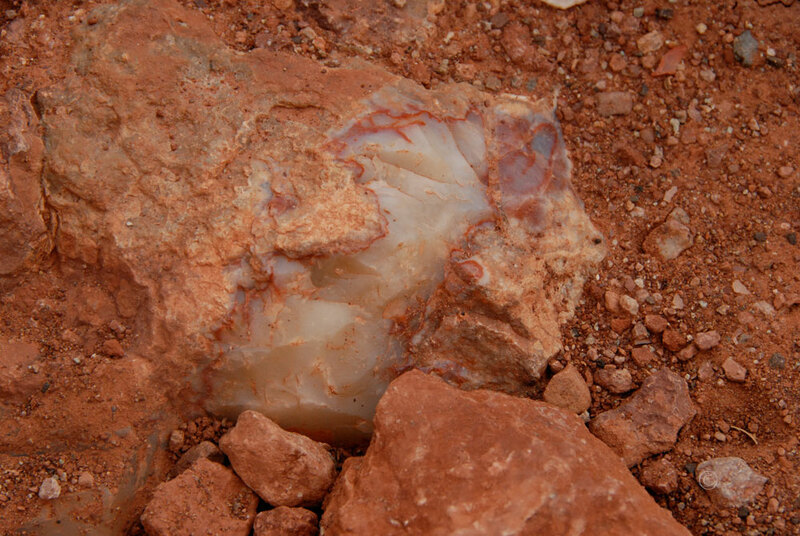 Sand covered by layer of sediment was compressed and cemented by calcite and quartz. 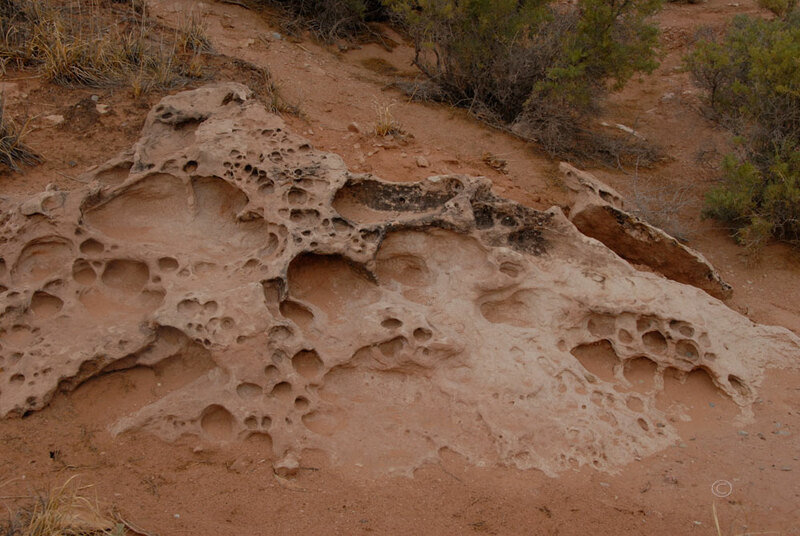 As even more time passed, erosion washed away the sedimentary layers and uncovered the original bubbled landscape once again. 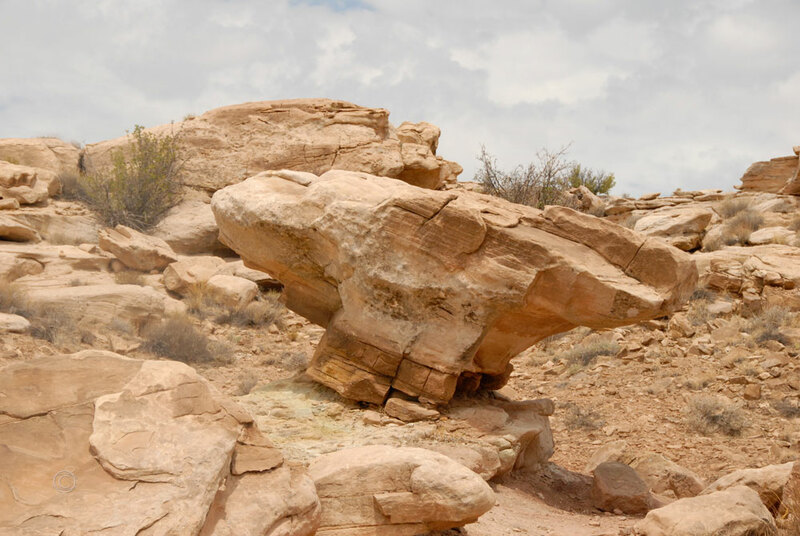 Originally carried by northwest winds blustering over the landscape over 200 million years ago, the ancient sand has solidified into rock, hence the name “Petrified Dunes”. 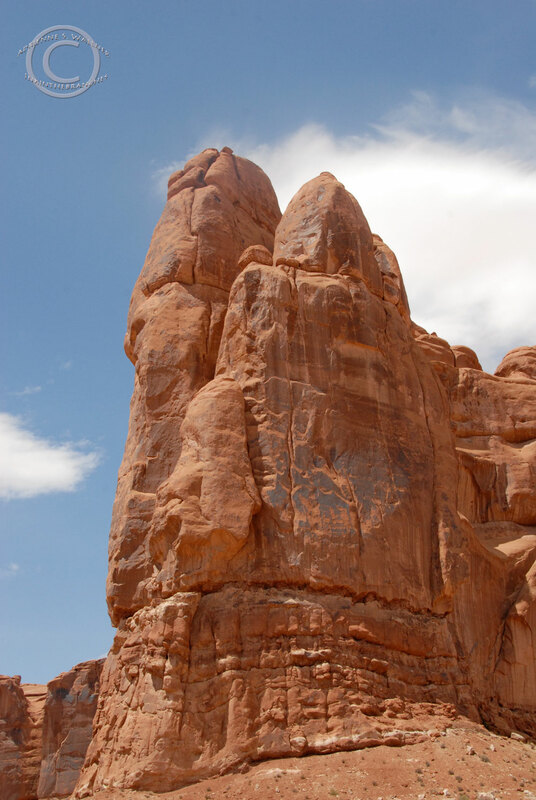 We continued on to one of the more well-known rock monuments in the park, the precariously impressive 55-foot tall block of sandstone, Balanced Rock. 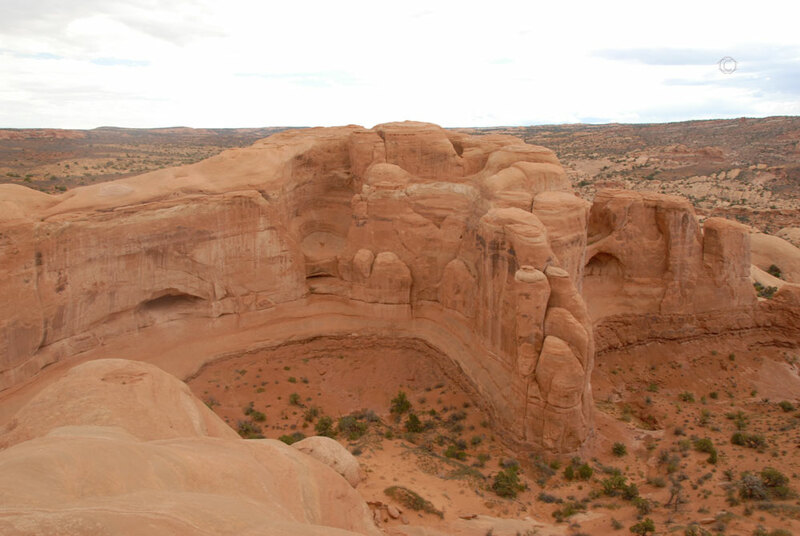 It’s challenging to name and describe all of the impressive features that surrounded us. 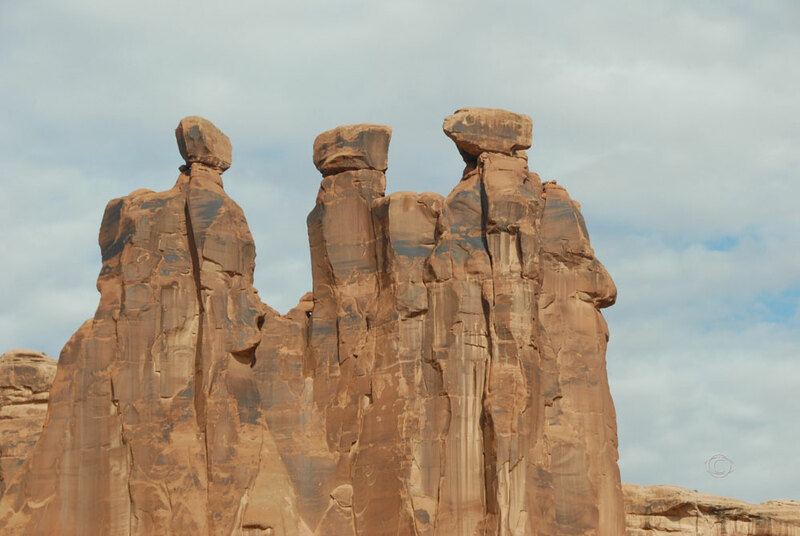 Massive stone figures loomed over the desert like silent giants. 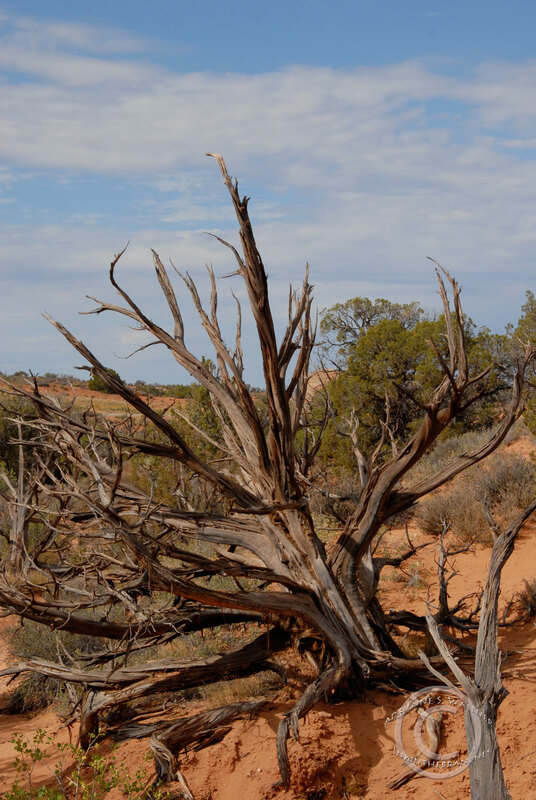 They stood motionless, unable to shift from their post, yet seemed to transform and change with fluctuating light and shadow. 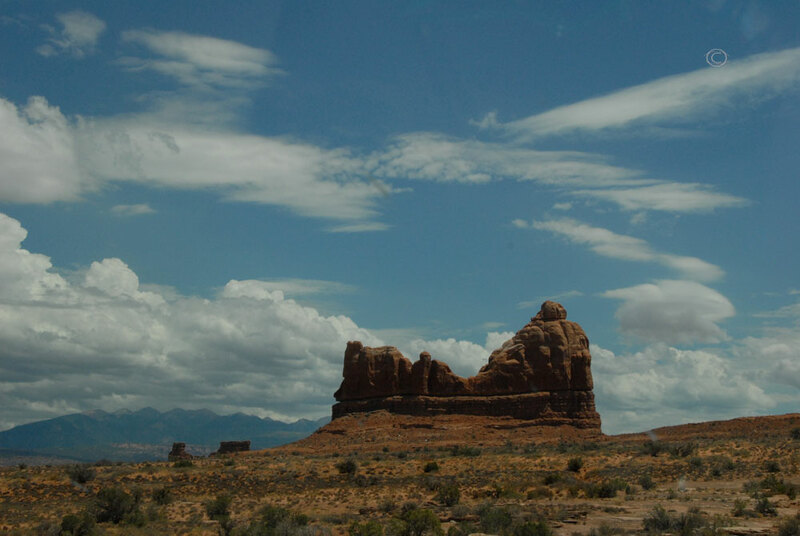 Set against the colorful vista of the Utah desert and beneath cotton-cloud-webbed skies, there was little want for a more beautiful scene. 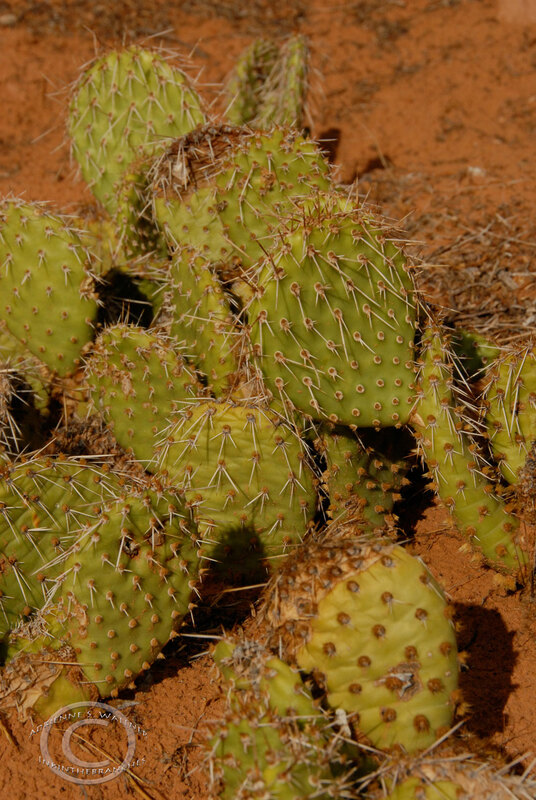 Possible species of Prickly Pear Cacti? 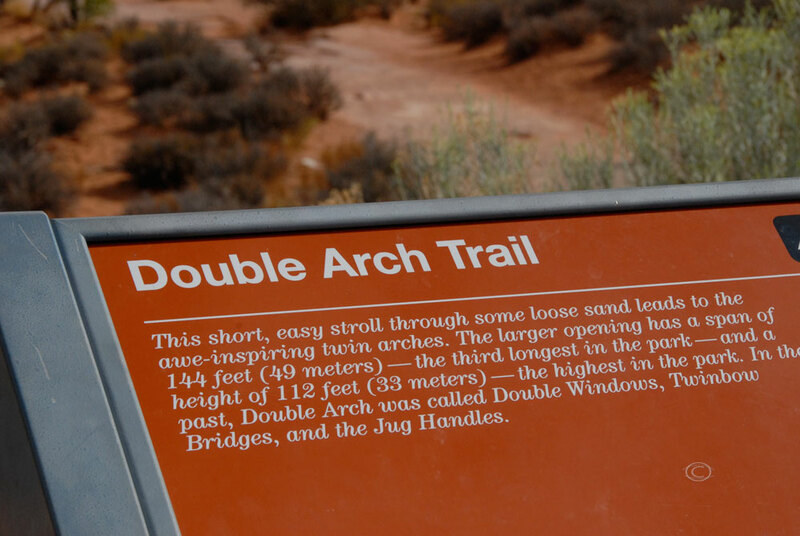 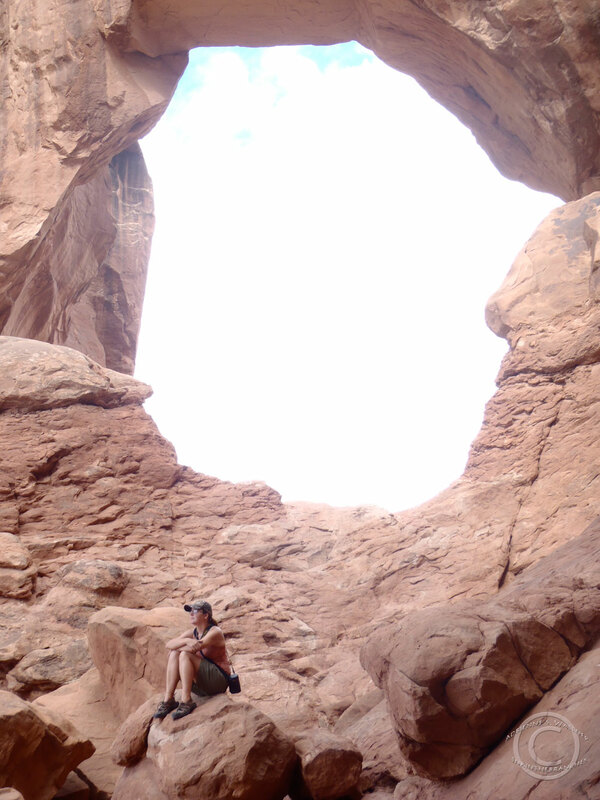 Next we hiked around the Windows and Double Arch Trail. 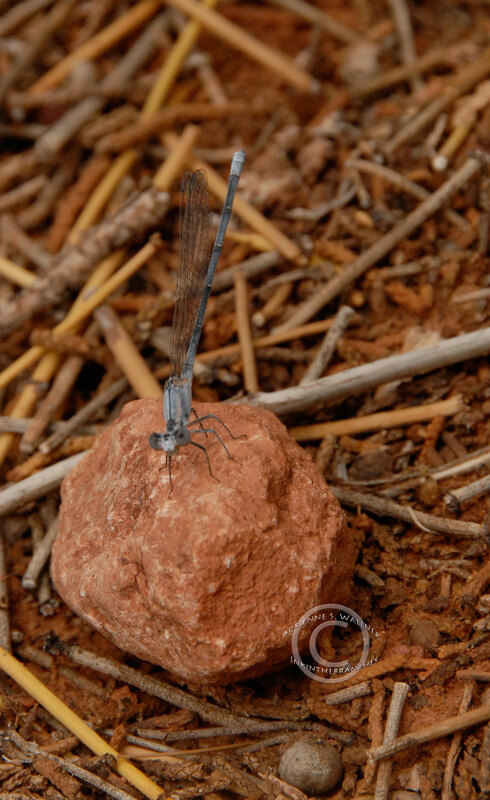 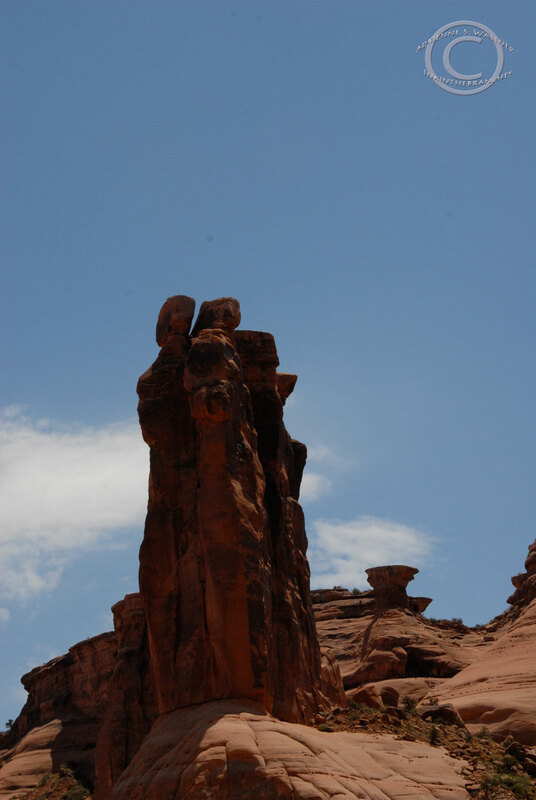 We again let our imaginations wander as we looked for figures in the rocks. 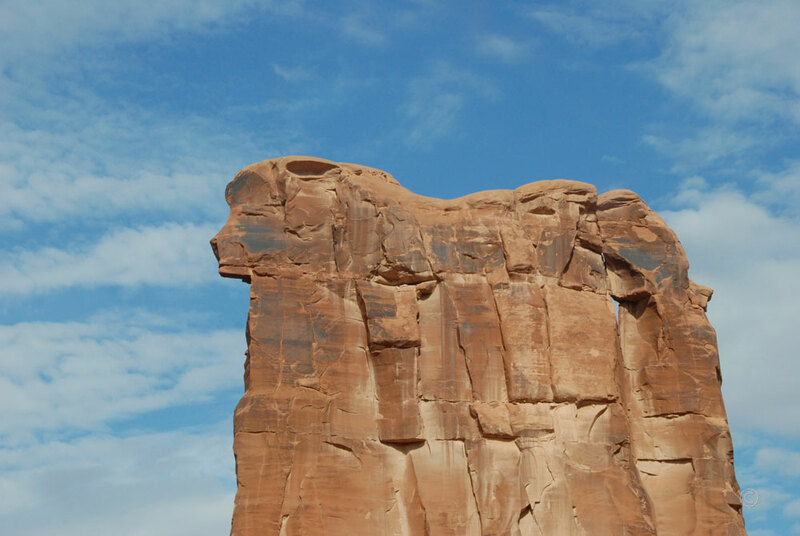 Slowly dissolved by water and weather over the years, the binding ability of the sandstone deteriorates. 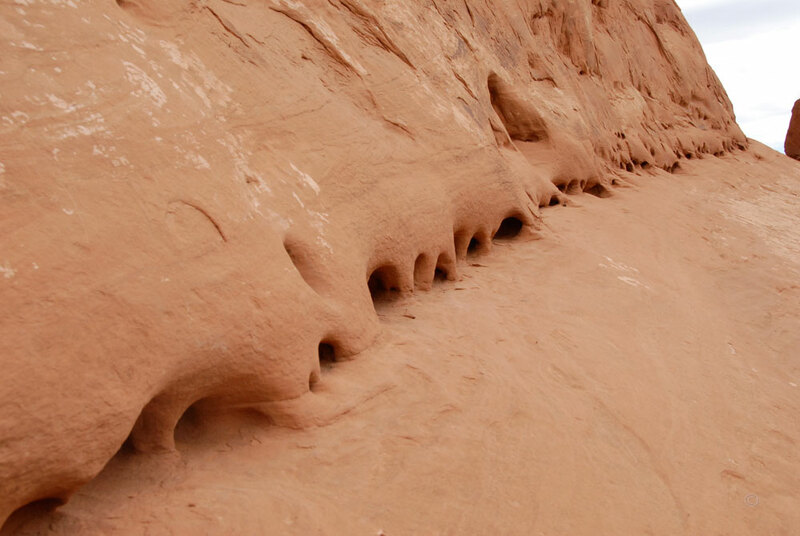 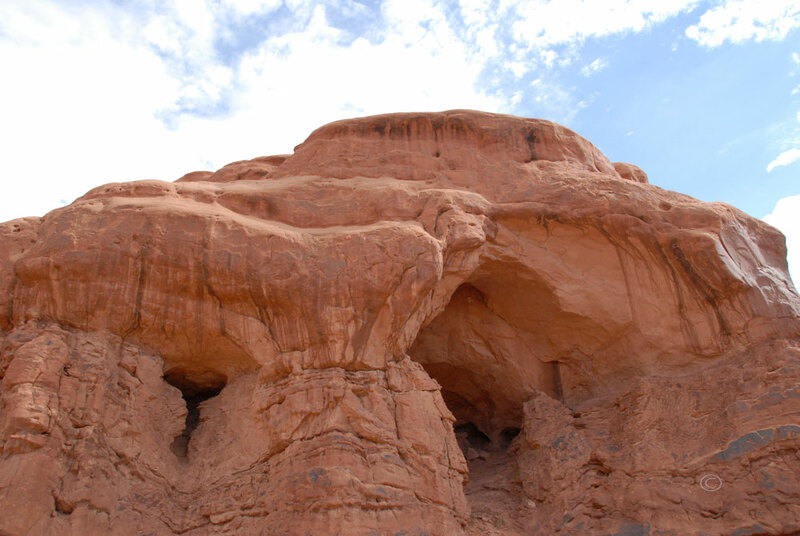 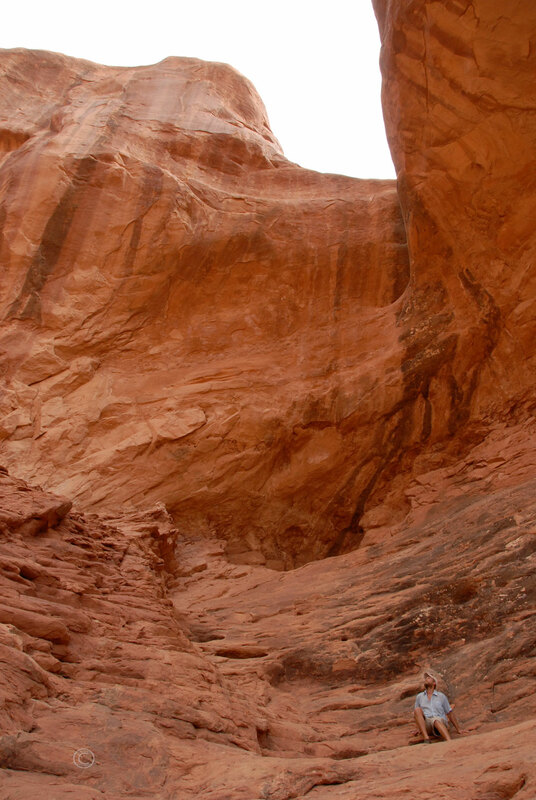 Small cavities of eroded sandstone eventually penetrate the stone fins and become arches. 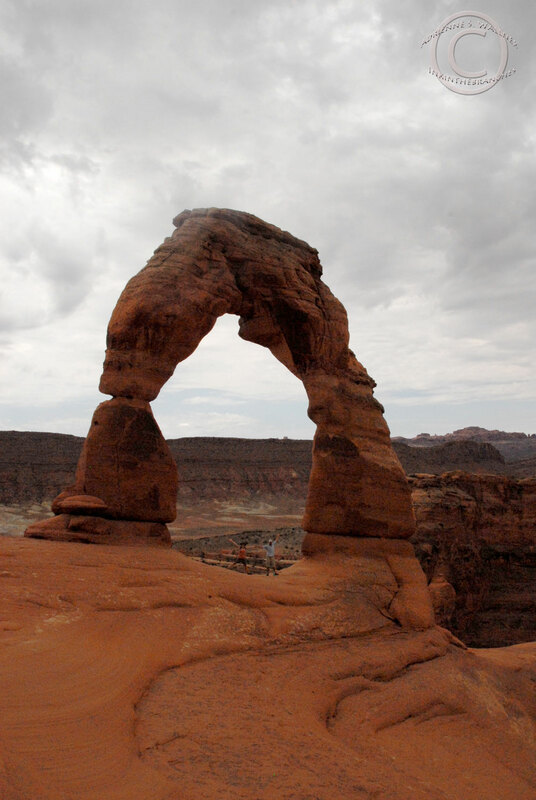 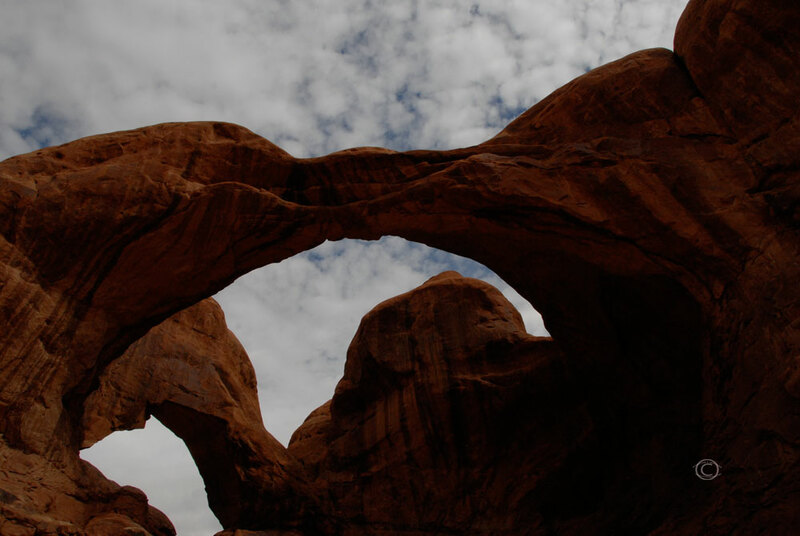 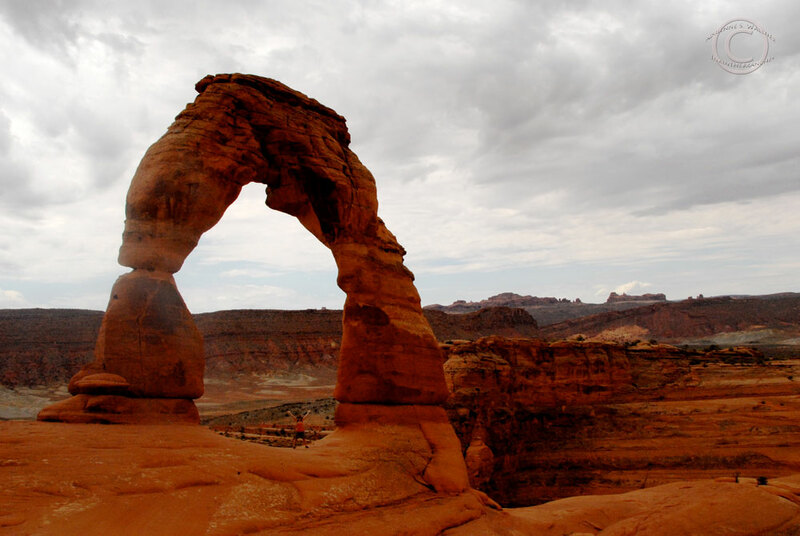 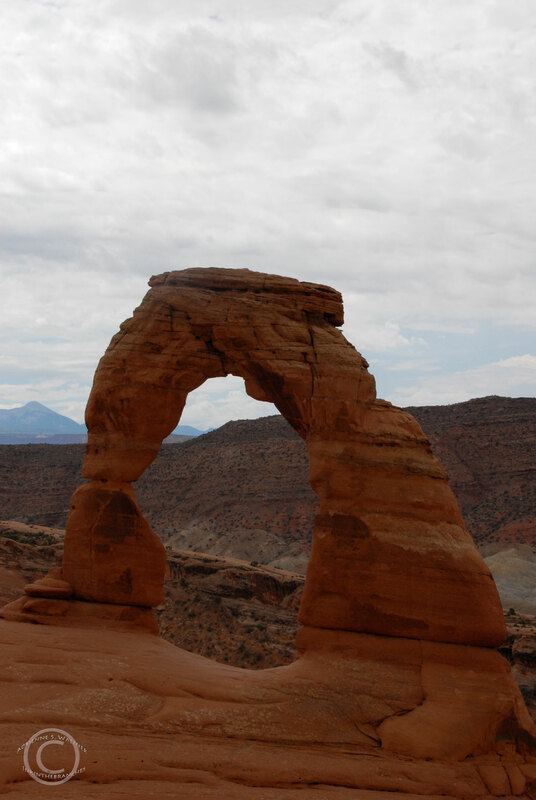 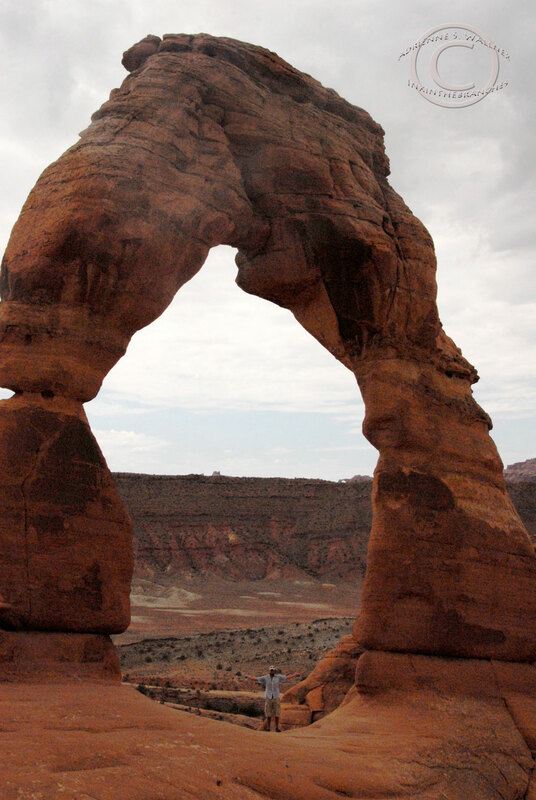 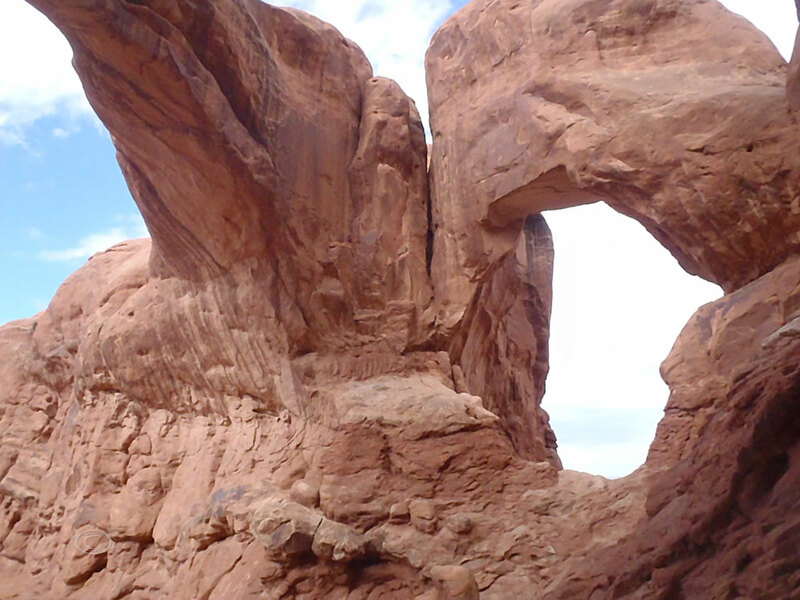 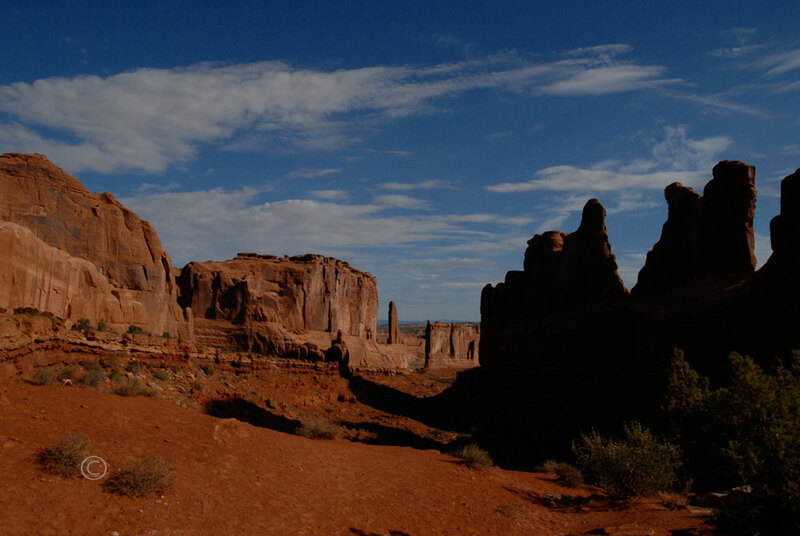 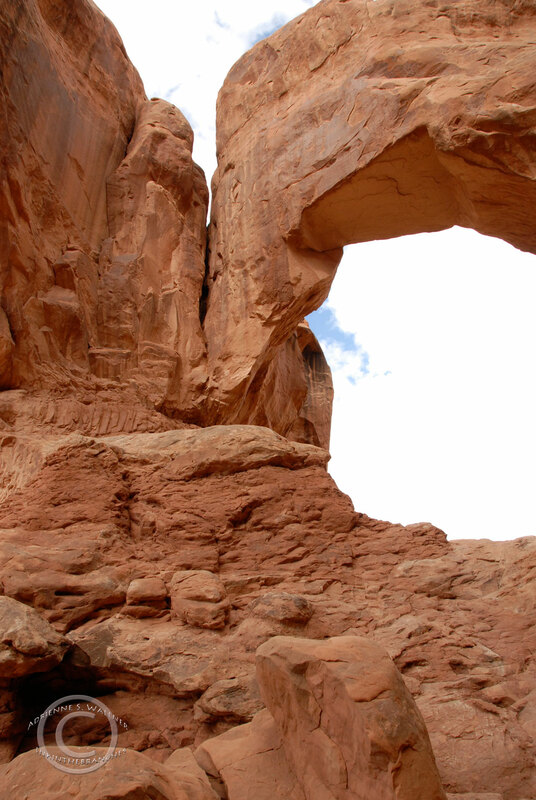 Arches National park boasts over 2,000 of such openings. 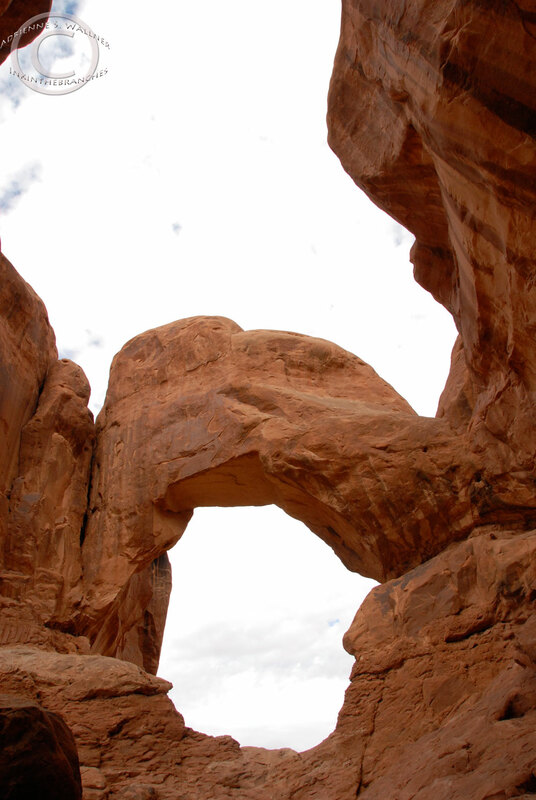 It’s impossible to really conceive of how big these arches are until you walk right up to them. 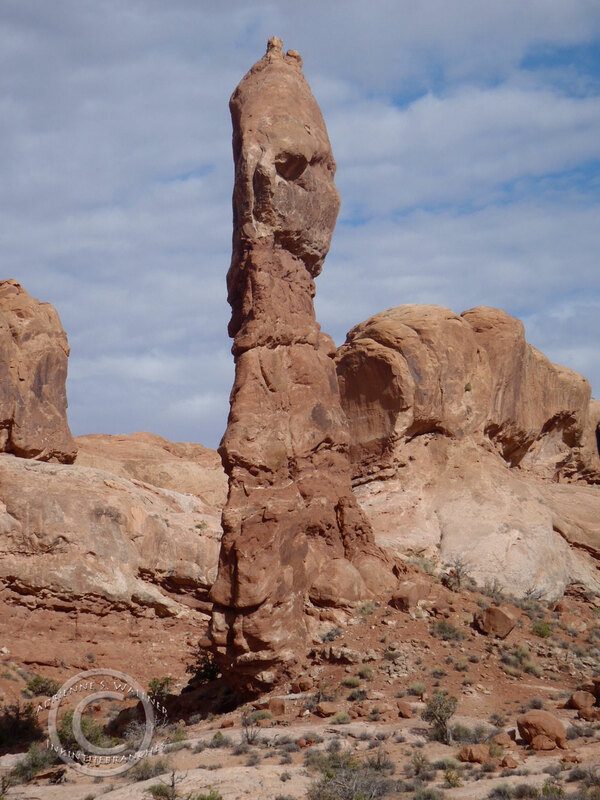 See little D? 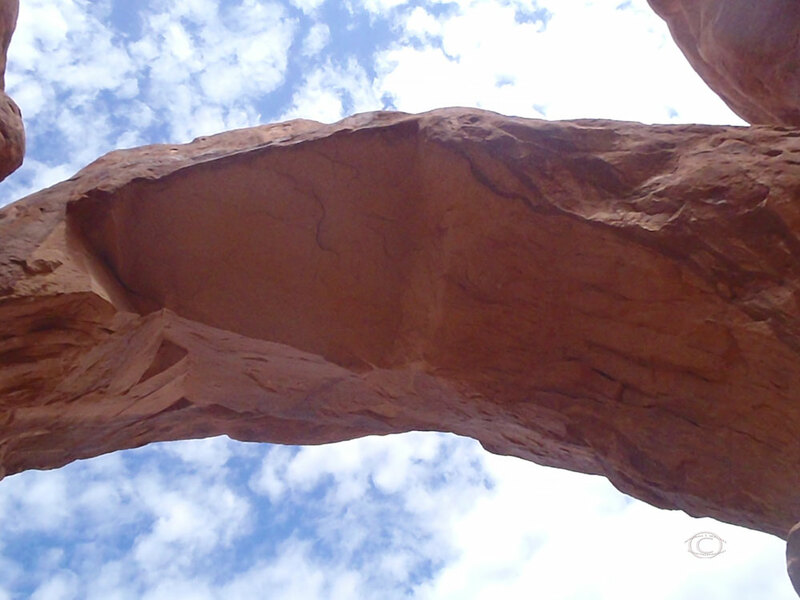 These things are HUGE! 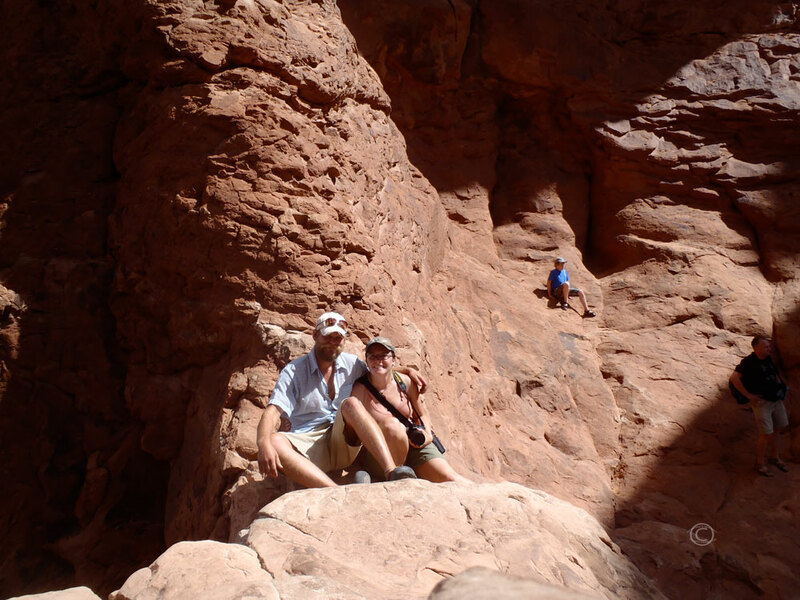 Me and D in the Arches! 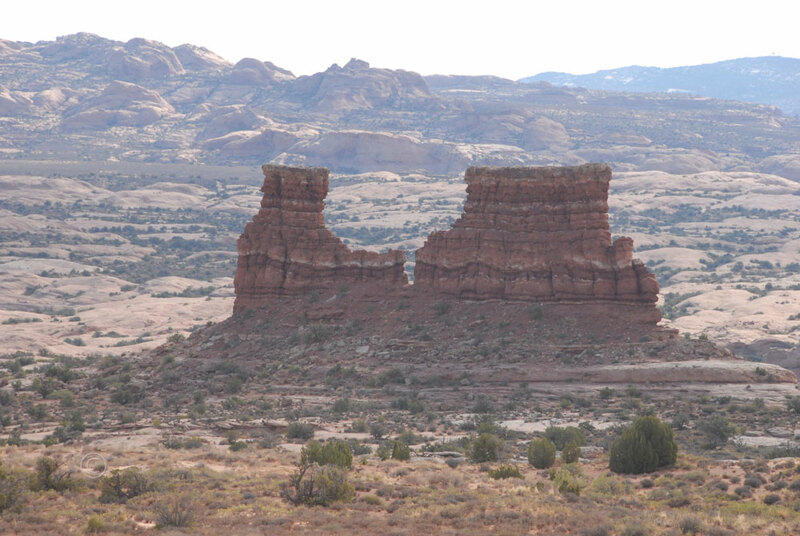 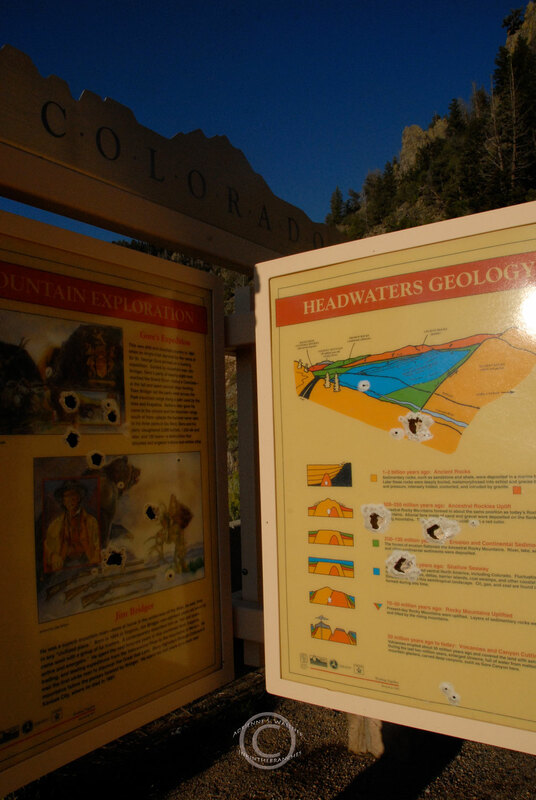 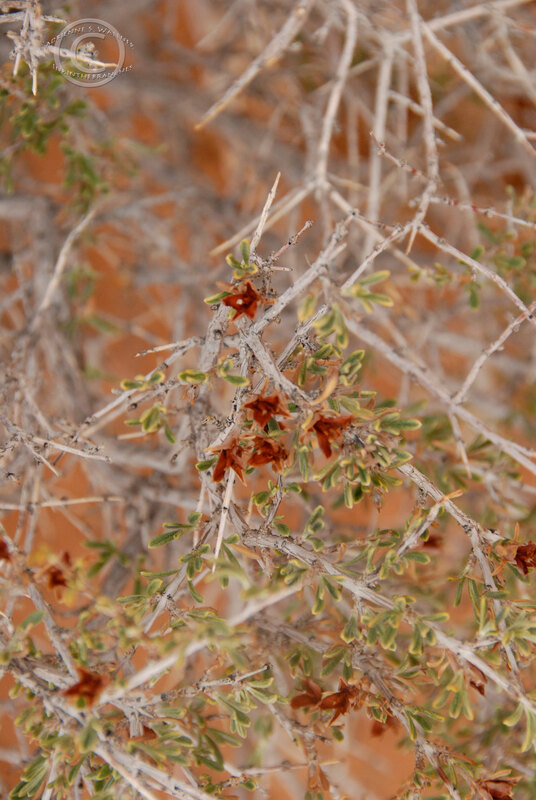 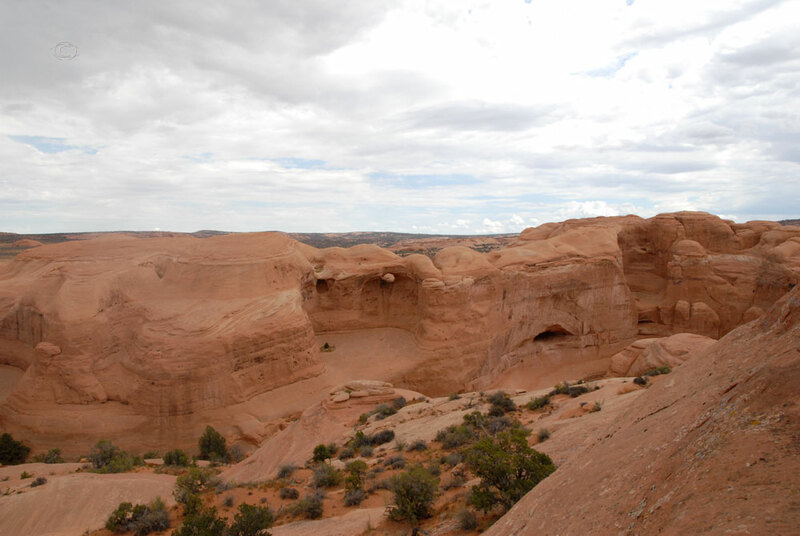 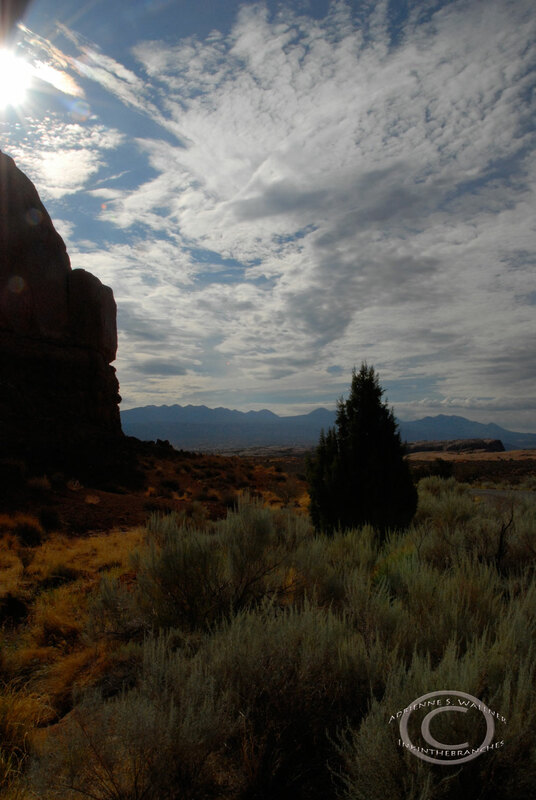 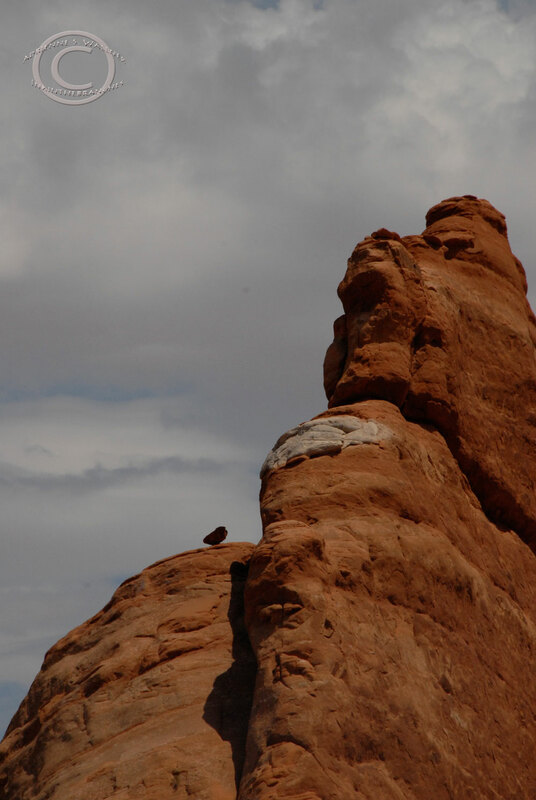 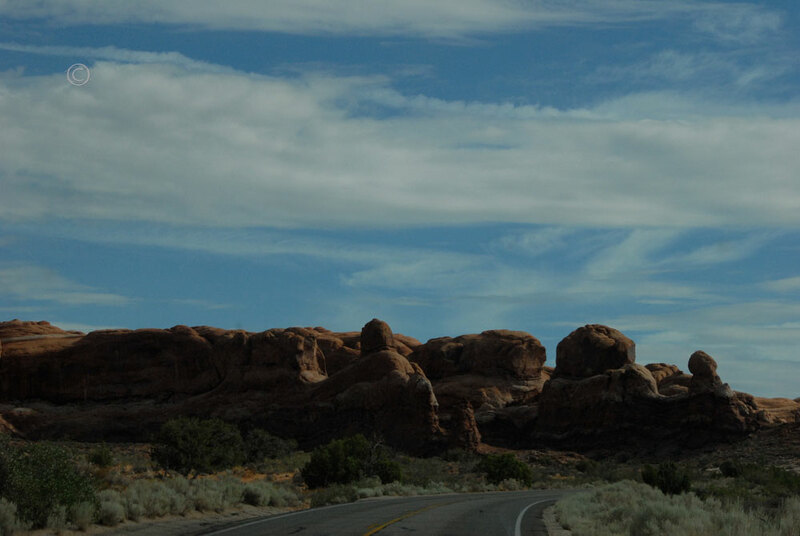 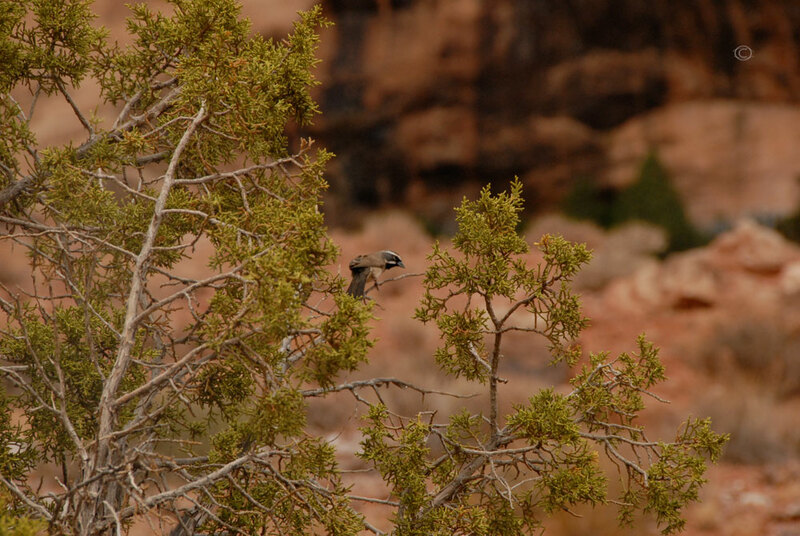 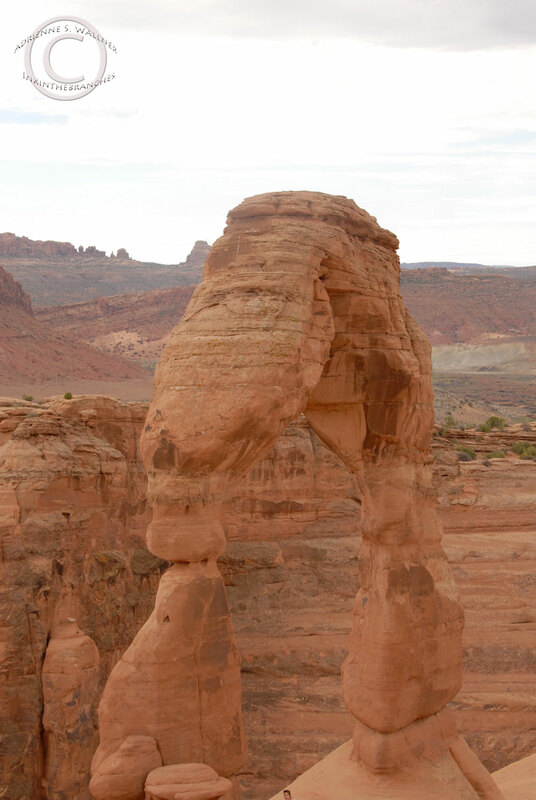 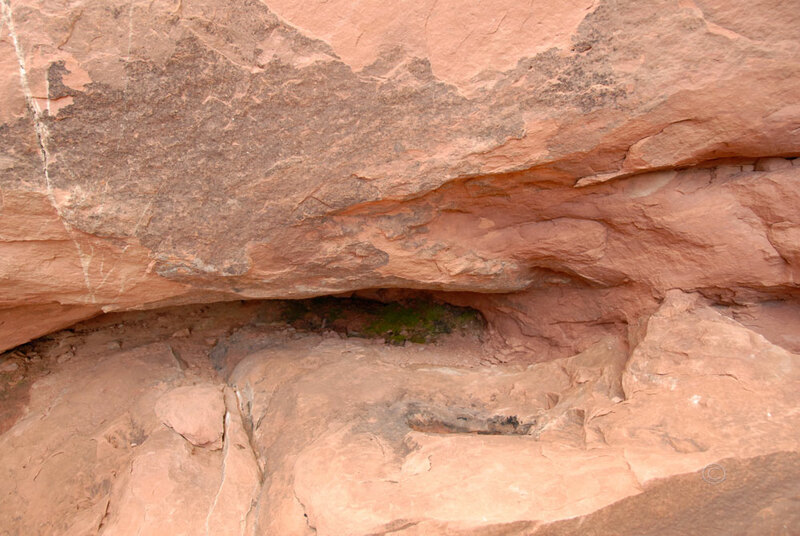 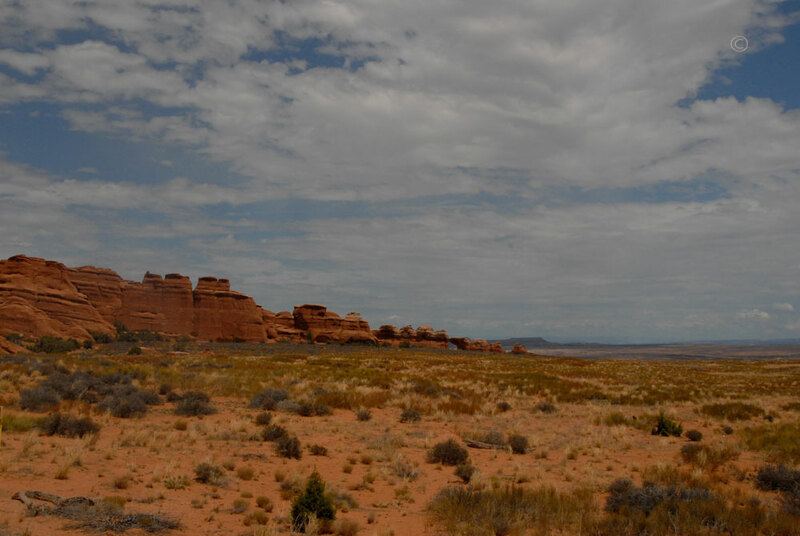 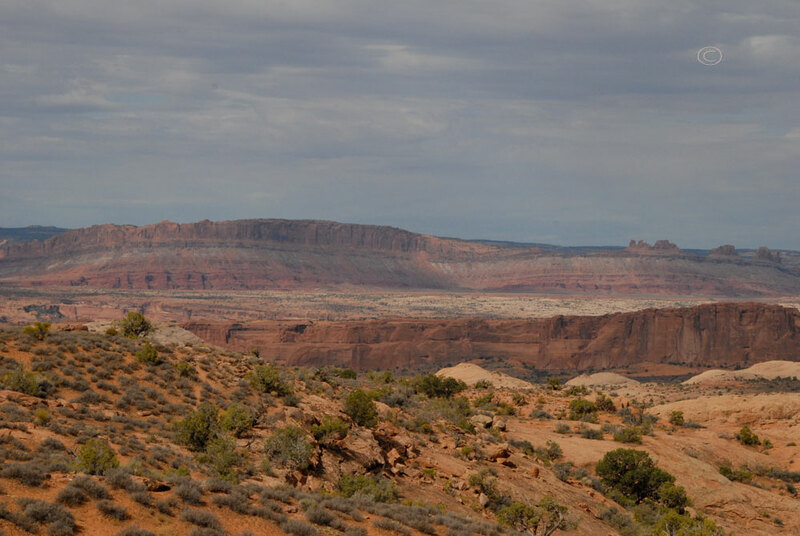 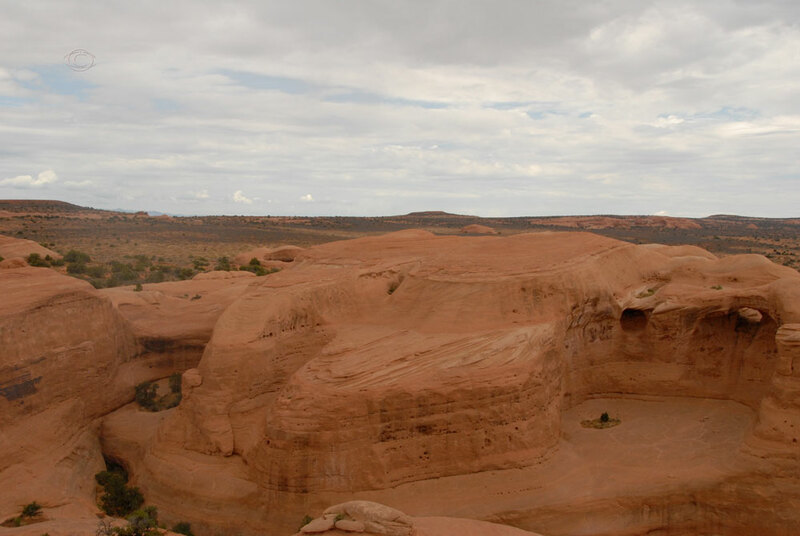 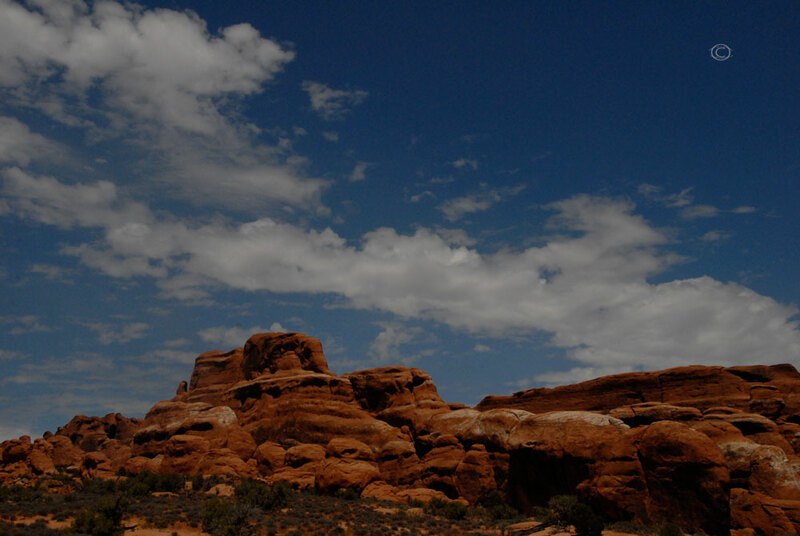 In addition to the inanimate features, Arches also hosts a variety of flora and fauna. 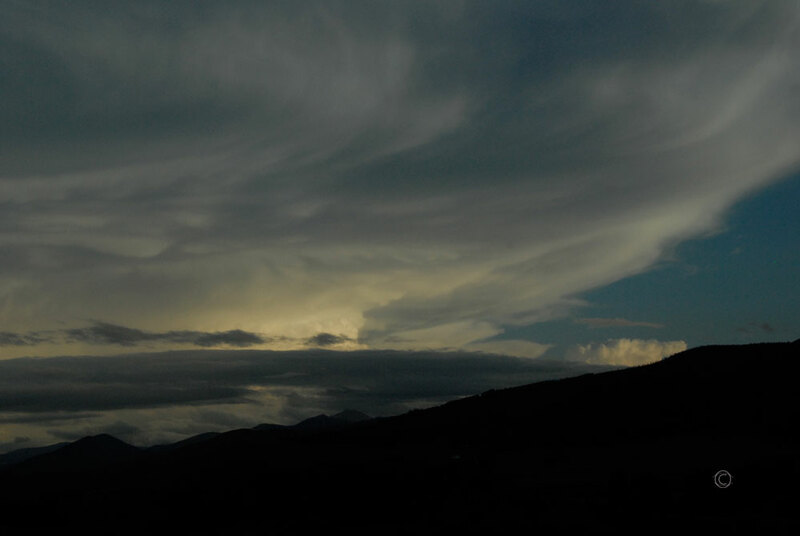 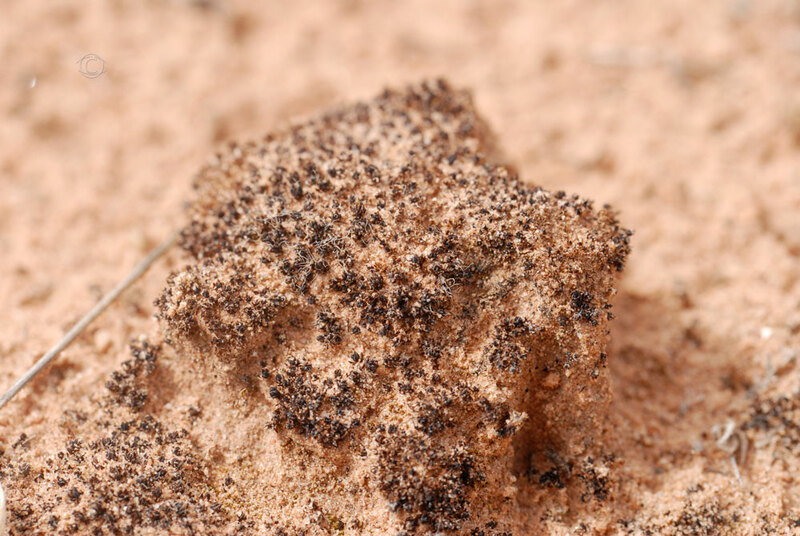 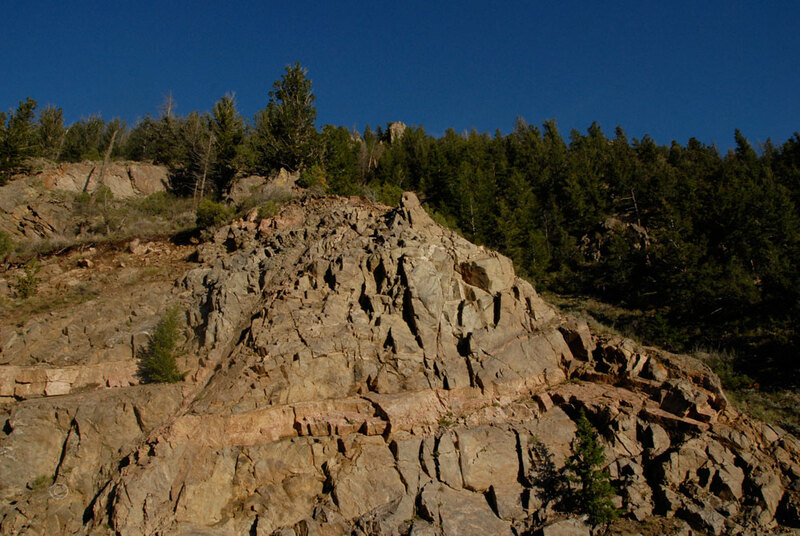 One of the most unique is the biological soil crust called Cryptobiotic soil. 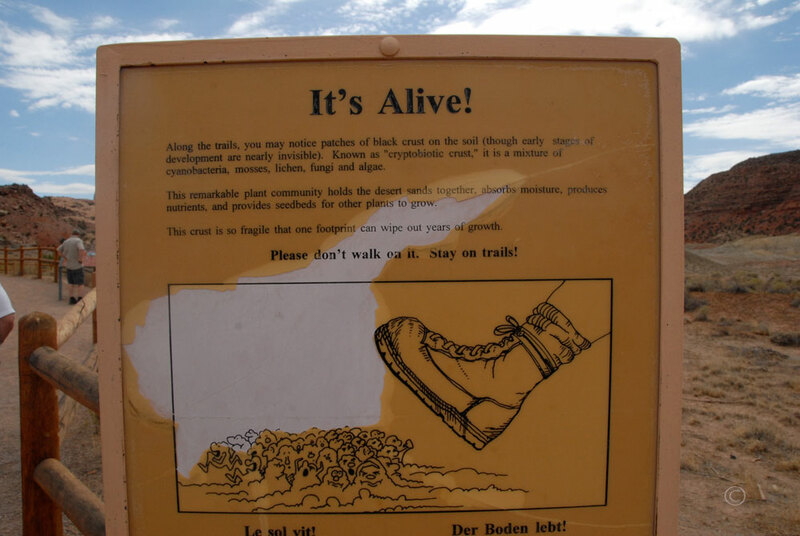 This black soil is composed of algae, moss, lichen, fungi, and cynobacteria. 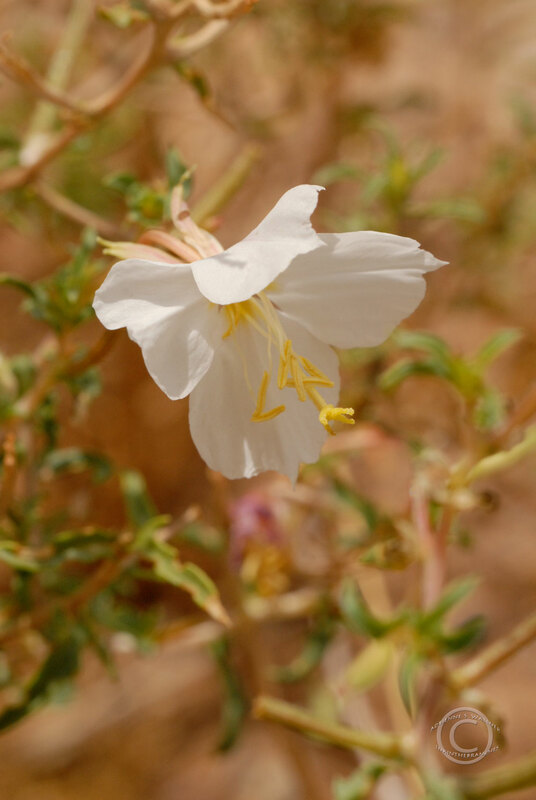 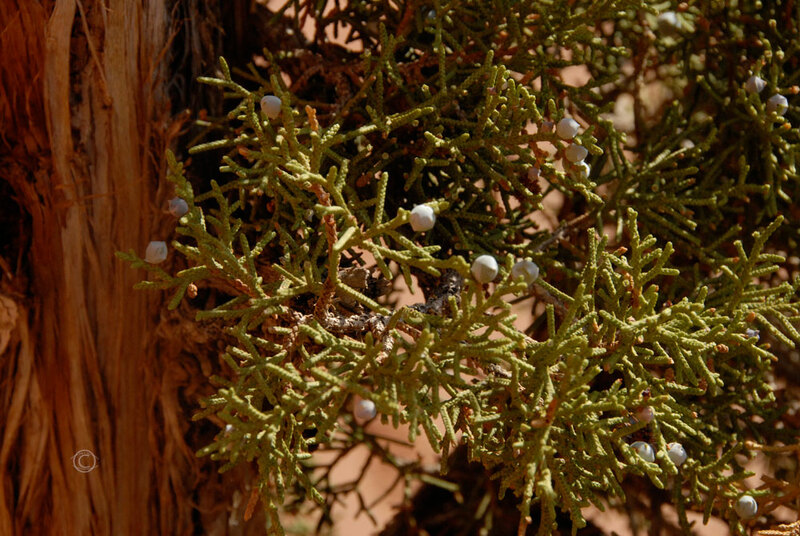 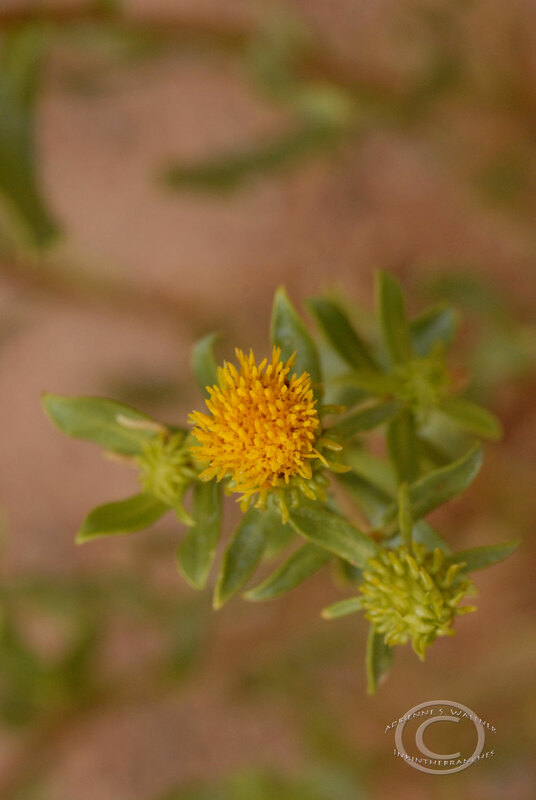 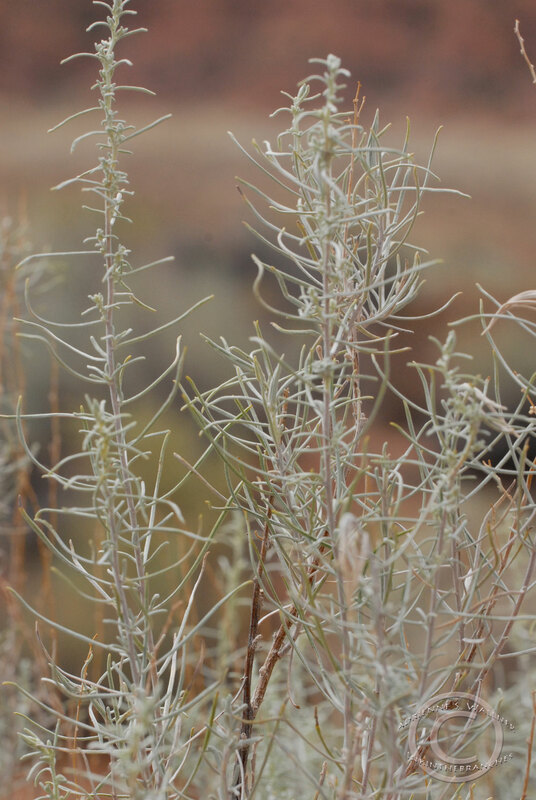 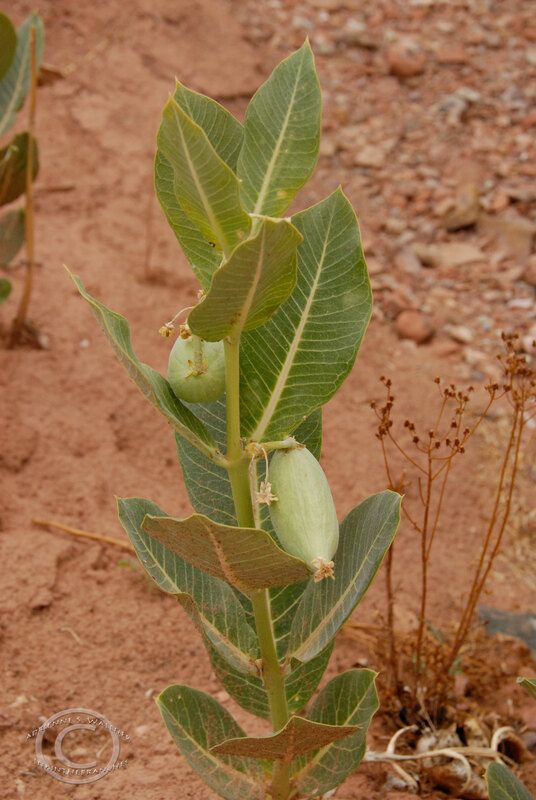 This tiny plant helps to combat erosion, provides nitrogen and other nutrients for plants, and absorbs moisture. 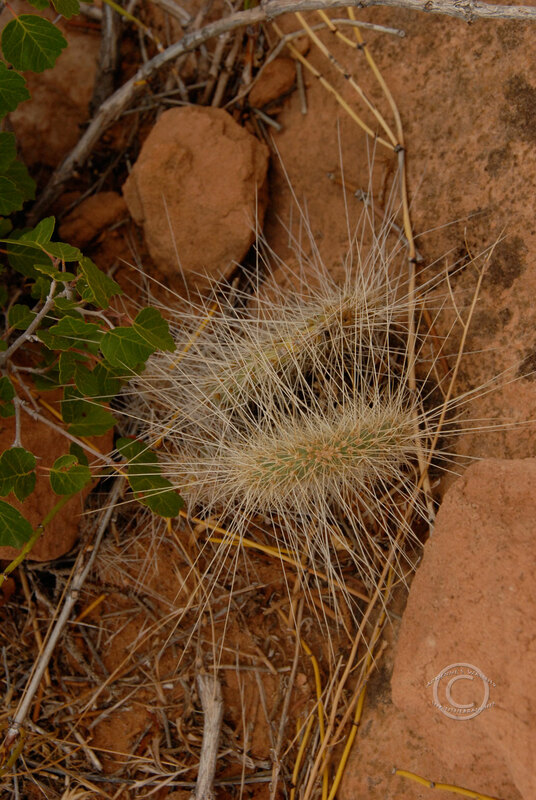 It grows on the un-trodden areas on the park, but can easily be trampled if you are not watching your footing. 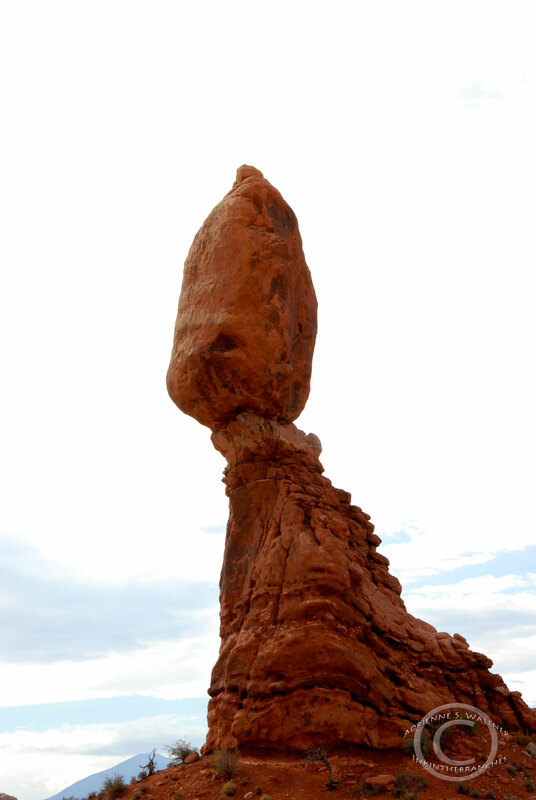 One false step can wipe out many years of growth. 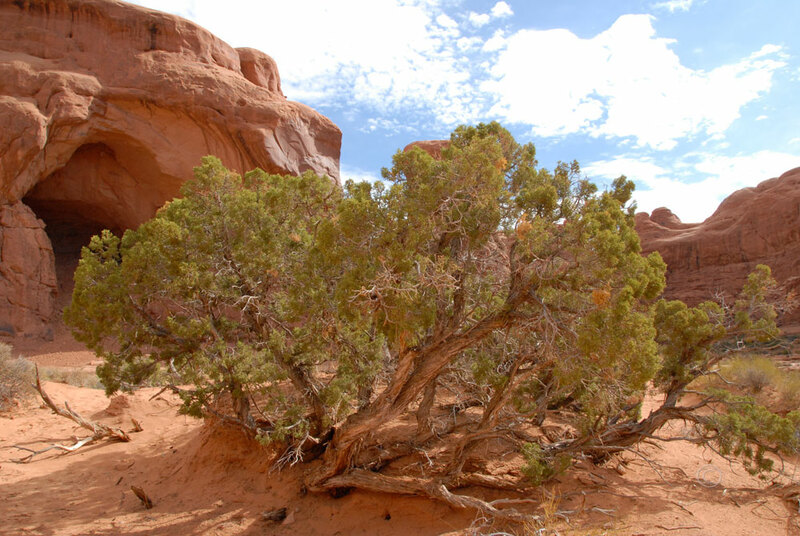 Mormon Tea shrubs, Utah Junipers, and Greasewood spot the sand with resilient tufts of green as smaller inhabitant scurry across the sand. 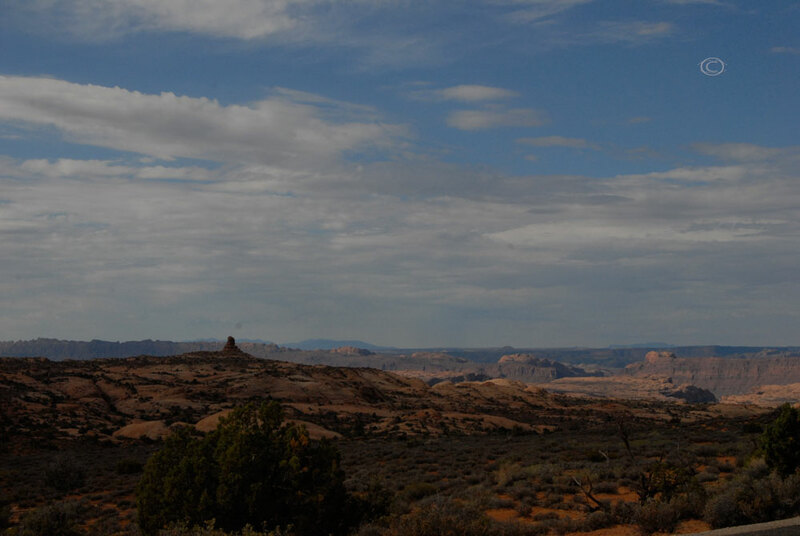 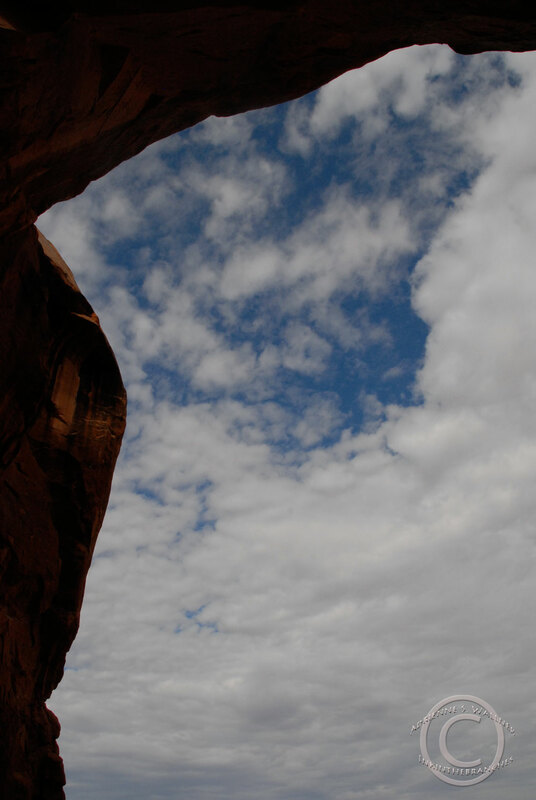 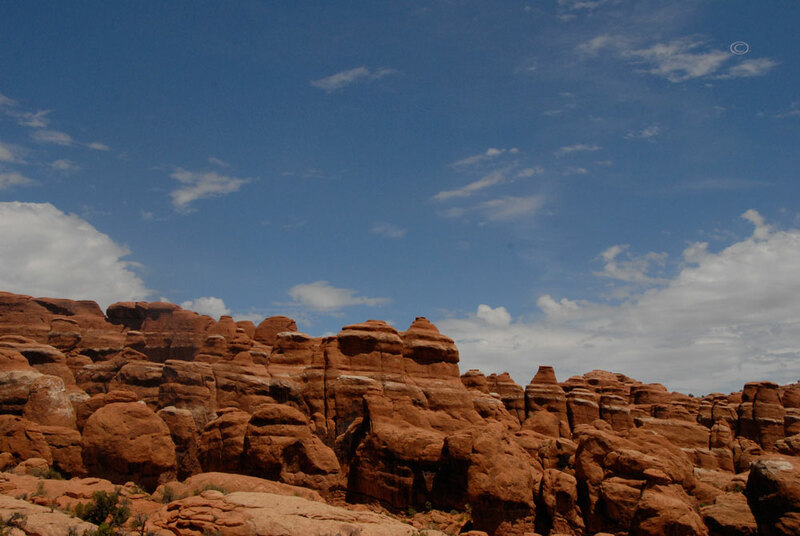 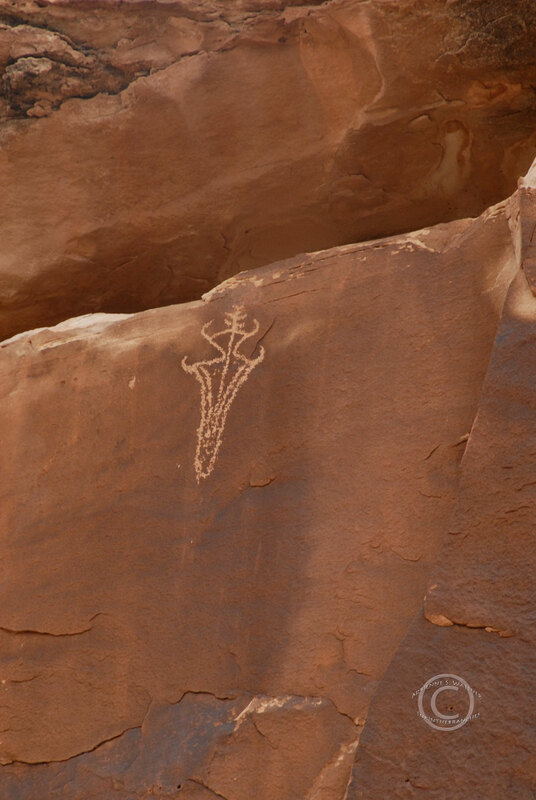 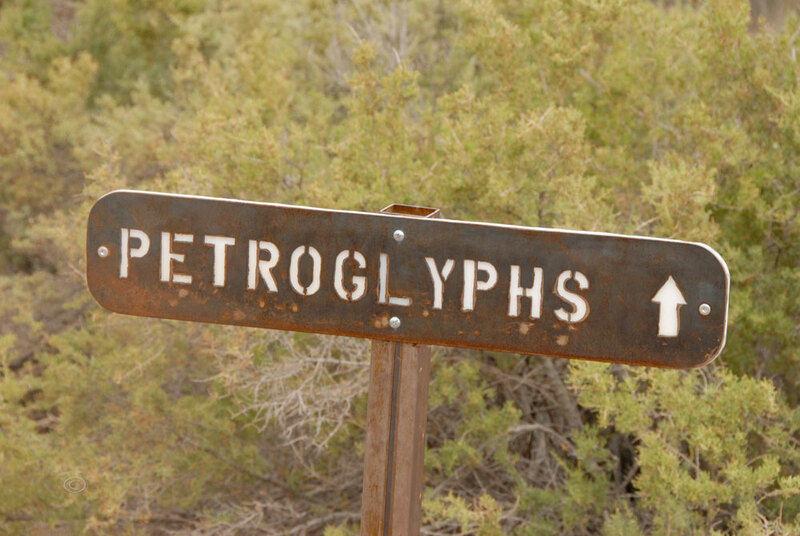 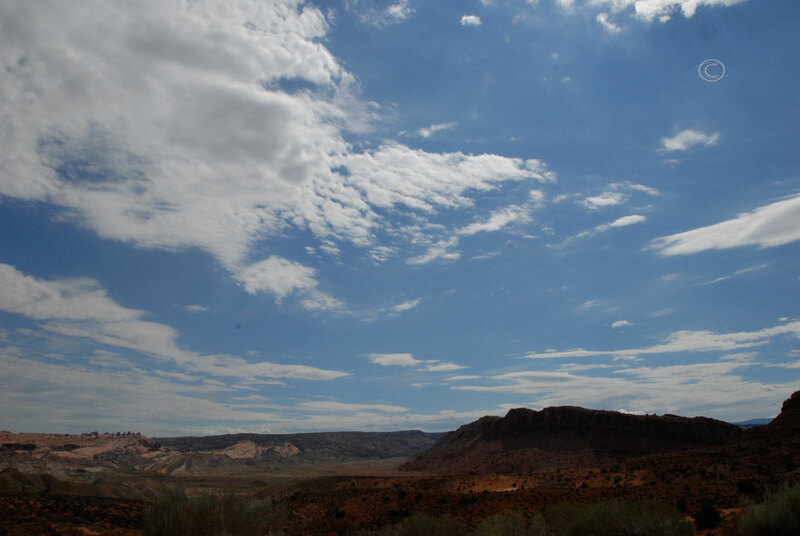 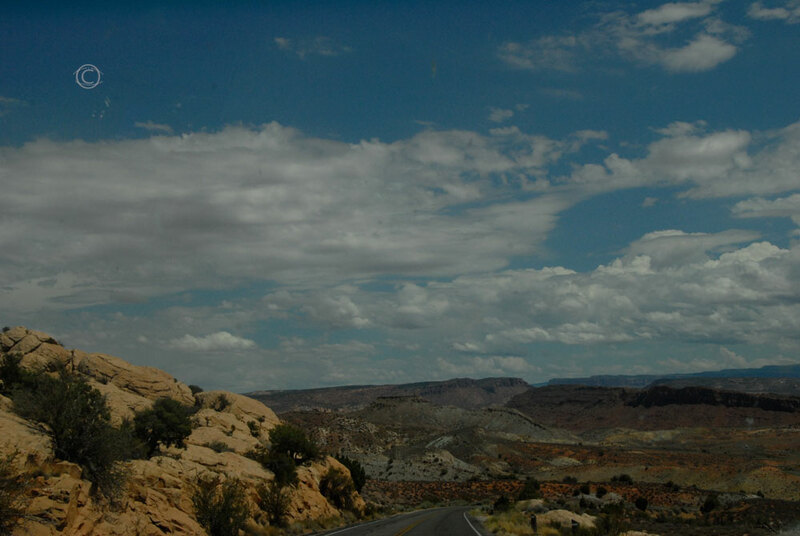 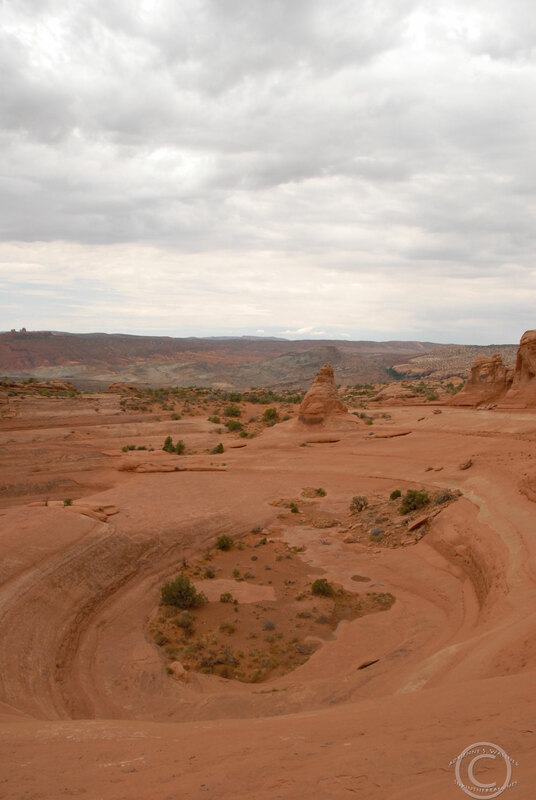 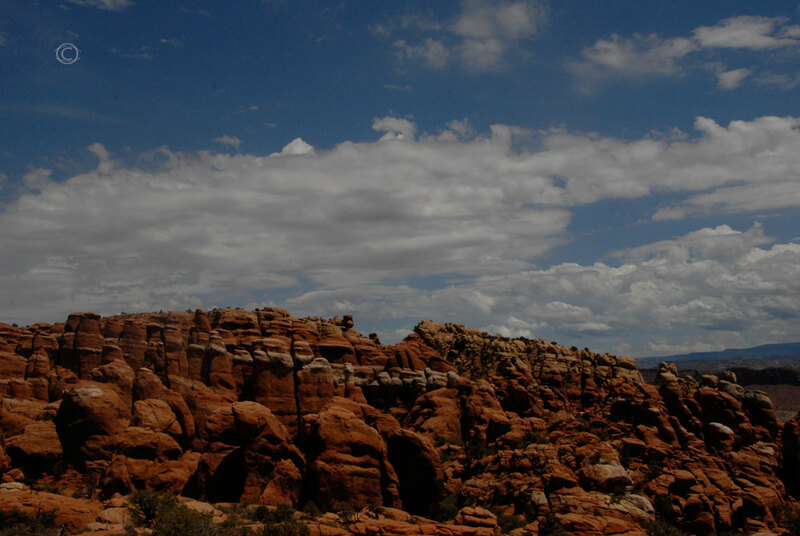 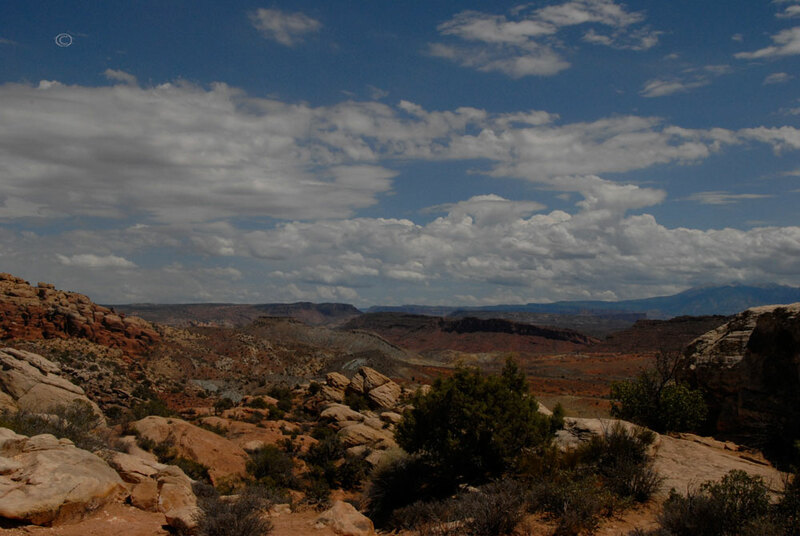 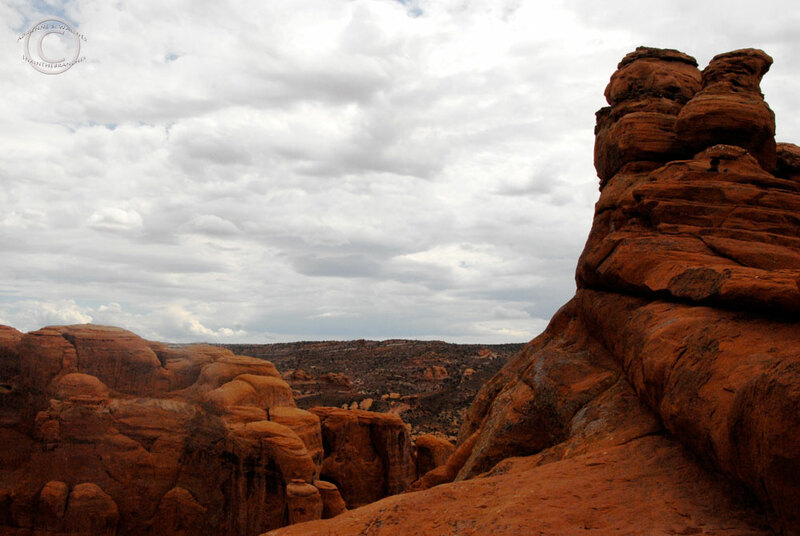 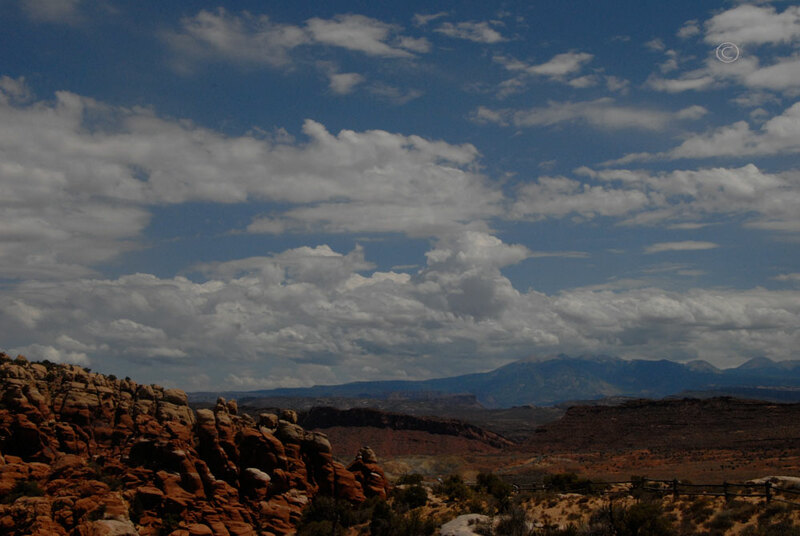 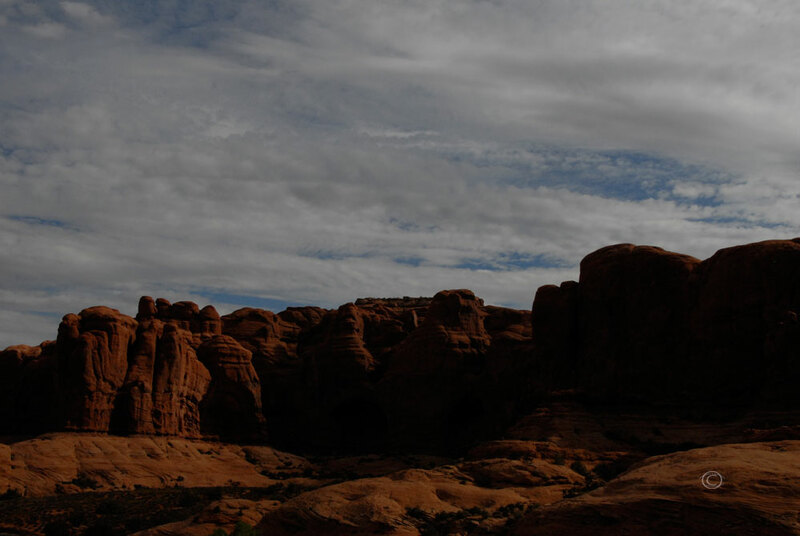 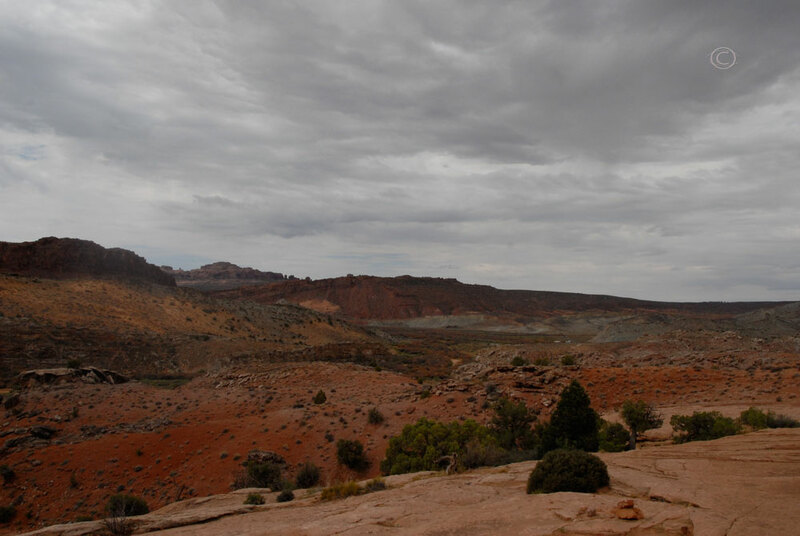 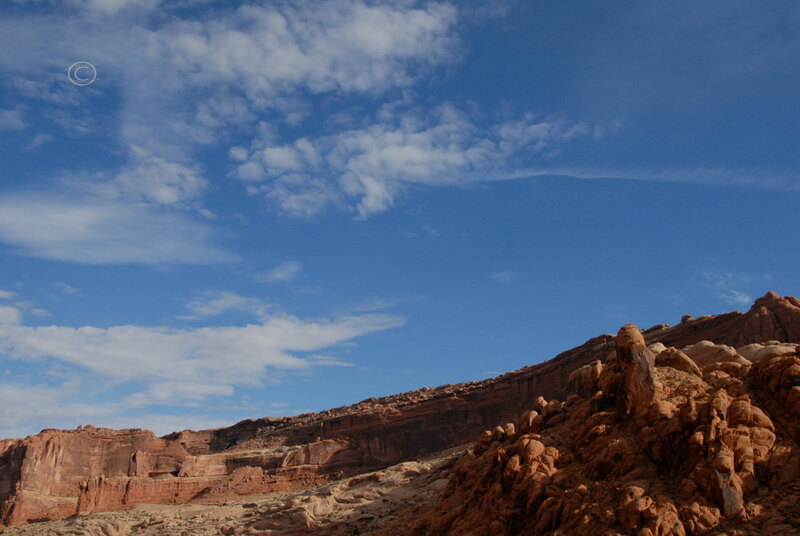 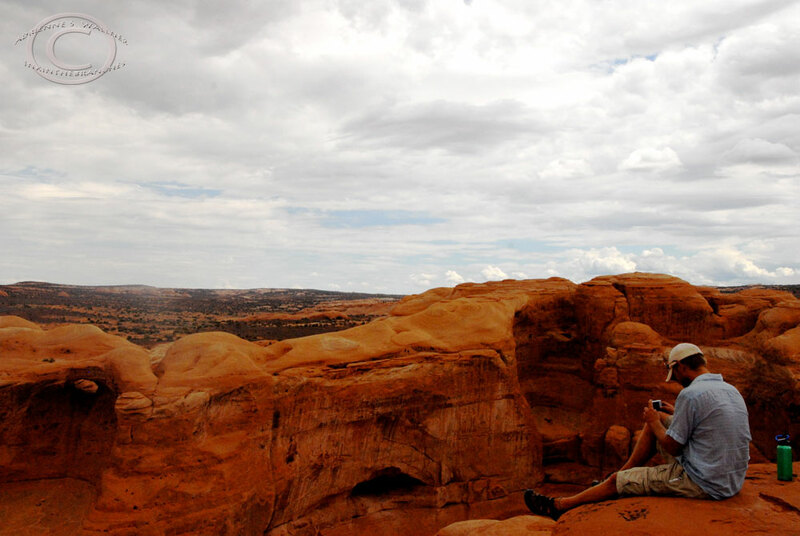 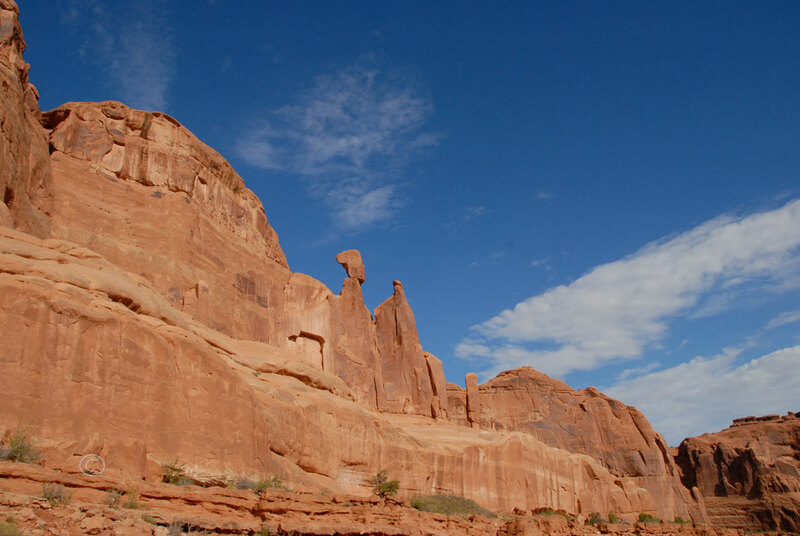 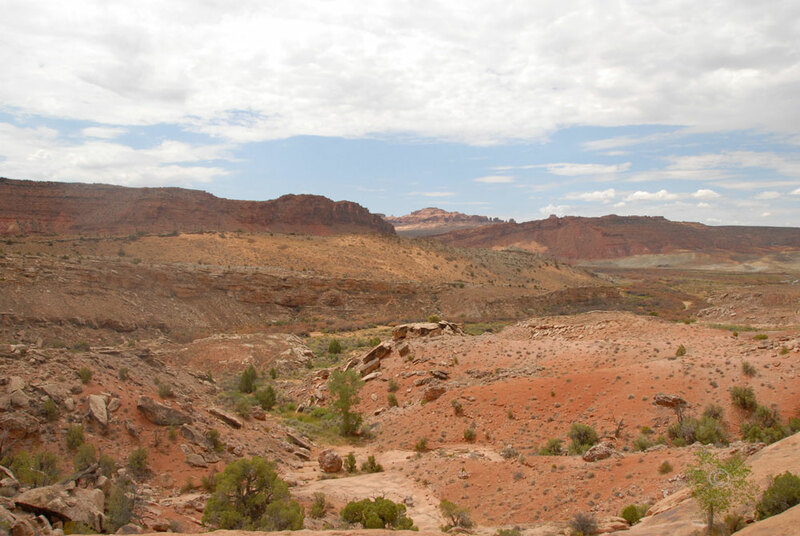 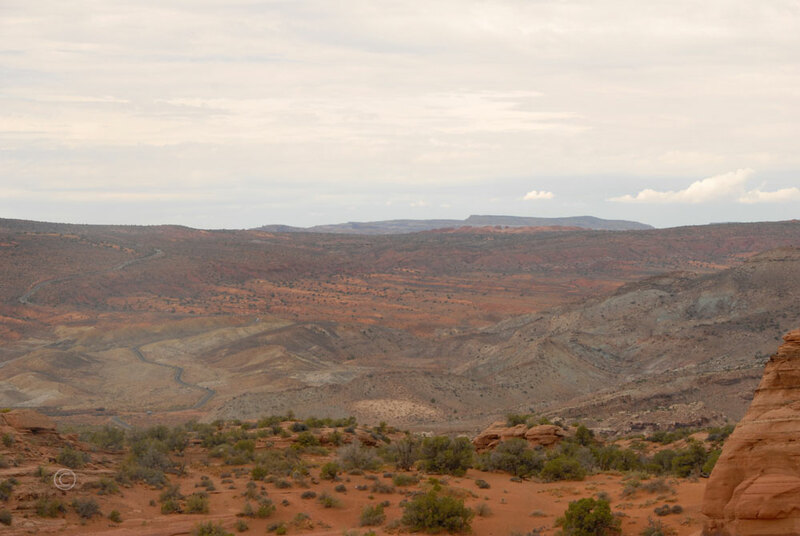 Arches National Park also is home to a collection of Ute Rock Art Petroglyphs. 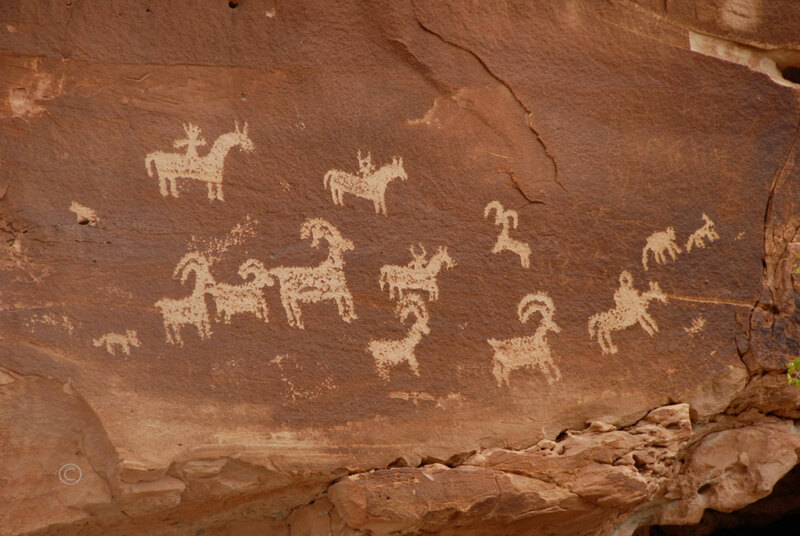 Carved sometimes between A.D. 1650 and 1850, the Native American rock art depicts horses and riders as well as some dog-like animals and big horn sheep. 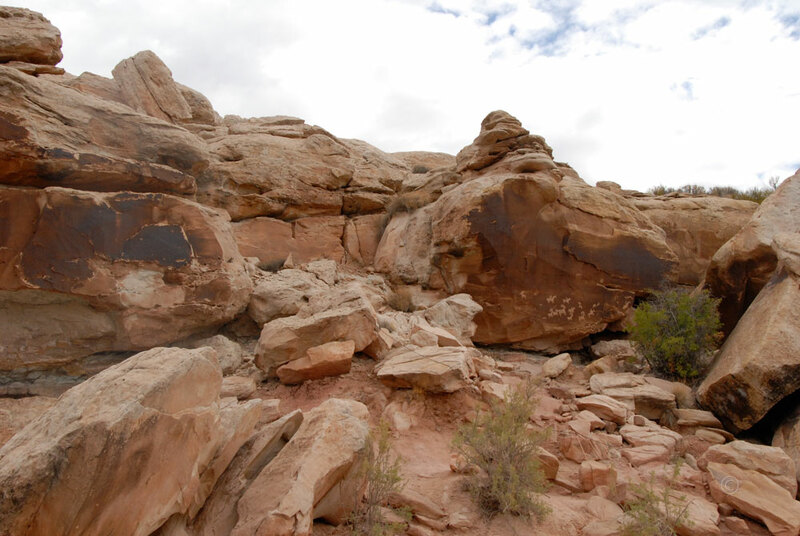 As we hiked, we surveyed the ground and surrounding rocks for other finds. 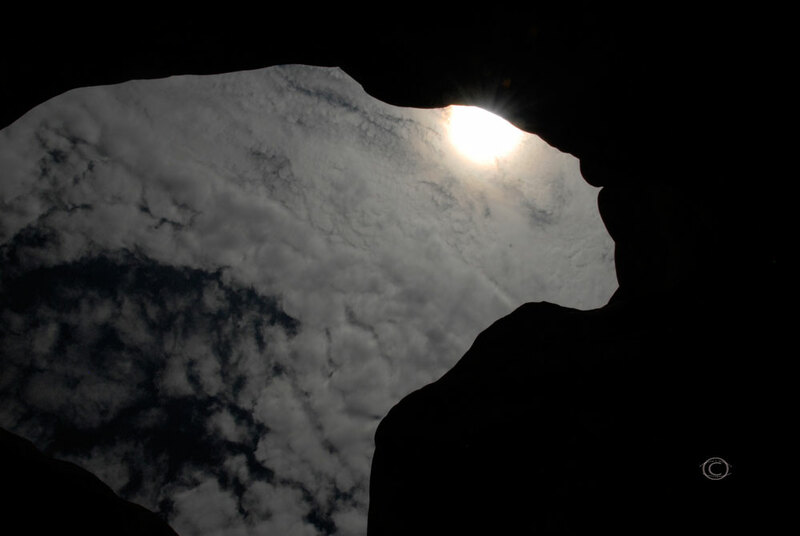 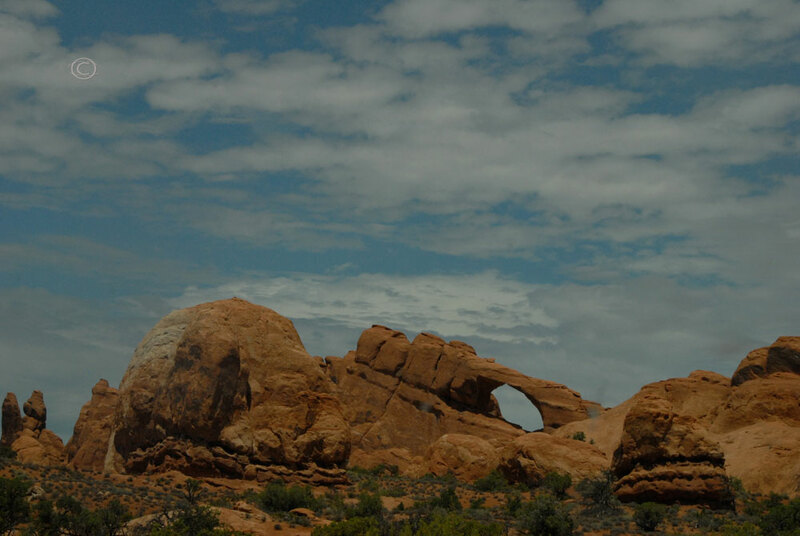 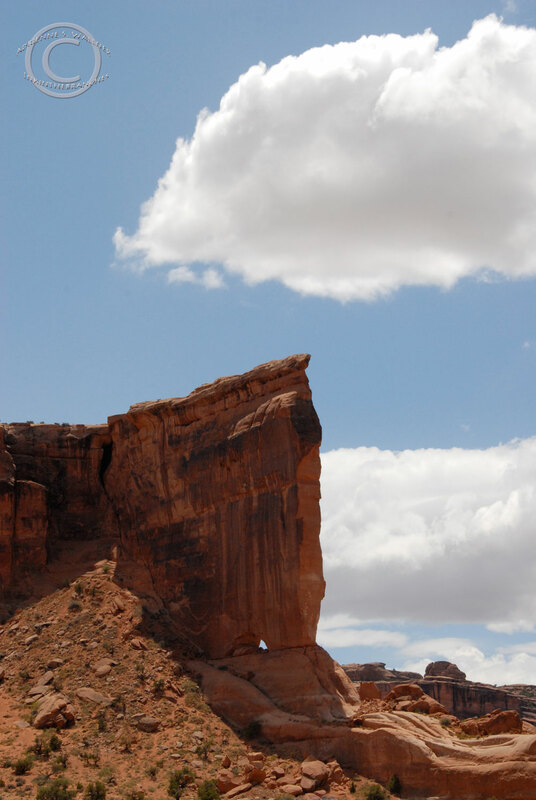 Arches National Park or the face of the Moon? 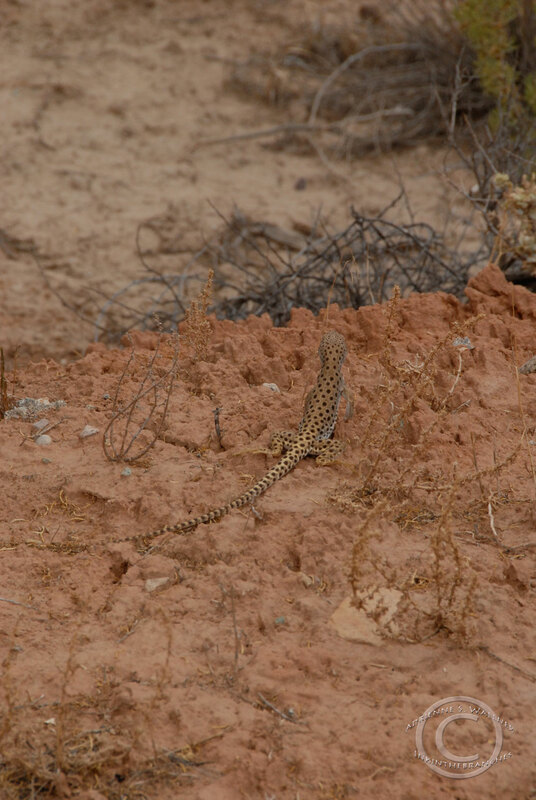 Our careful investigation was rewarded with an animal we wanted to see, but only from a safe distance…a rattle snake. 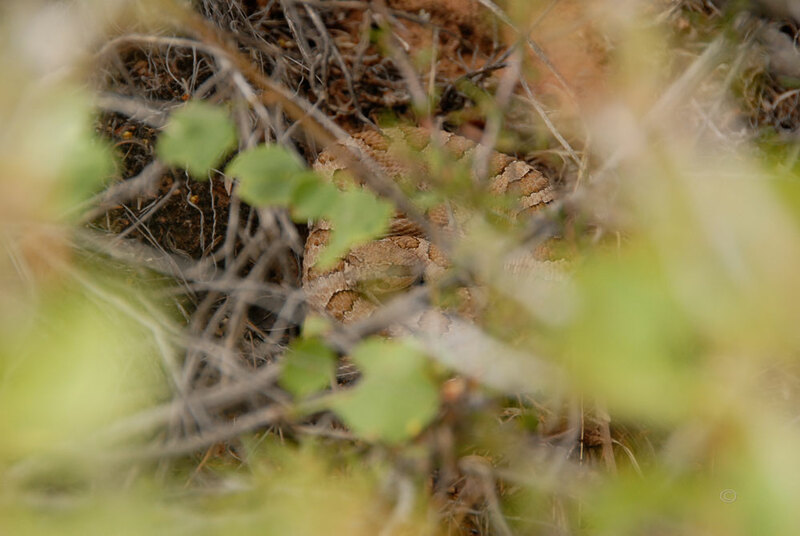 A small subspecies of the Western Rattlesnake, the Midget-faded Rattlesnake has extremely toxic venom, though only one-third of all bites incur full venom. 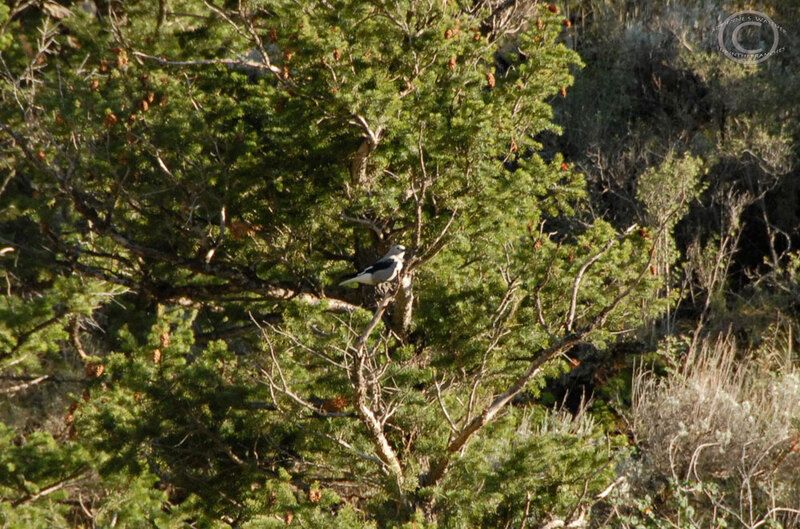 In how difficult it was to get a good picture without getting too close, you can see how easy it can be to miss these awesome creatures. 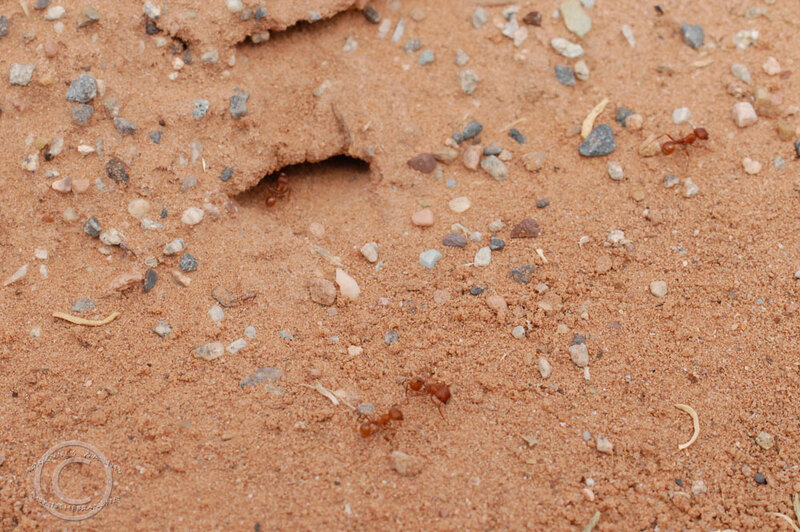 With their excellent camouflage and fierce reputation though, I’d most certainly rather be actively looking for them than surprised by their arrival. 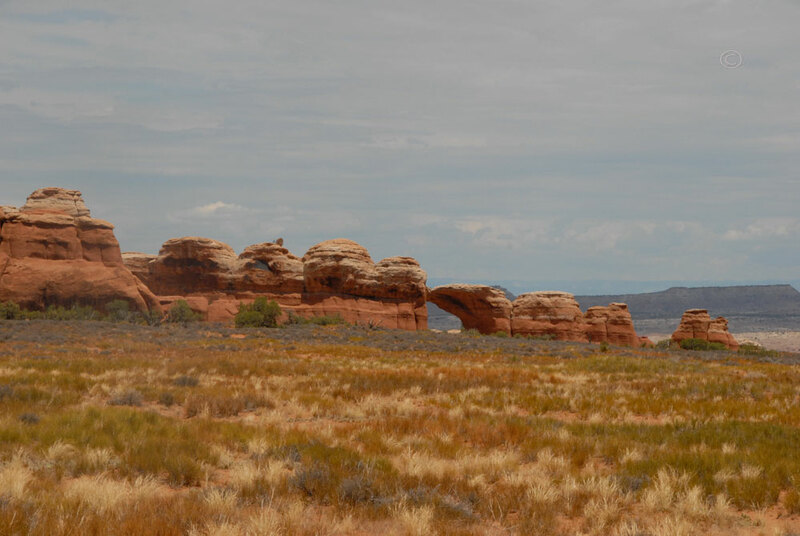 It was about 1:30 pm and 85 degrees when we headed for the Delicate Arch Trail. 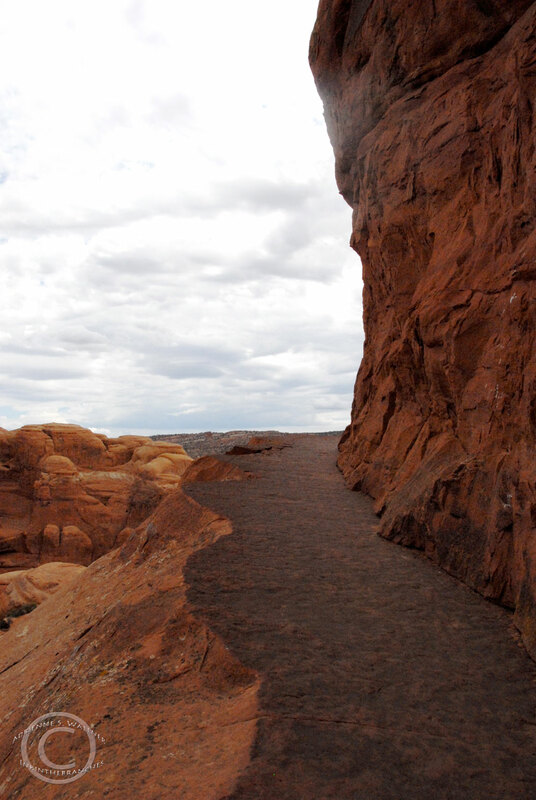 The trail is well-traveled and easy to follow, though often crowded. 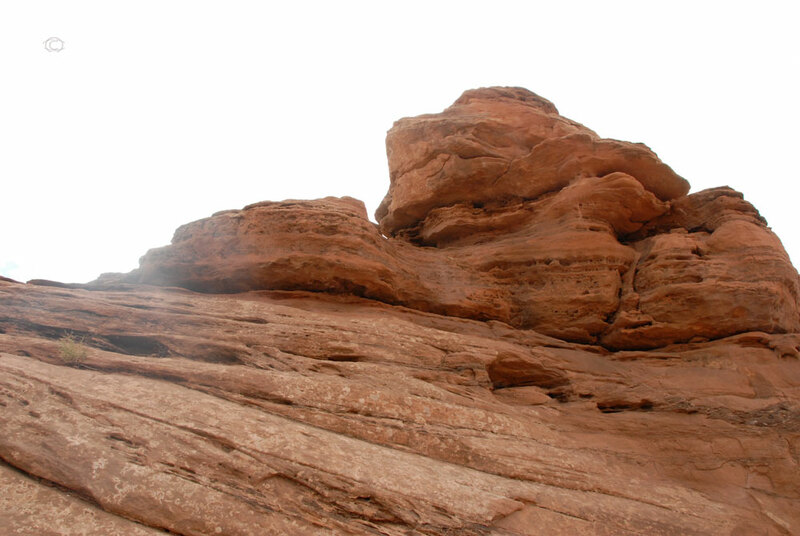 We hiked to the base of a large, smooth sandstone hill (known as slickrock) and began to climb up. 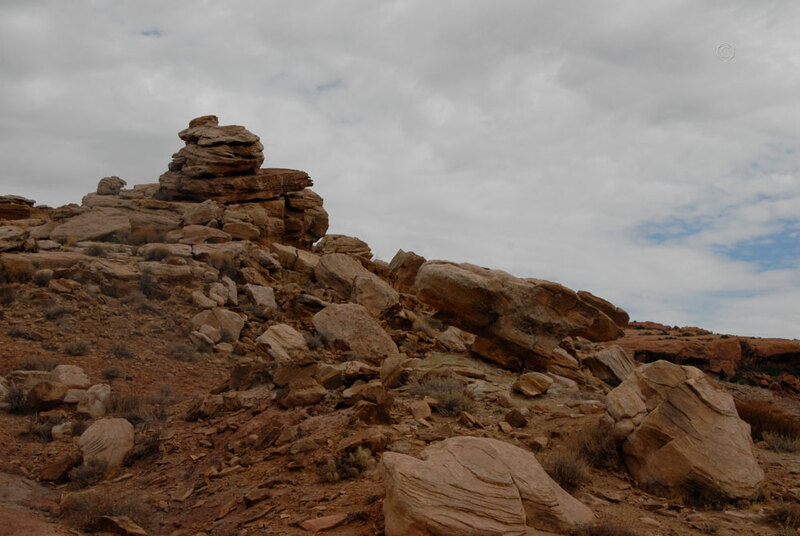 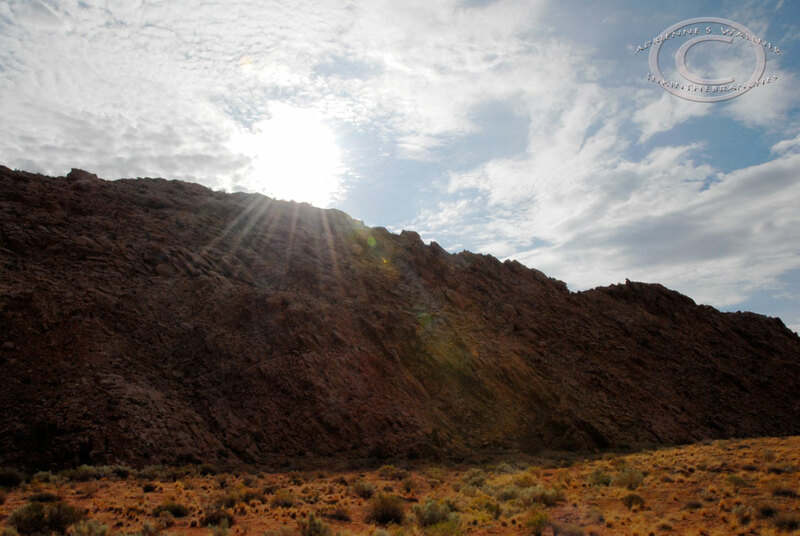 The trail is then denoted by cairns, or stacks of stones that led us over the slickrock. 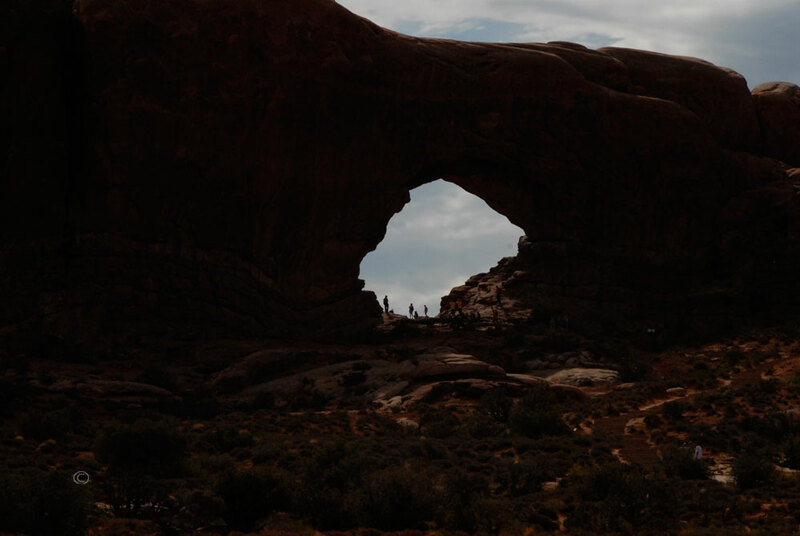 The trail culminated with a 200-yard sandstone ledge that wrapped around the curved rock walls and ended at the Delicate Arch. 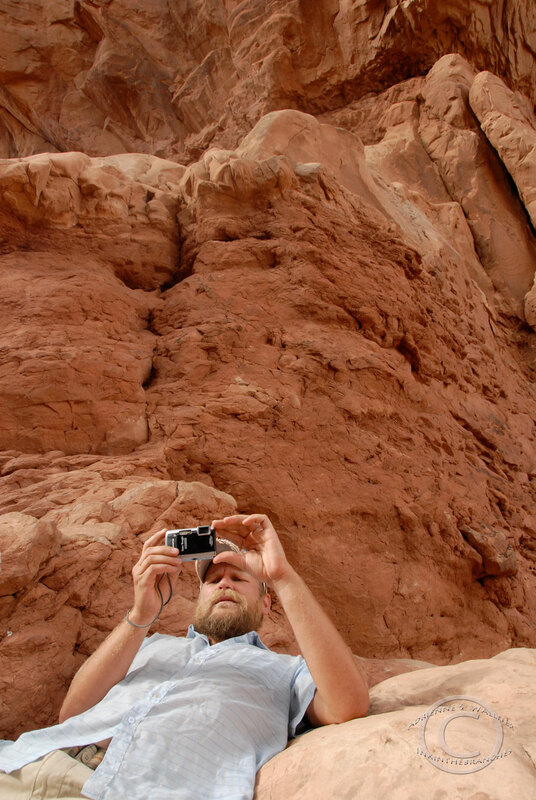 D setting up a photo. 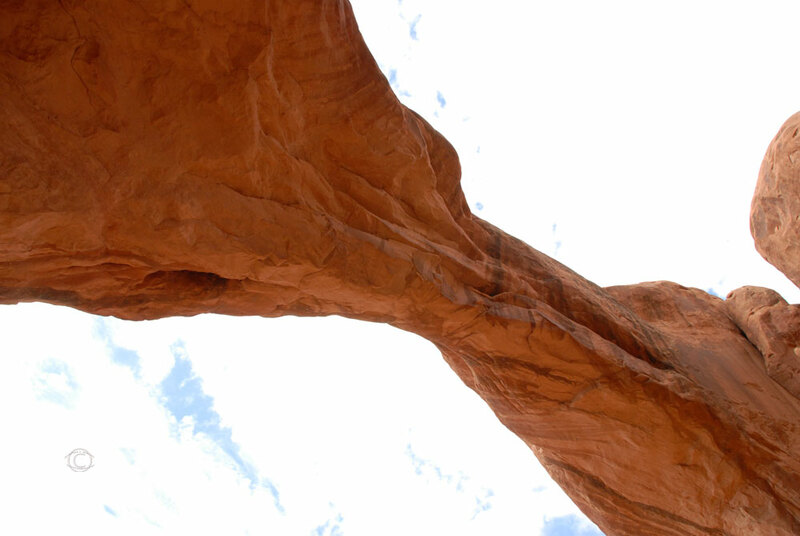 Arching 80 feet overhead, Delicate Arch is probably one of the most well-know arches in the park. 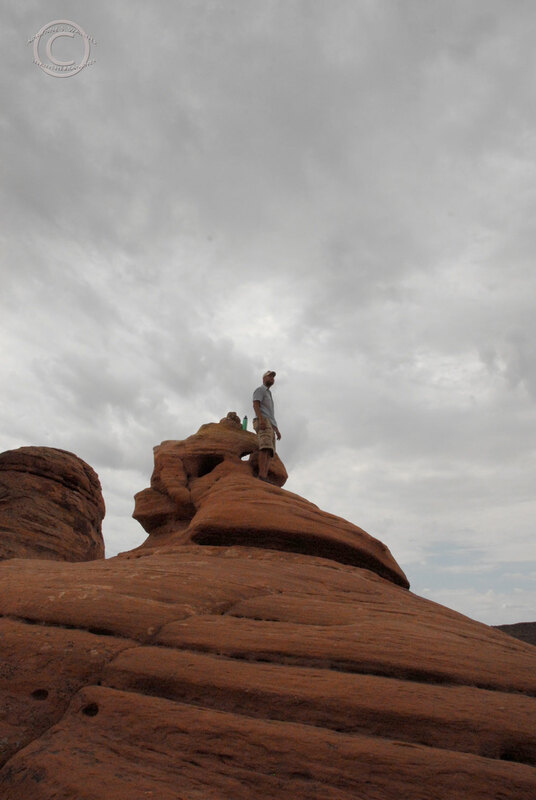 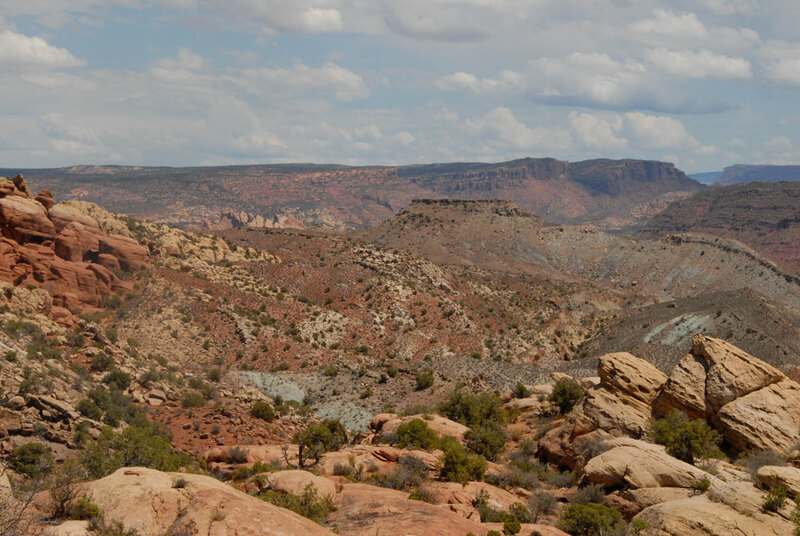 After taking some time to enjoy the view and climb around on the slickrock, we headed back down the trail. 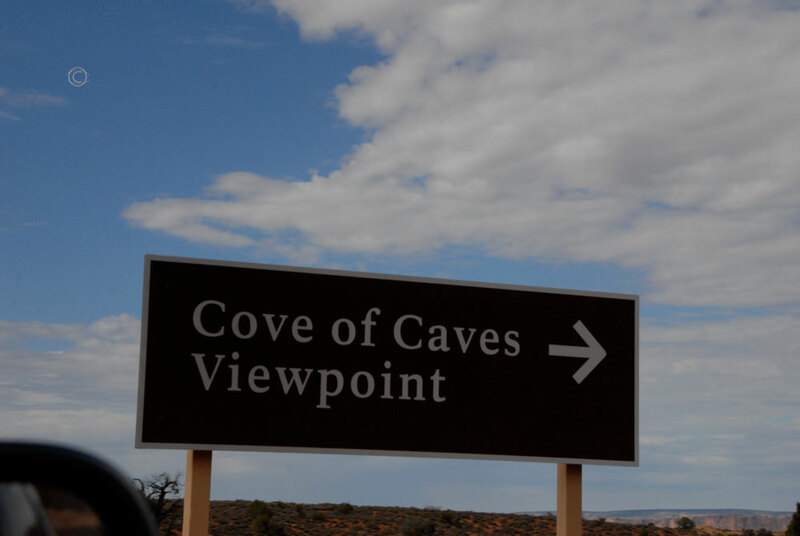 We took one last drive through the spectacularly unique scenery, visited a few more rock structures, and headed on our way. 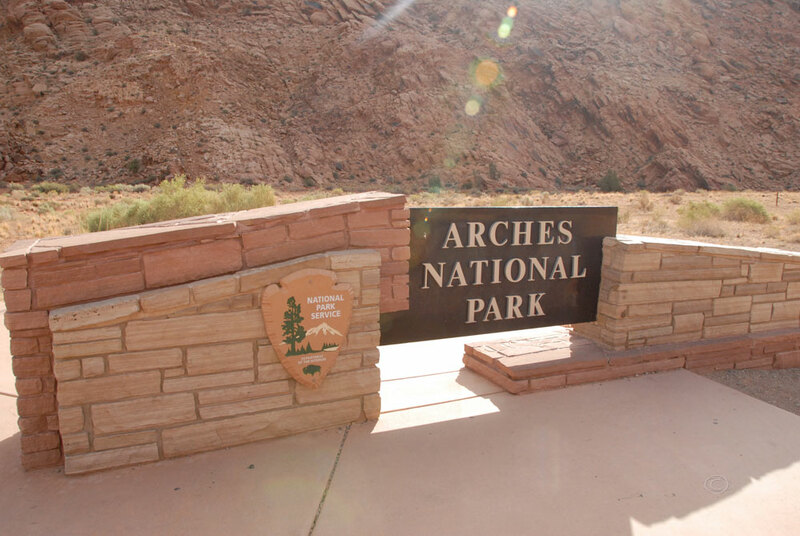 Arches National Park is perched above the Colorado River, and as we perused our maps, we realized that we would essentially be following the path of the river to get to our next and final destination on our trip, Rocky Mountain National Park. 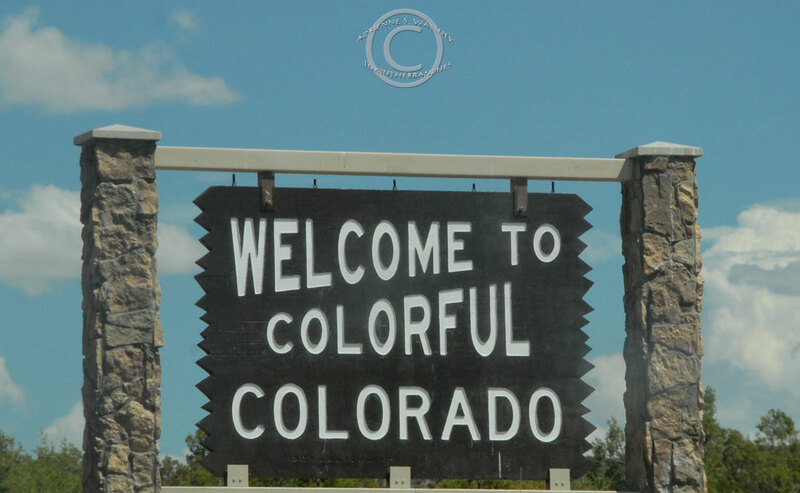 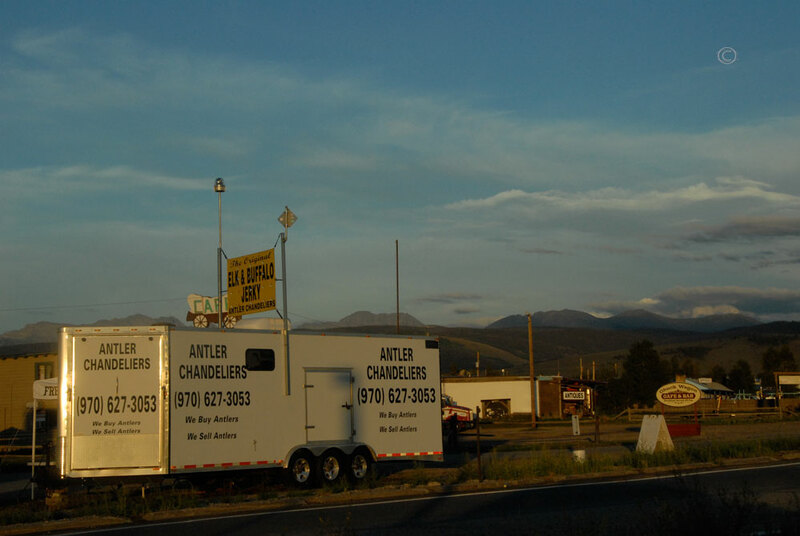 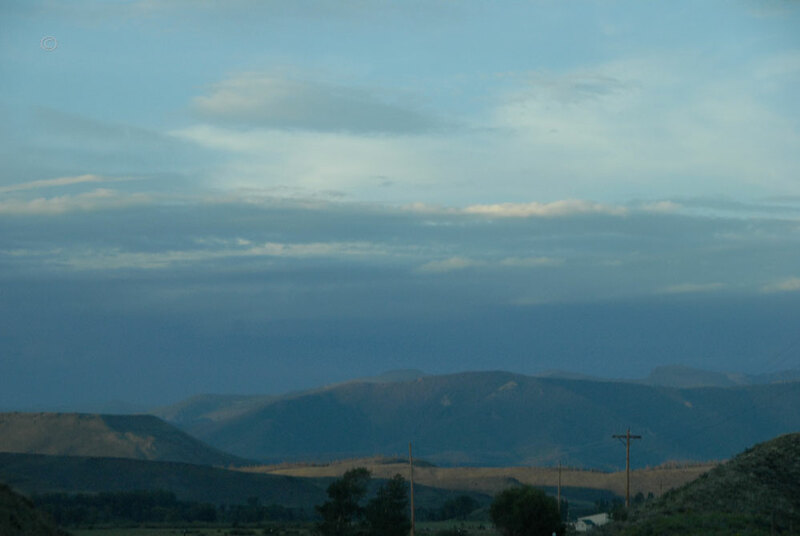 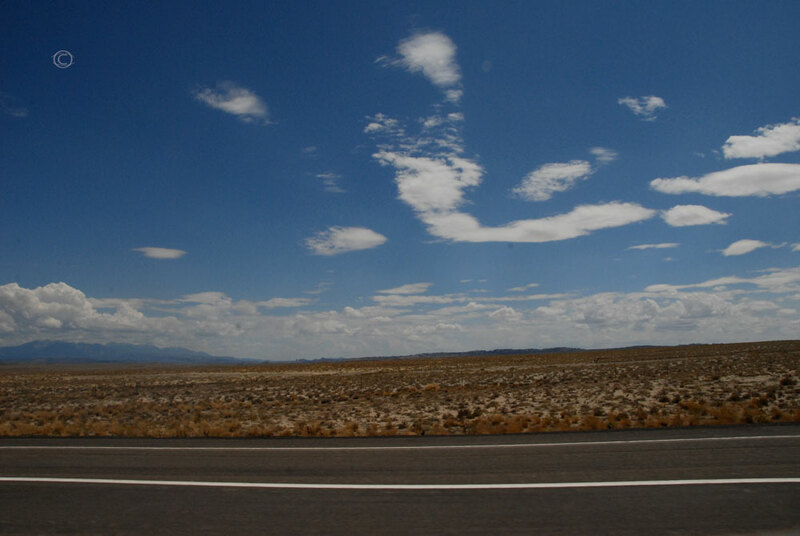 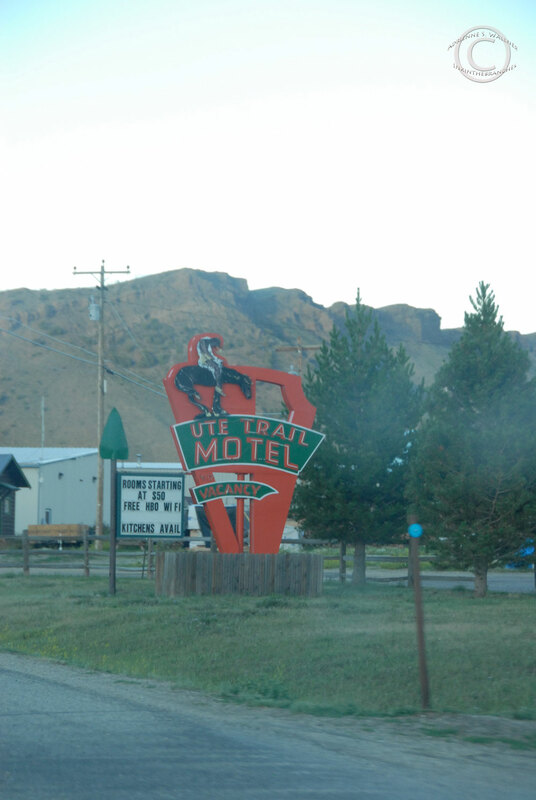 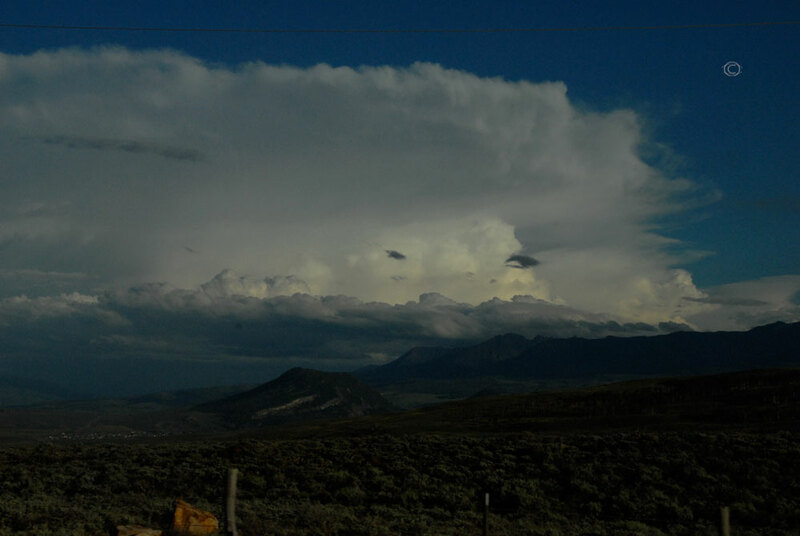 We headed northwest on Hwy 70 toward to Colorado state line. 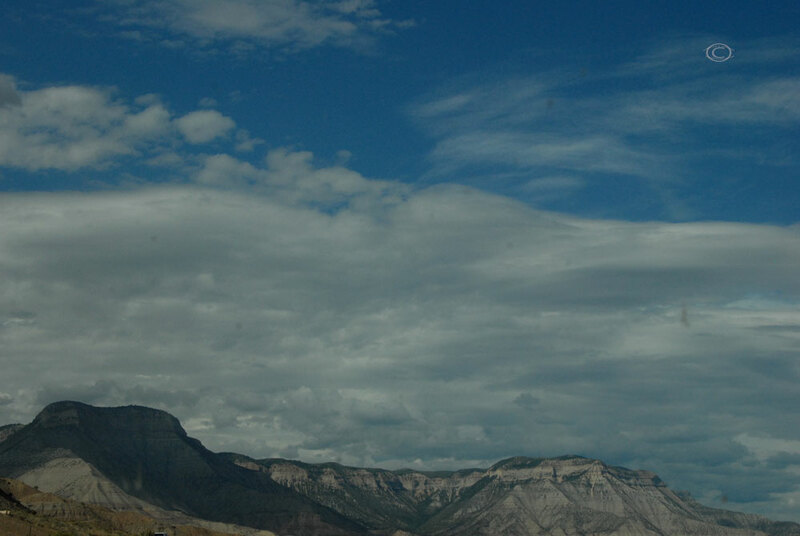 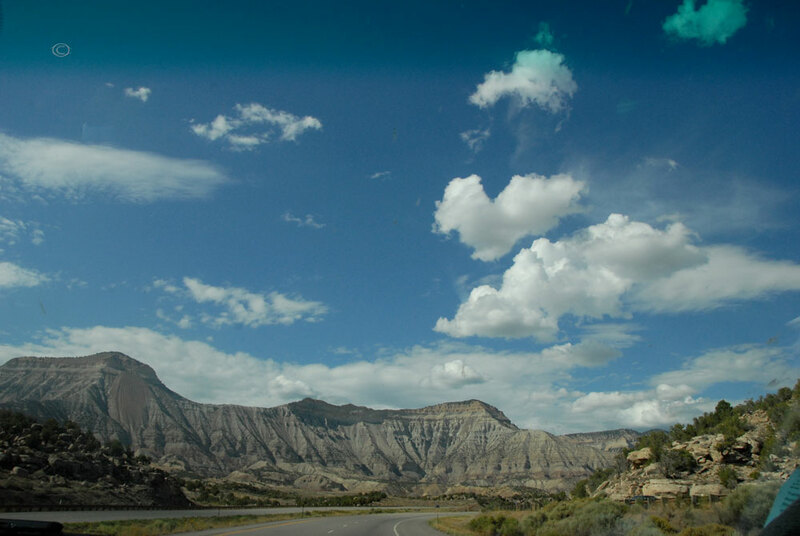 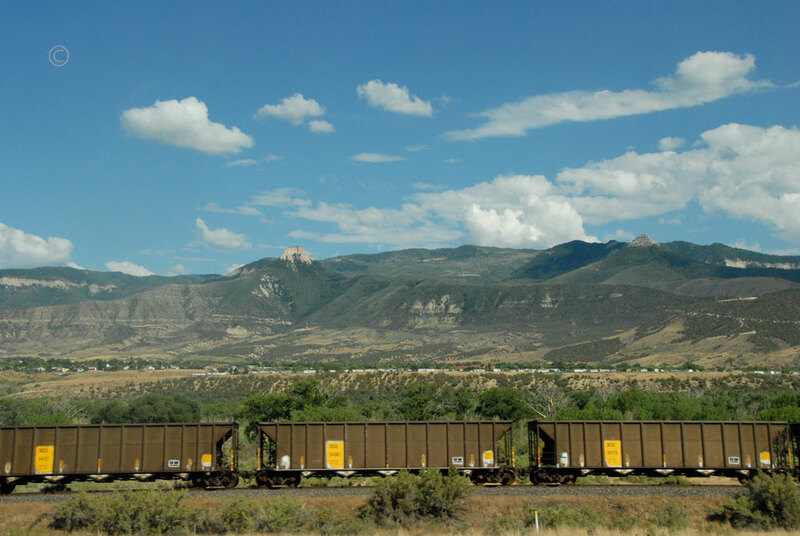 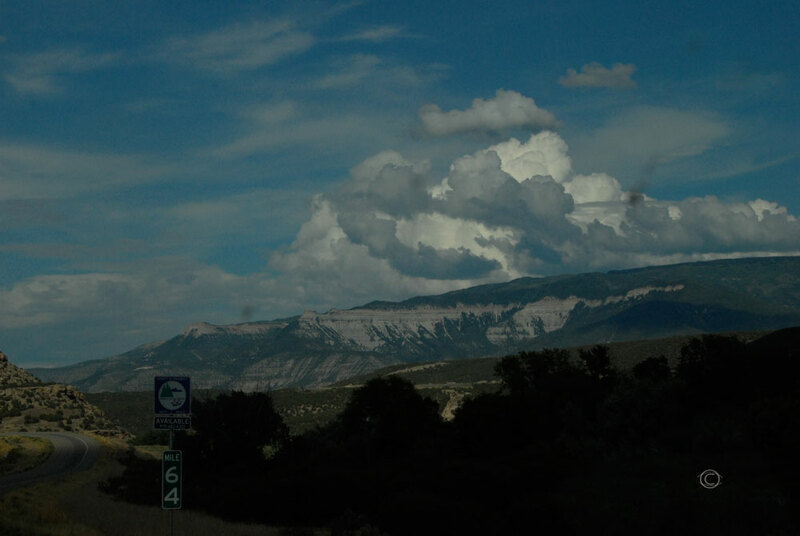 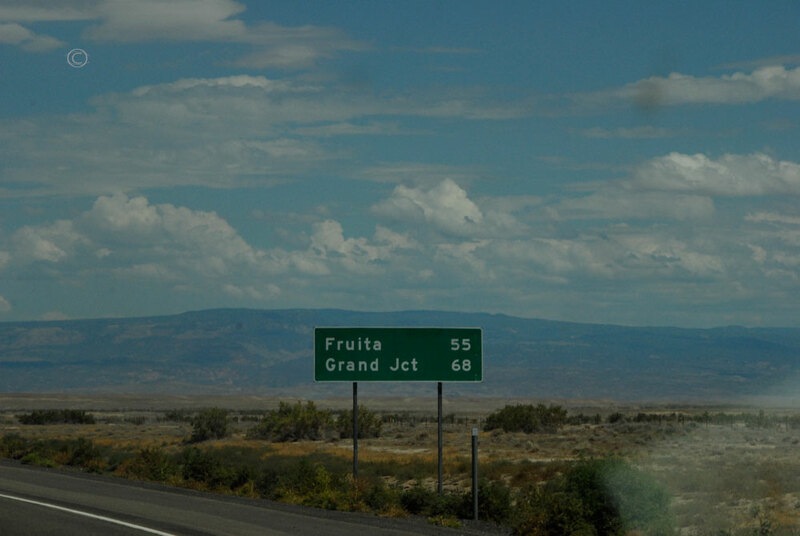 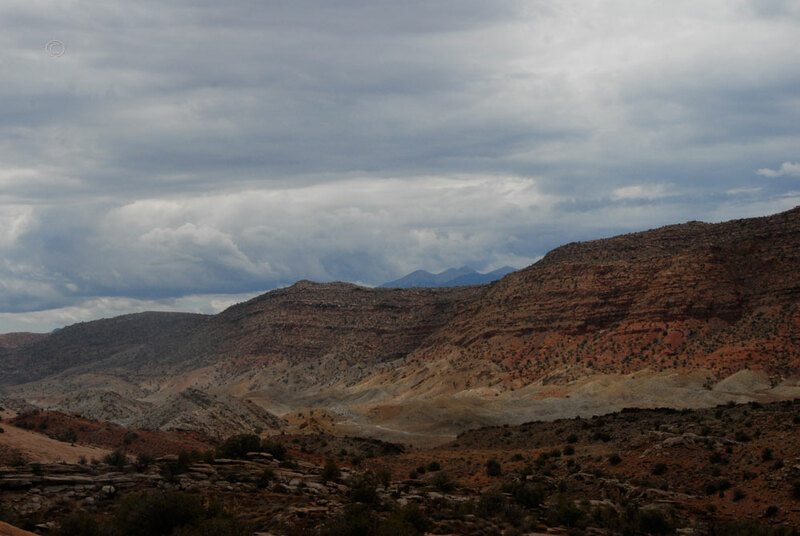 We continued through on Colorado Hwy 6 through Fruita and Clifton. 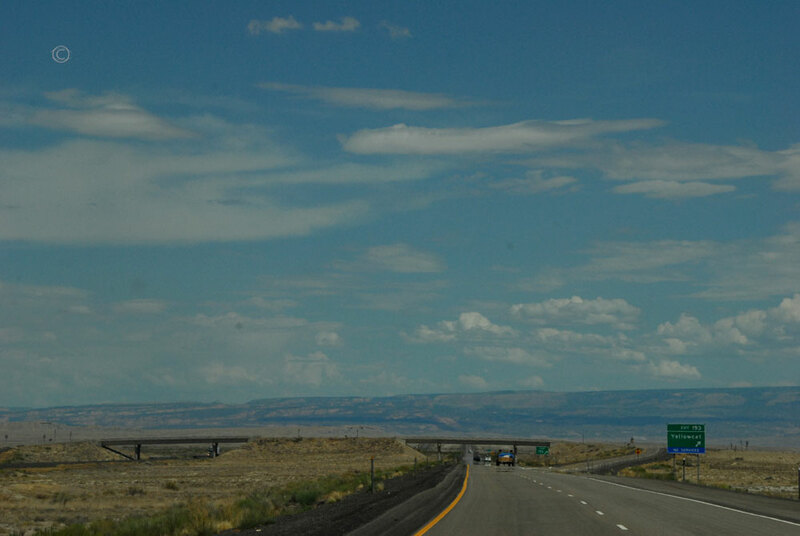 We followed Hwy 6 for a while before consulting our maps again. 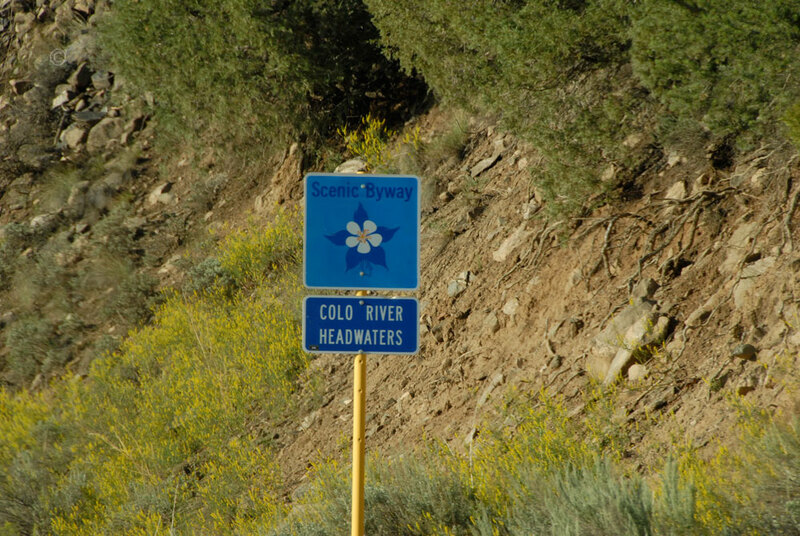 We decided that we really could just follow the Colorado River to the park, and turned off of the highway at Wolcott and headed north on 131. 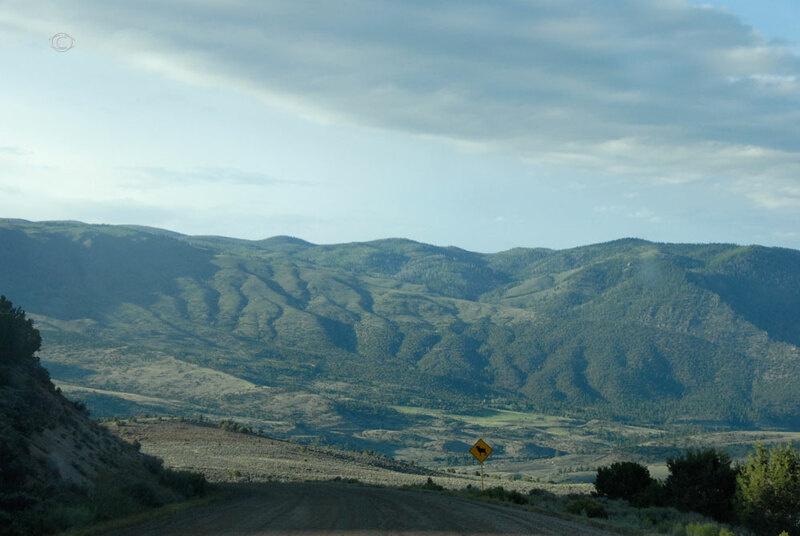 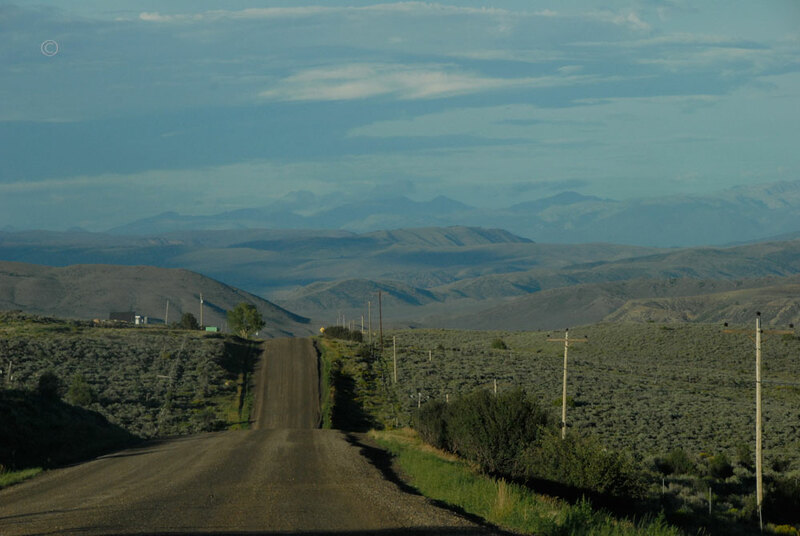 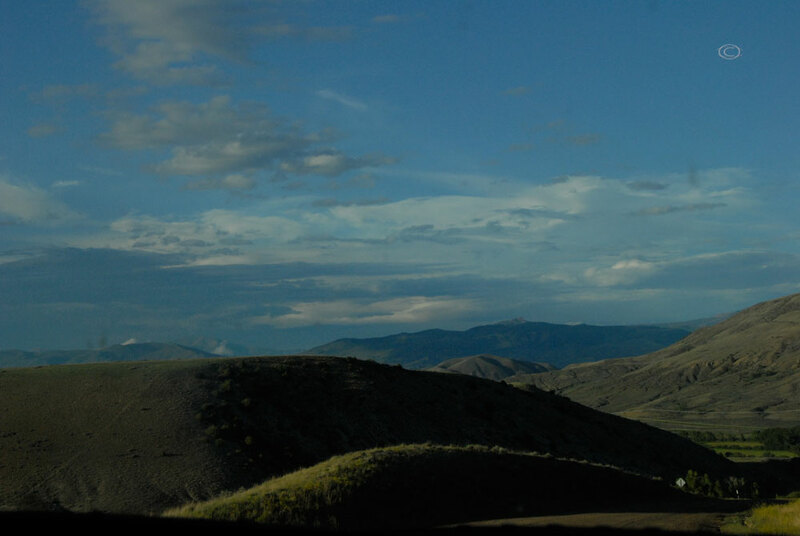 Driving the dirt road through the rolling tree-covered hills, we marveled at the lush green grasses and trees and the silver-grey mountains. 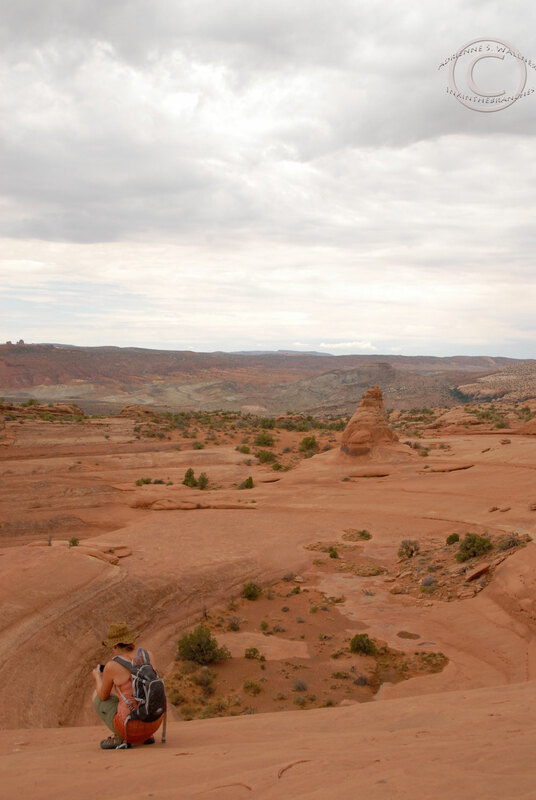 Like most things, you don’t realize how much you appreciate something until you are without it, and place is no exception. 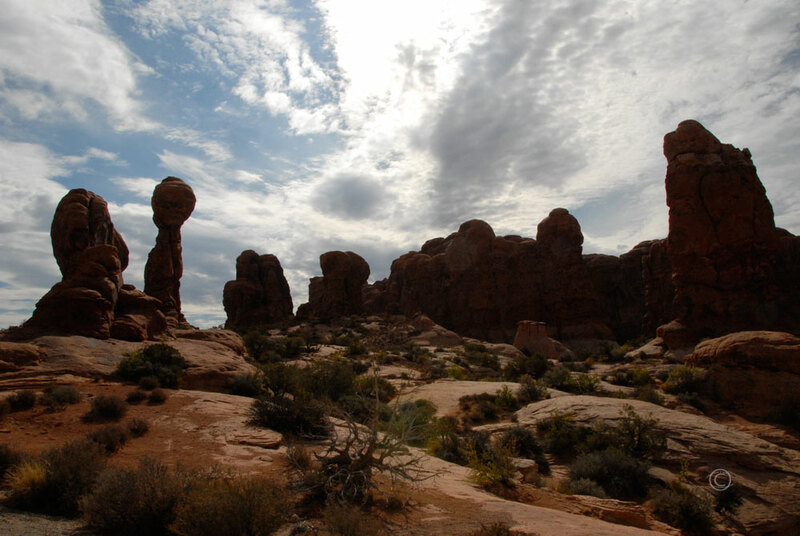 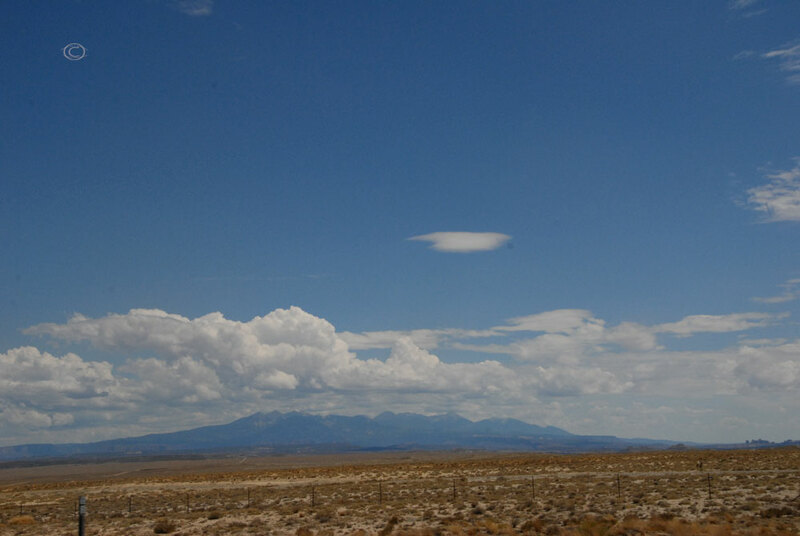 We had been in the desert for so long it seemed, we did realize how much we had missed the forest and mountains. 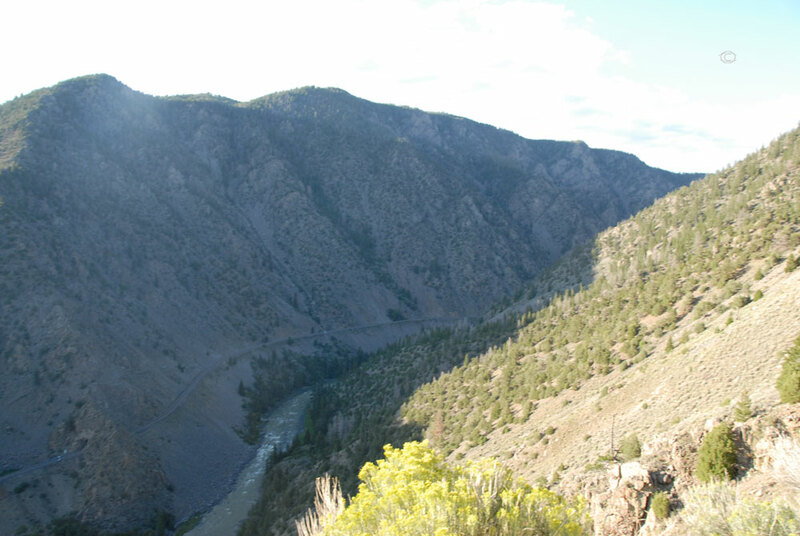 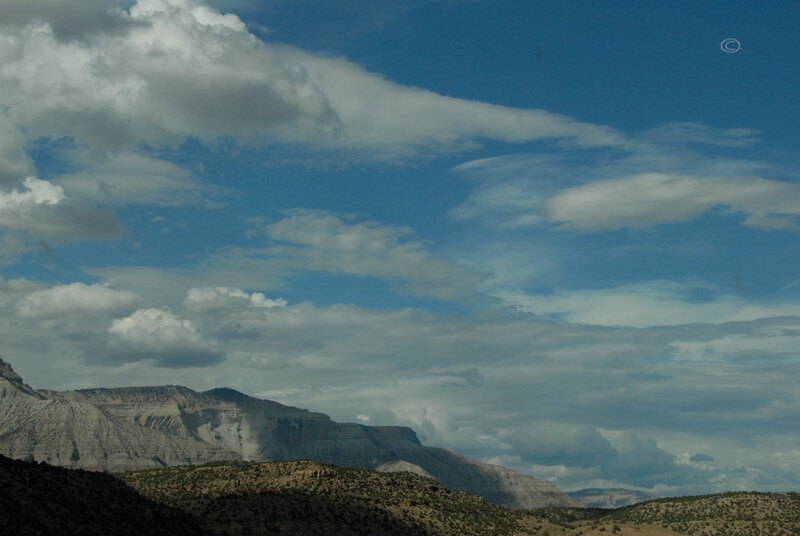 We twisted and turned through the mountains and valleys, the mighty Colorado River as our guide. 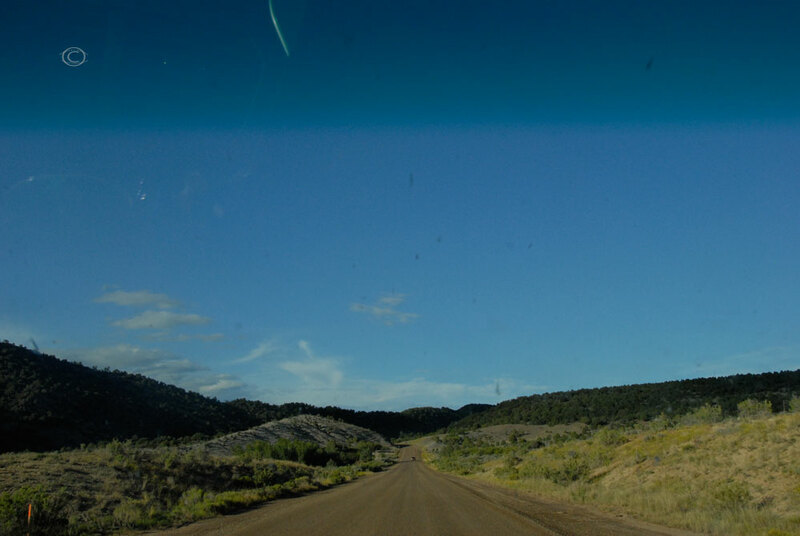 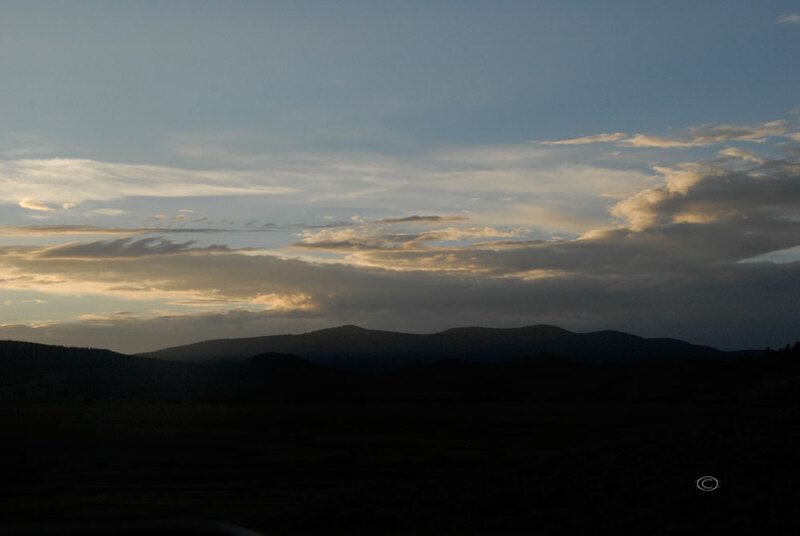 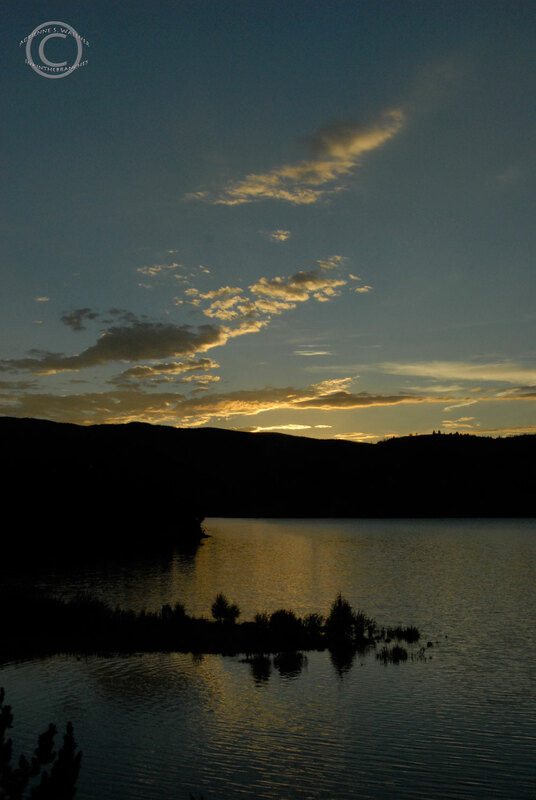 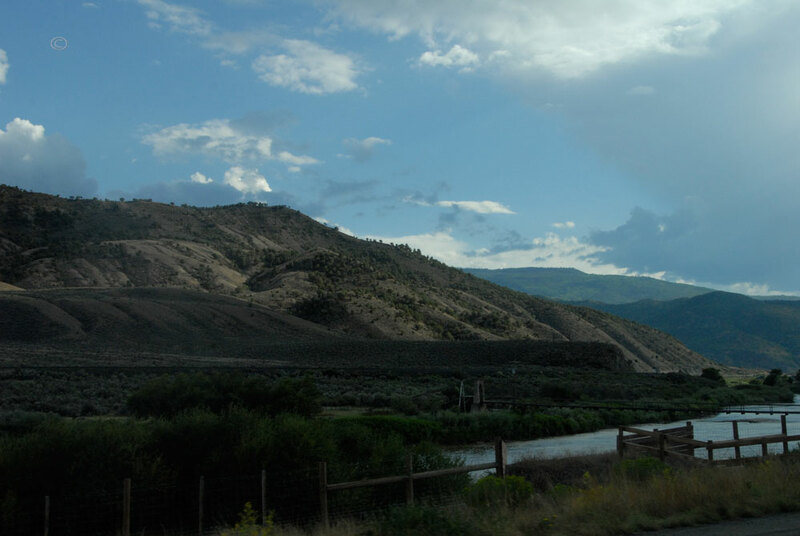 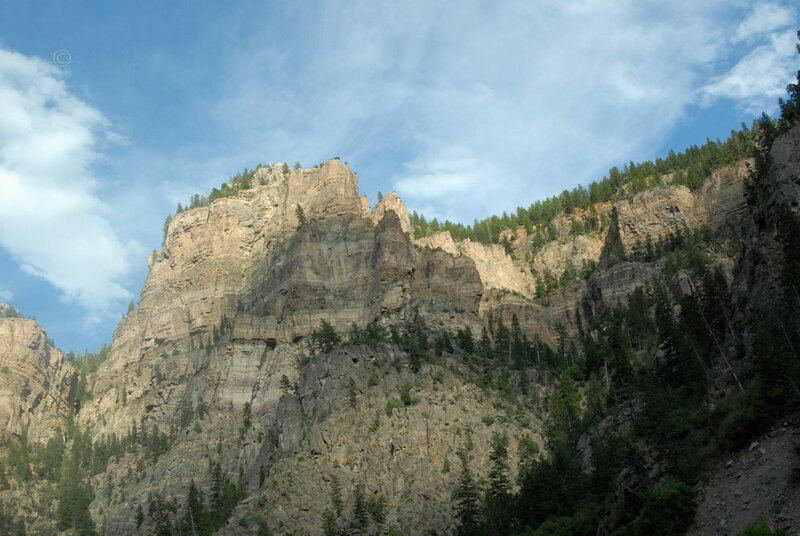 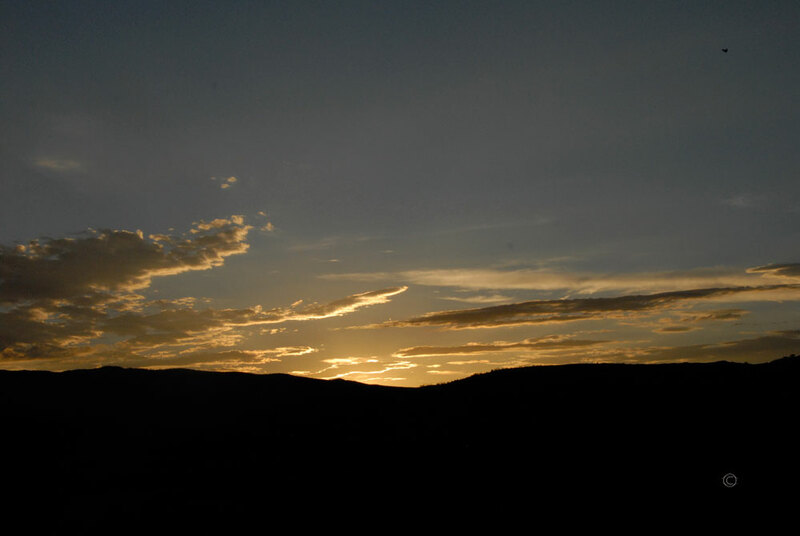 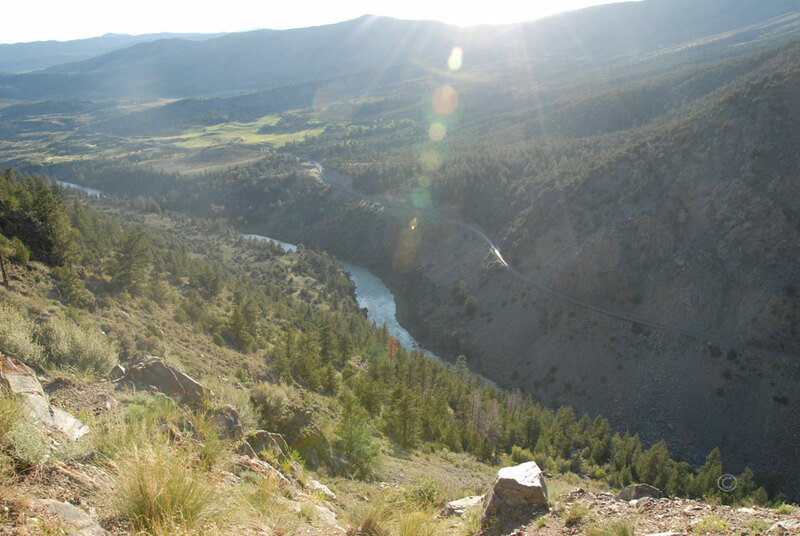 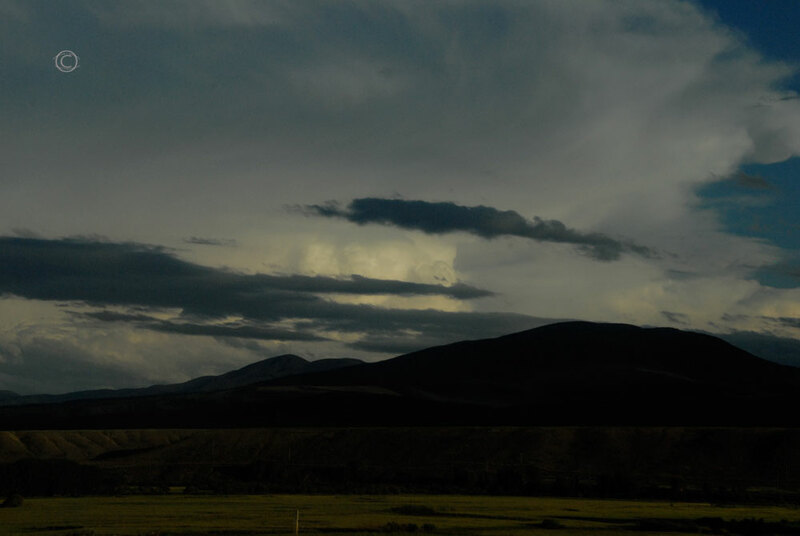 Around 8:00 pm, we entered Arapaho Recreation Area and camped at Willow Creek Campground. 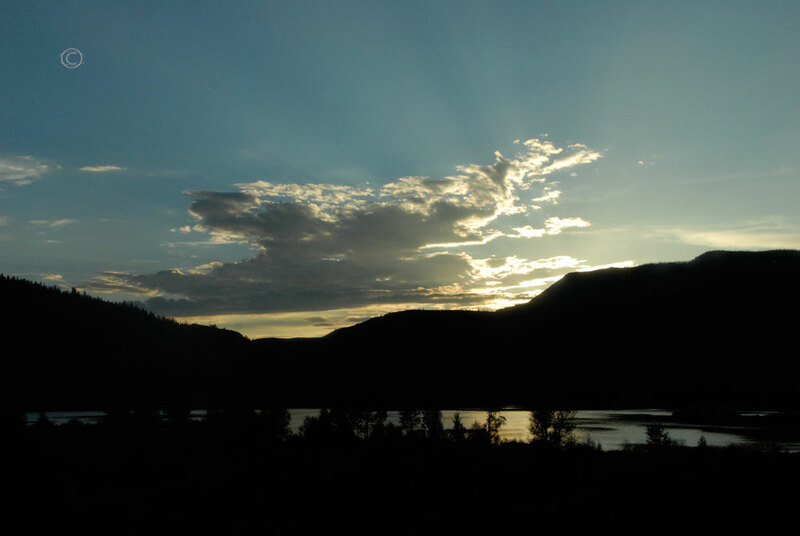 The sun was setting as we pulled into the campground and made camp. 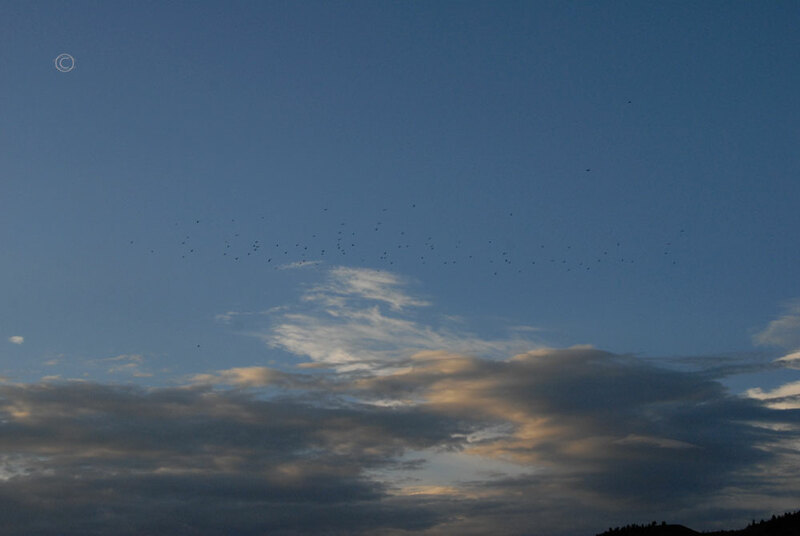 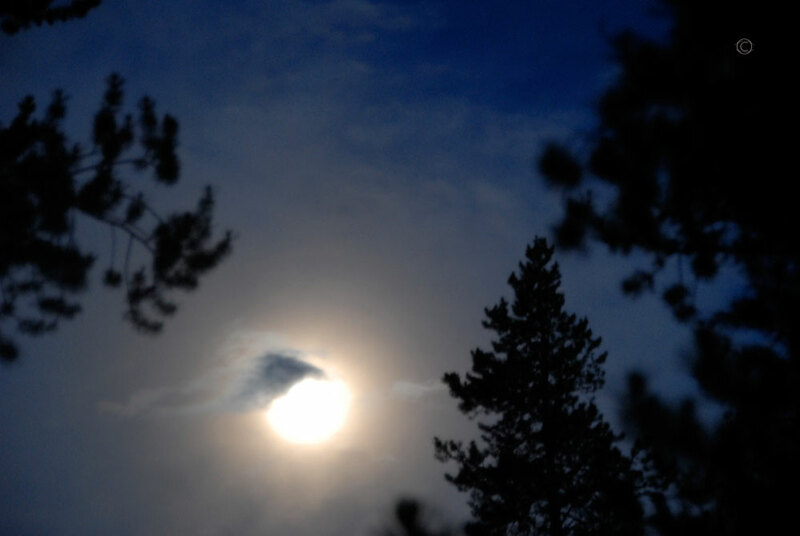 The moon looked to be almost full and shown brightly on us as we prepared dinner. 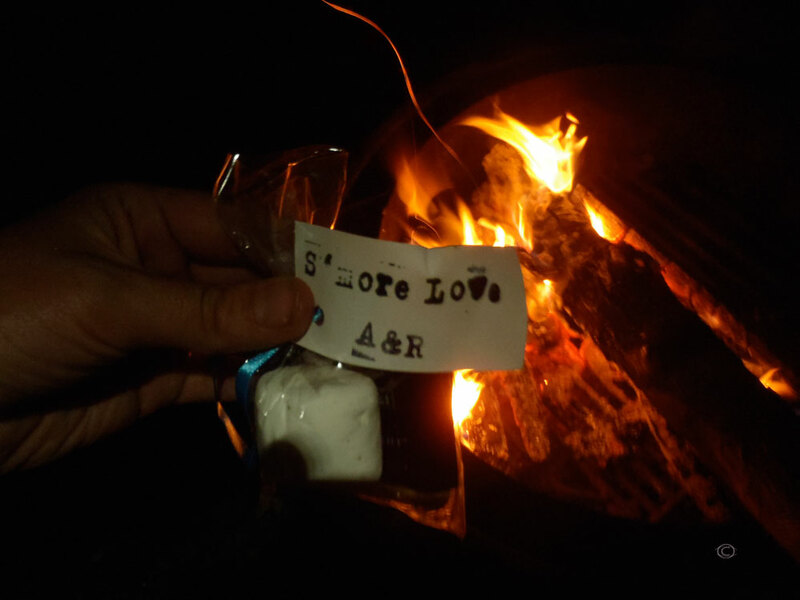 which were followed by scrumptious s’mores (thanks Ava & Rob!) 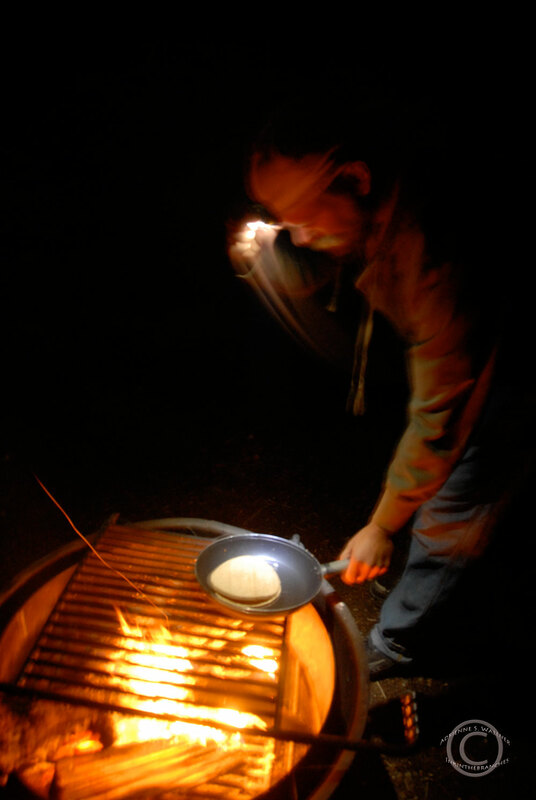 to top off the night. 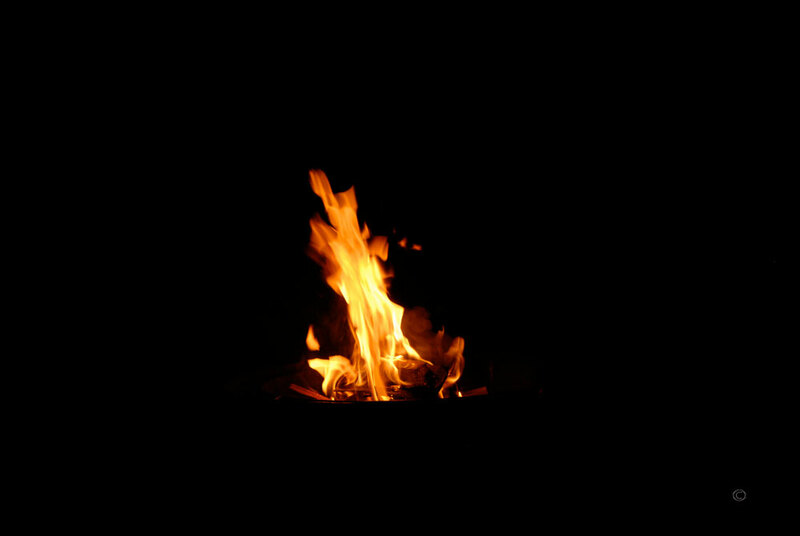 We sat mesmerized by our campfire late into the night, knowing full well that this was going to be our last night in a tent on our trip. 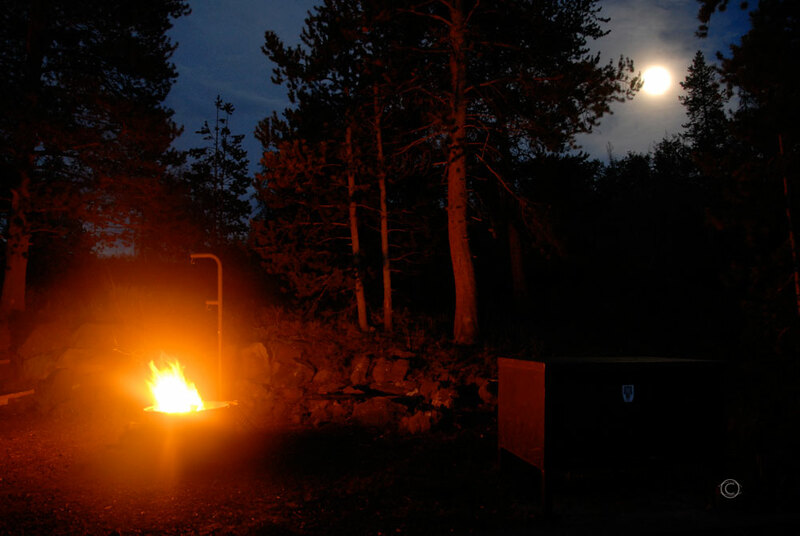 We held onto the night until we couldn’t keep our eyelids open, then climbed in to our trusty tent that had provided us with so many nights of restful sleep in the great outdoors these last few weeks.